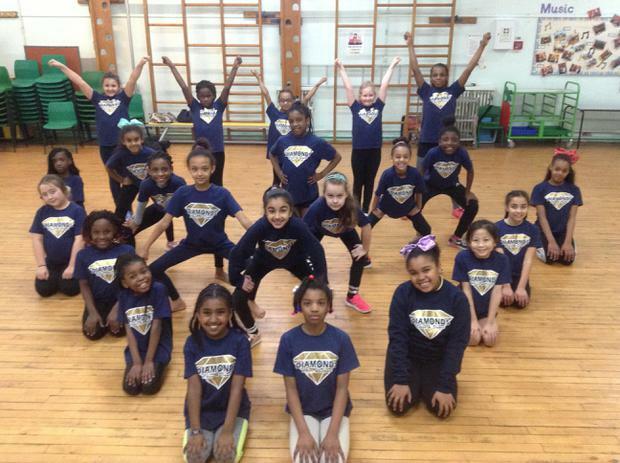 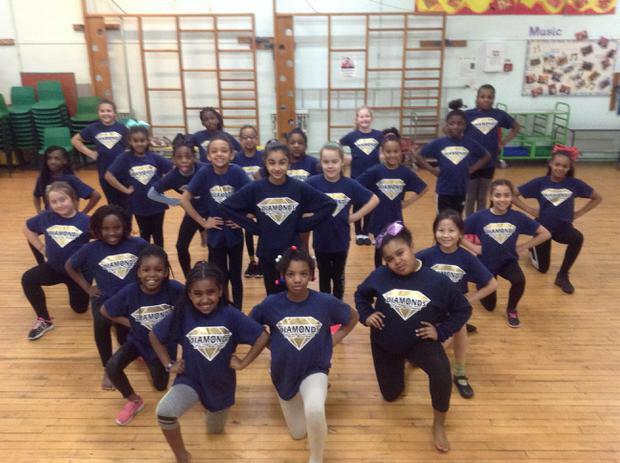 Our very own STOC Diamonds cheerleaders came first place in KS2 Level 1 Pom dance this weekend. 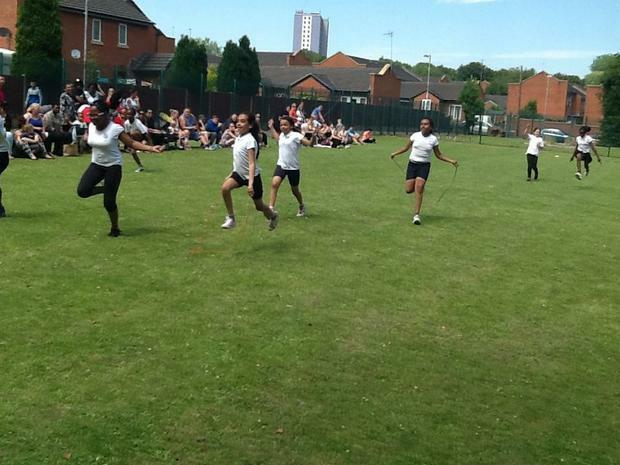 Mrs Grosvenor and Miss Hearldon are very proud of the girls hard work! 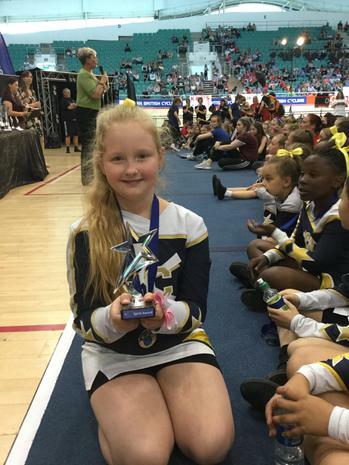 This is "STOC Diamonds Cheerleaders 2017/18" by St Thomas of Canterbury on Vimeo, the home for high quality videos and the people who love them. 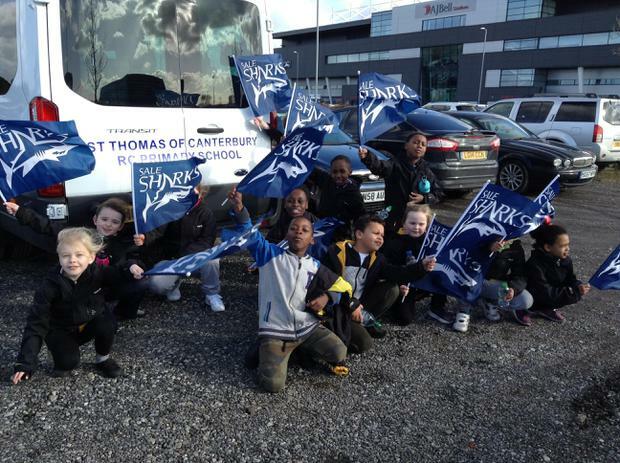 This is "STOC Diamonds Awards" by St Thomas of Canterbury on Vimeo, the home for high quality videos and the people who love them. 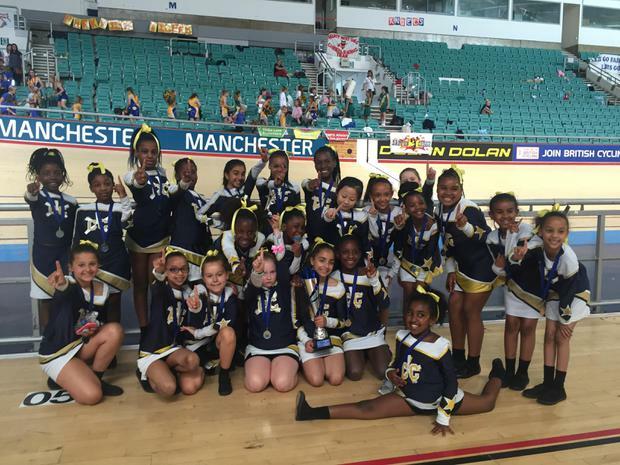 Our school cheerleading team, Diamonds competed at the UKCA Cheerleading schools competition and achieved 2nd place out of 9 other teams. 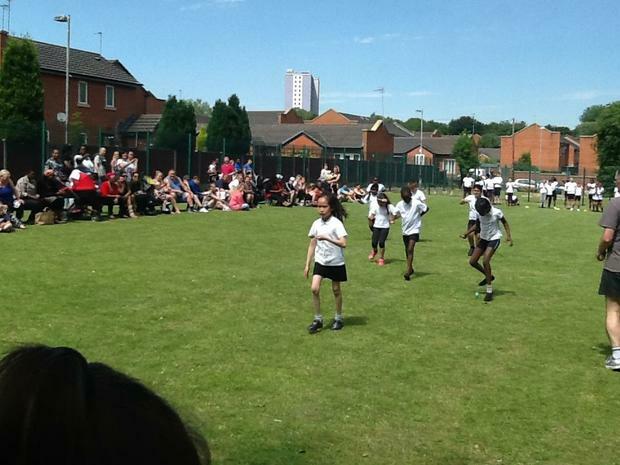 Mrs Grosvenor and Miss Hearldon are very proud of the girls performance. 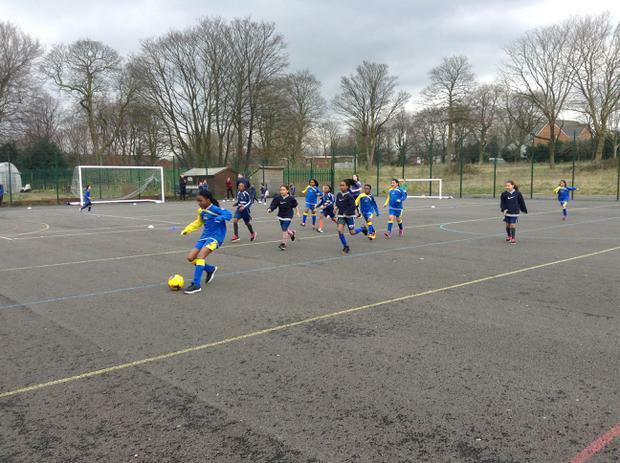 Congratulations to both Year 5 7 a side football teams who placed 1st & 2nd in our recent cluster tournament at All Hallows. 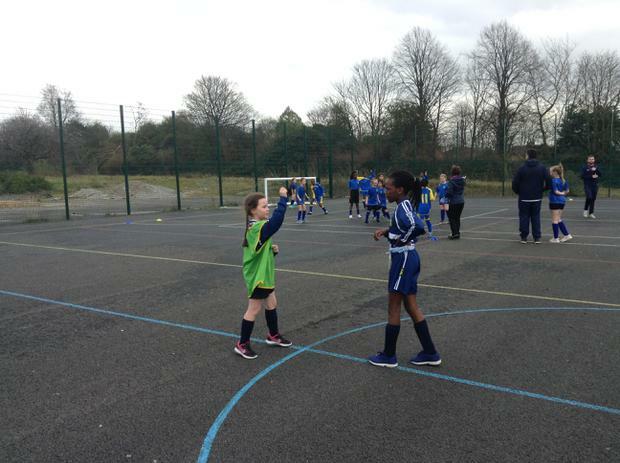 The Y5 girls demonstrated fantastic sportsmanship & professionalism when representing the school, where we qualified to the finals! 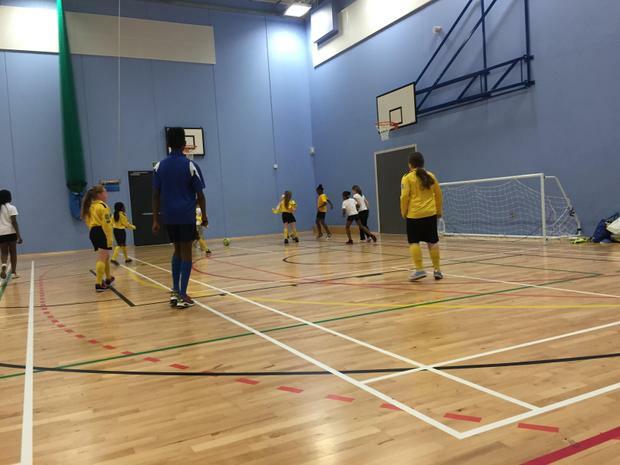 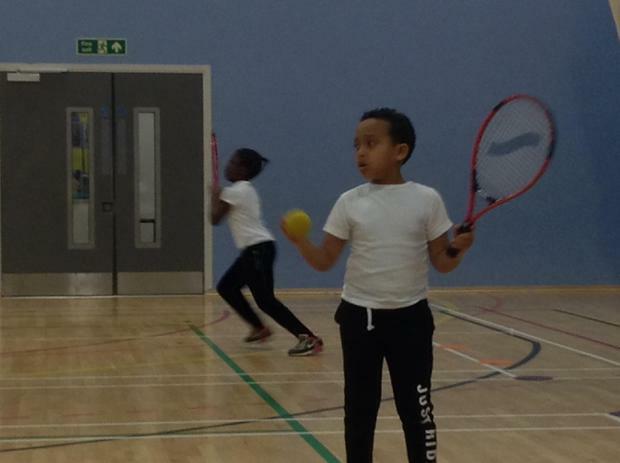 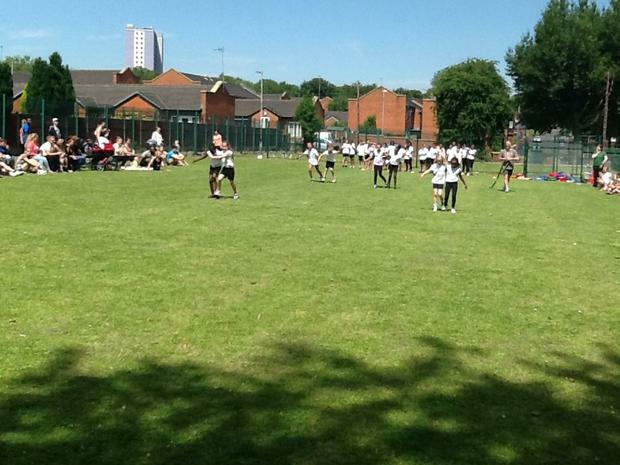 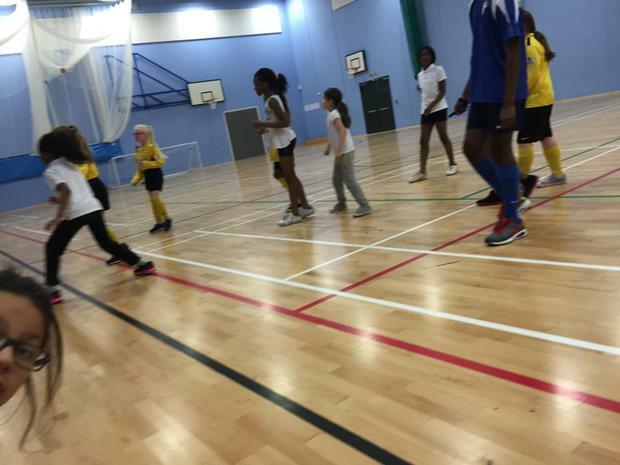 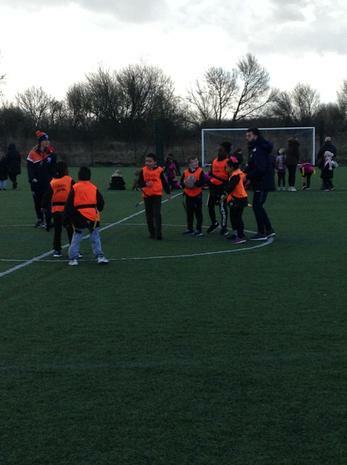 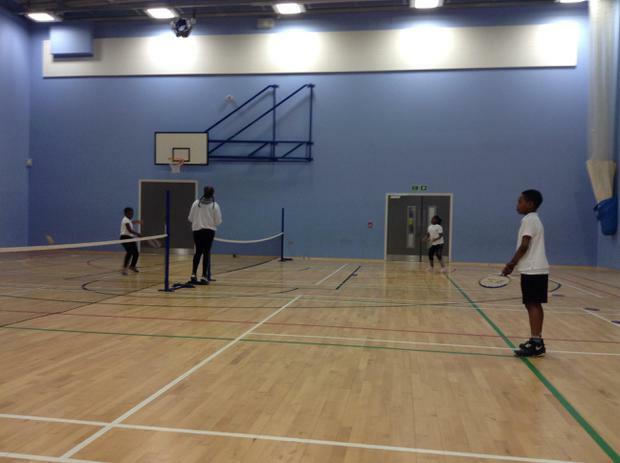 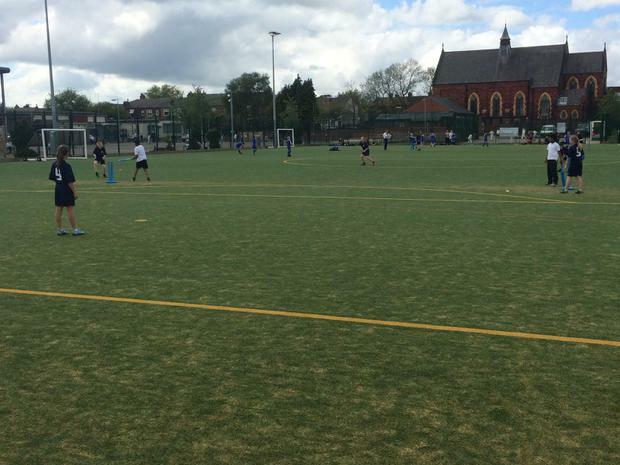 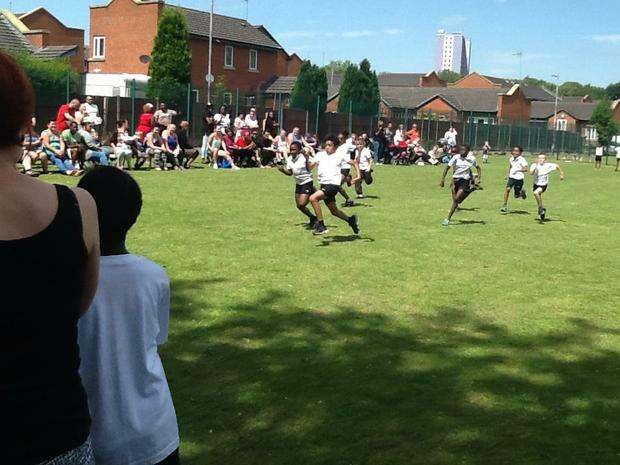 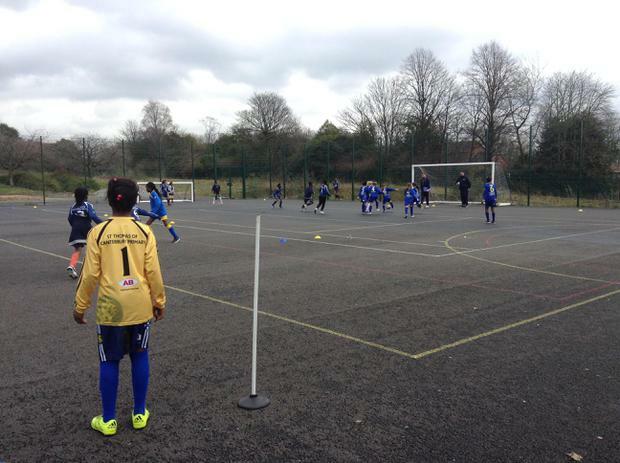 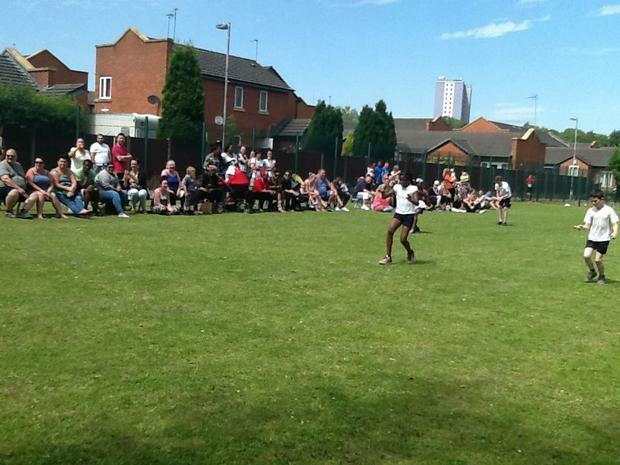 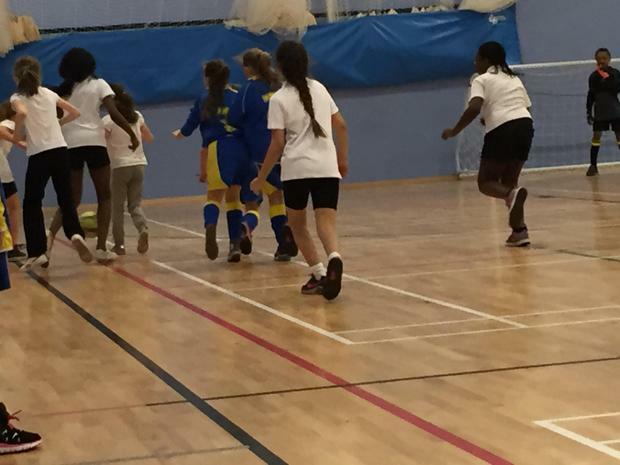 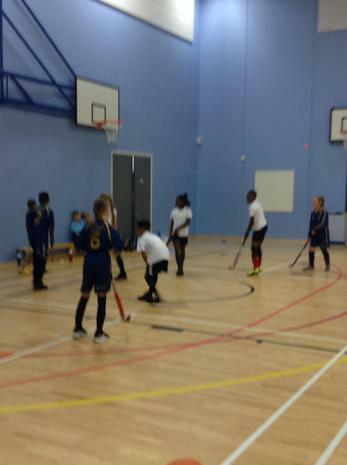 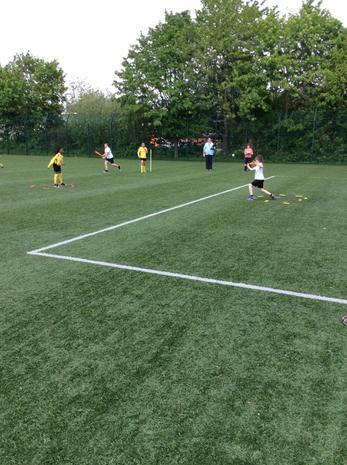 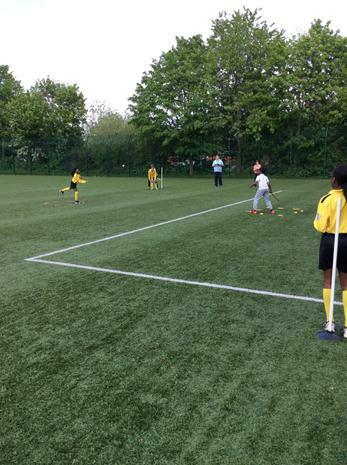 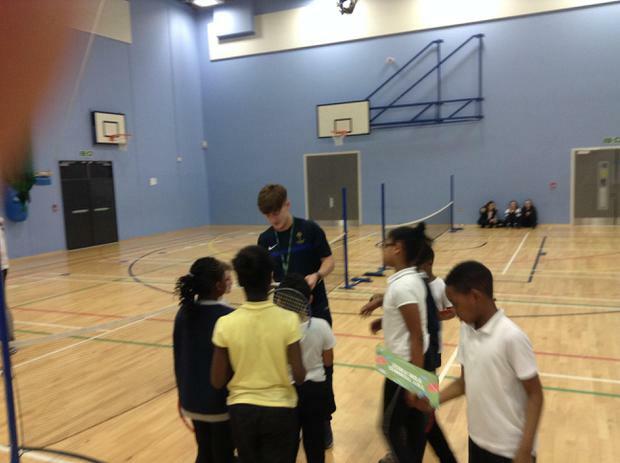 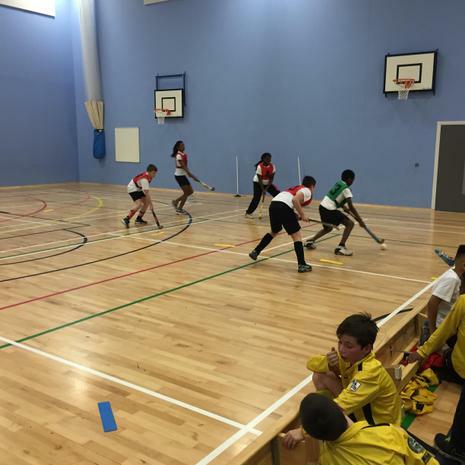 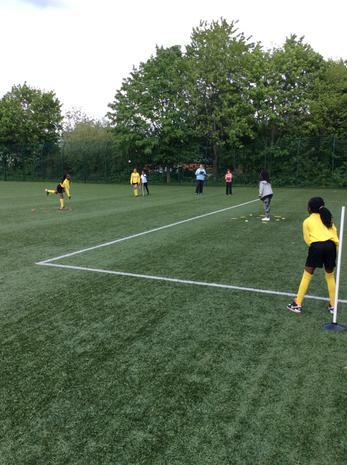 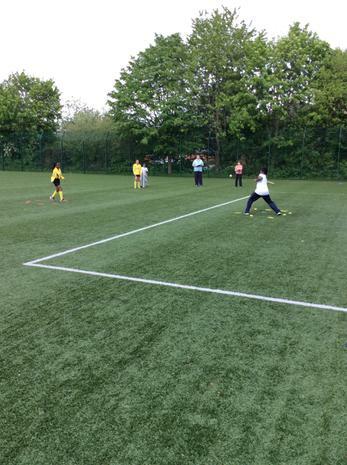 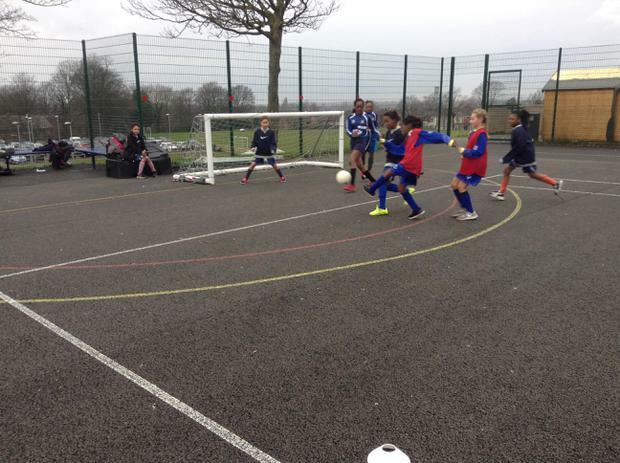 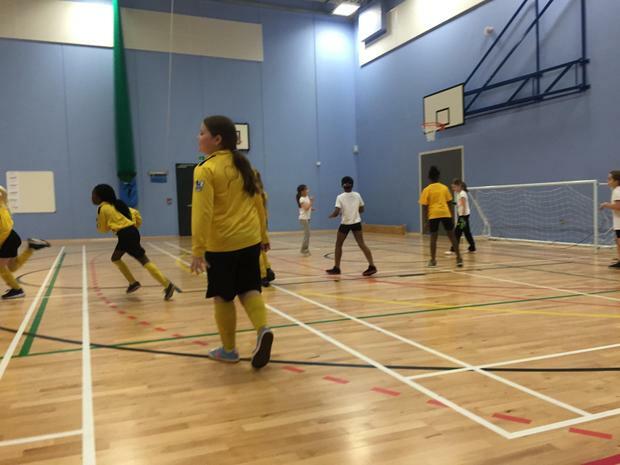 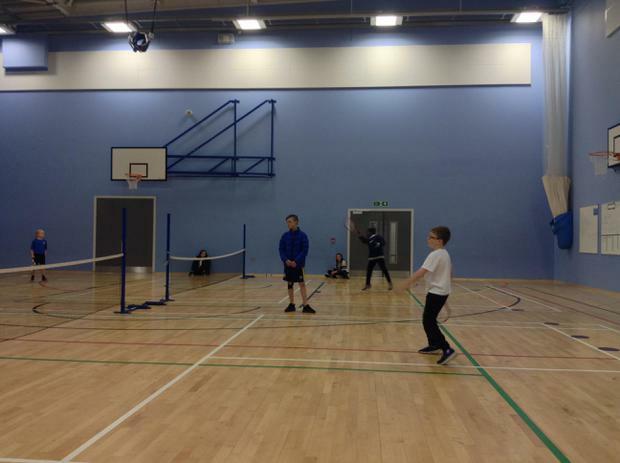 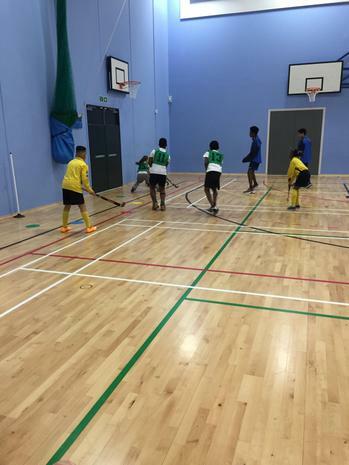 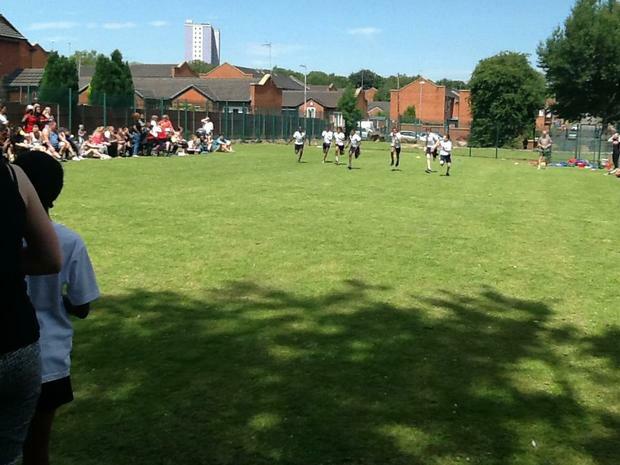 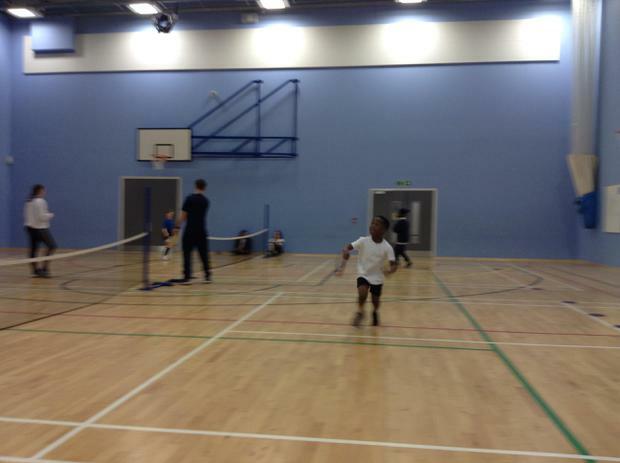 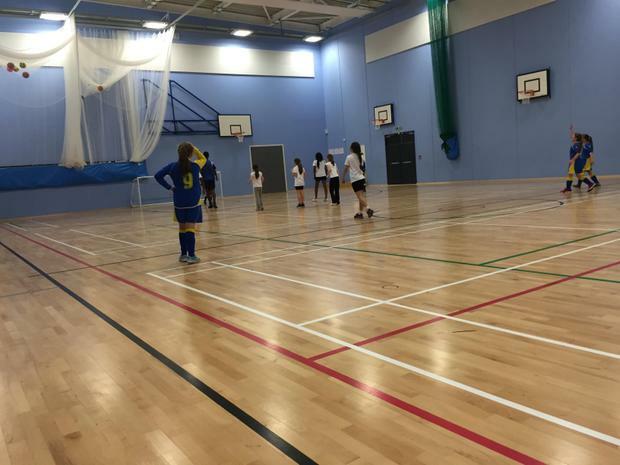 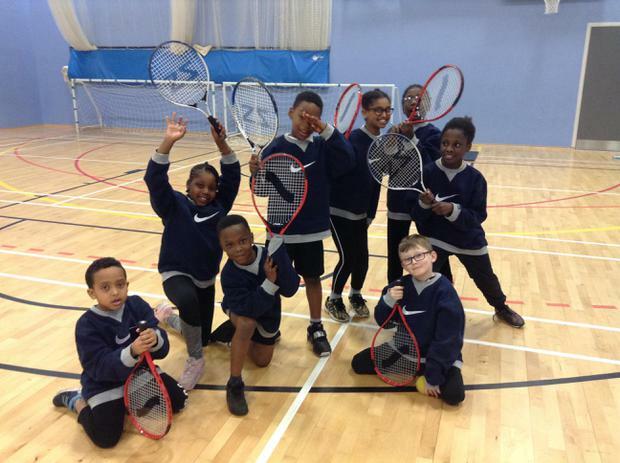 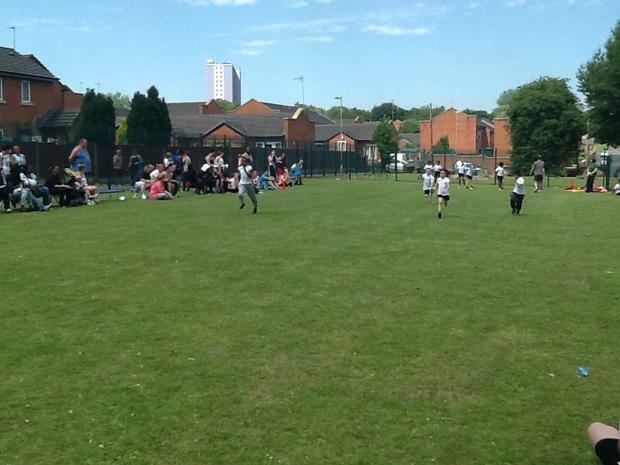 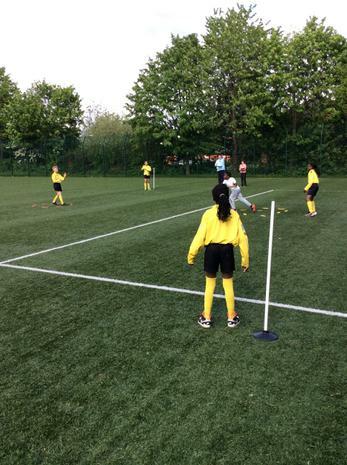 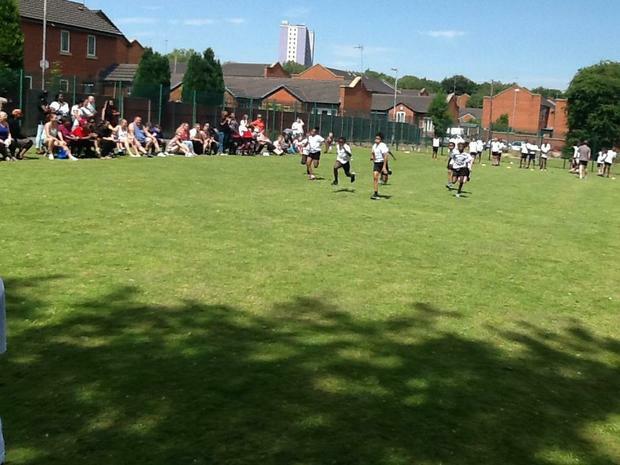 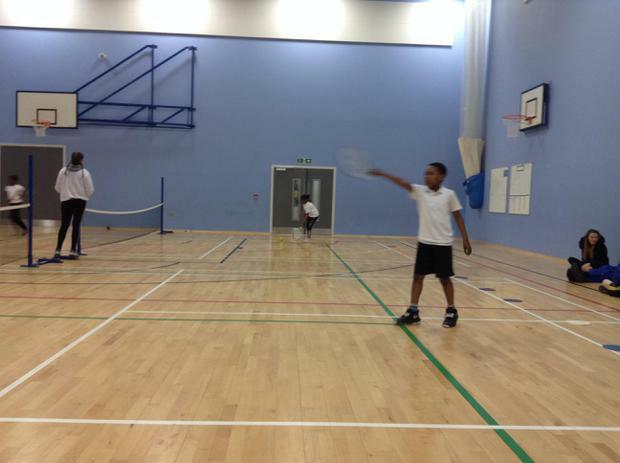 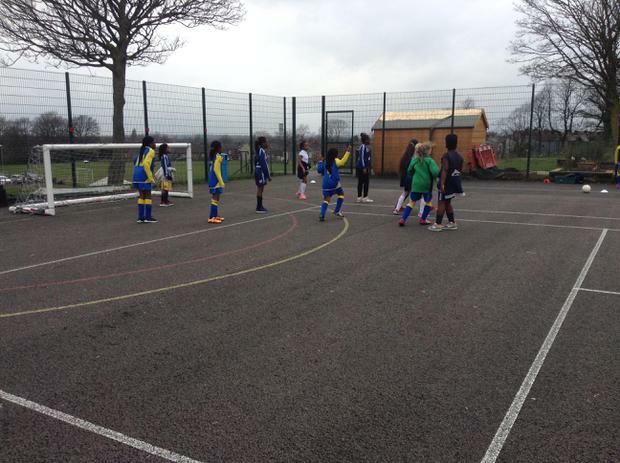 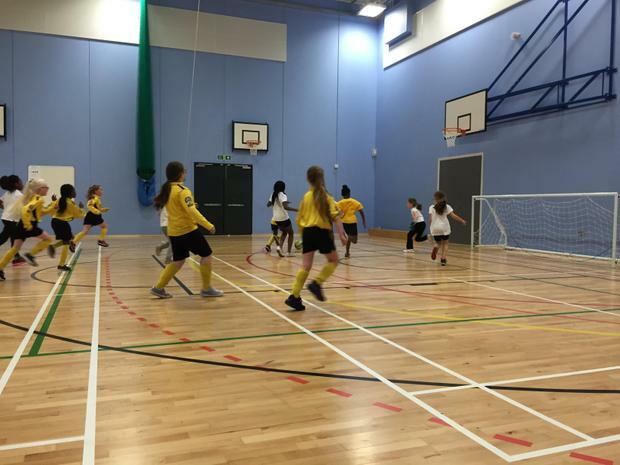 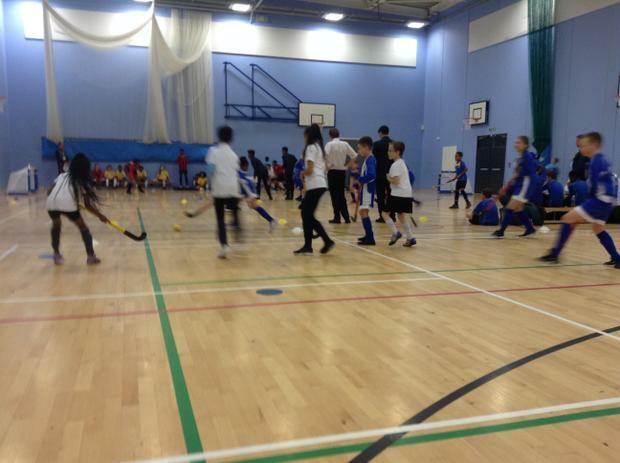 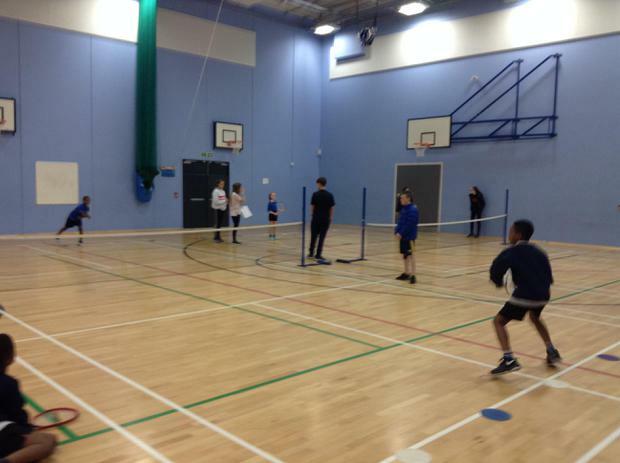 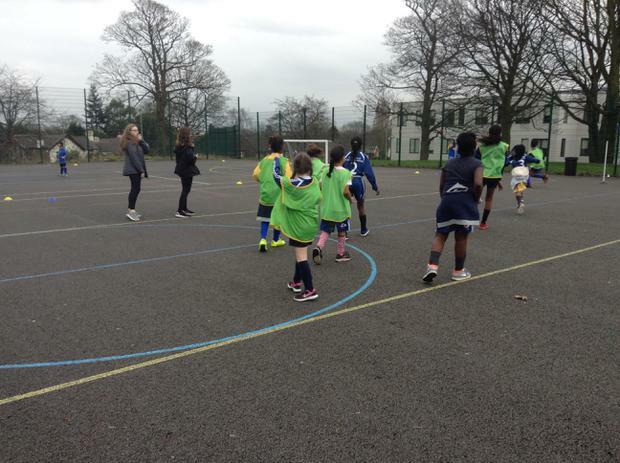 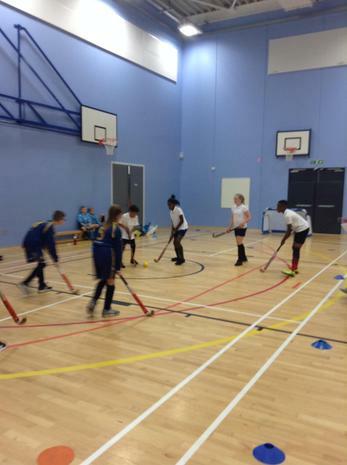 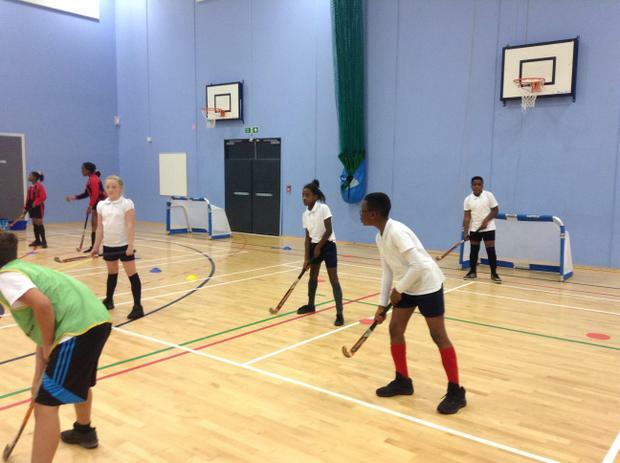 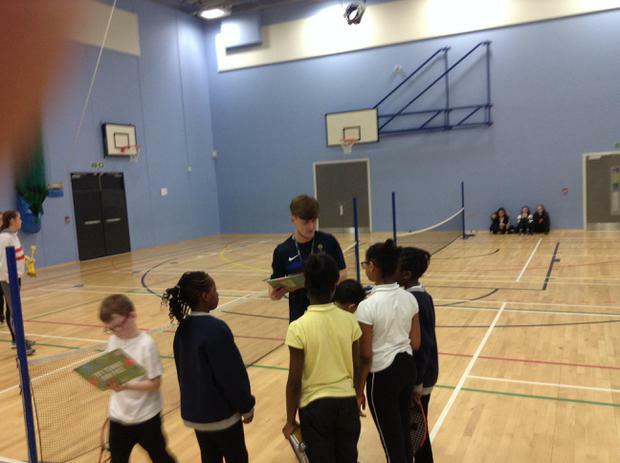 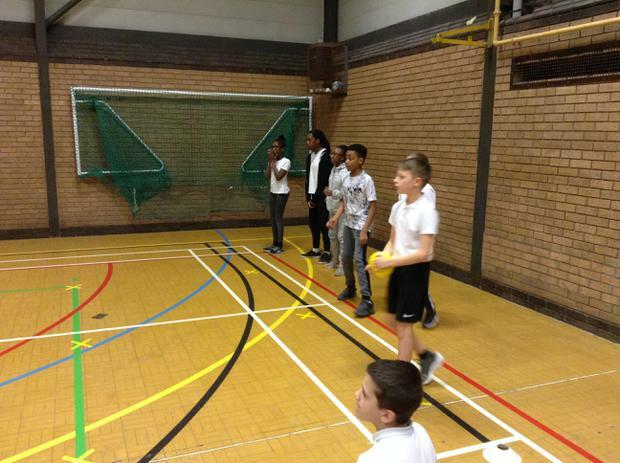 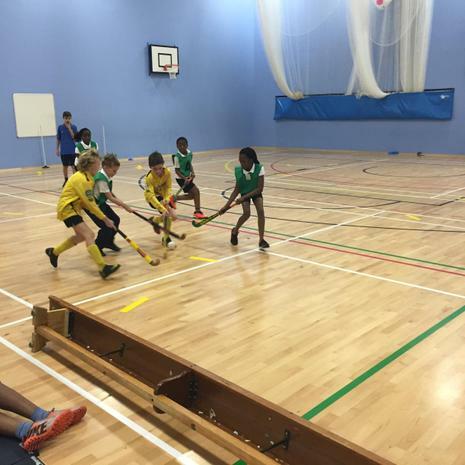 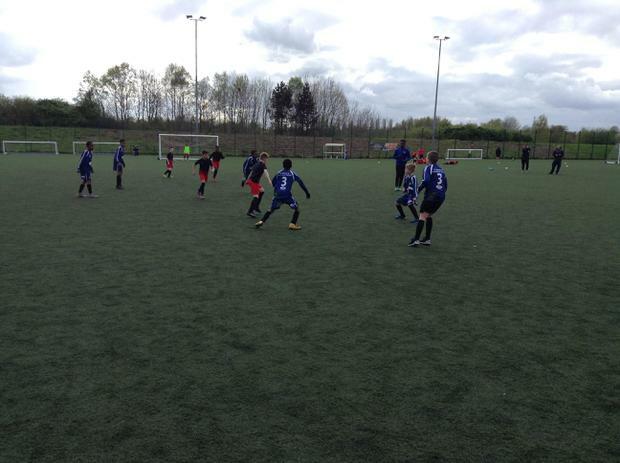 The finals will take place on the 24th April at Mesne Lea Primary School. 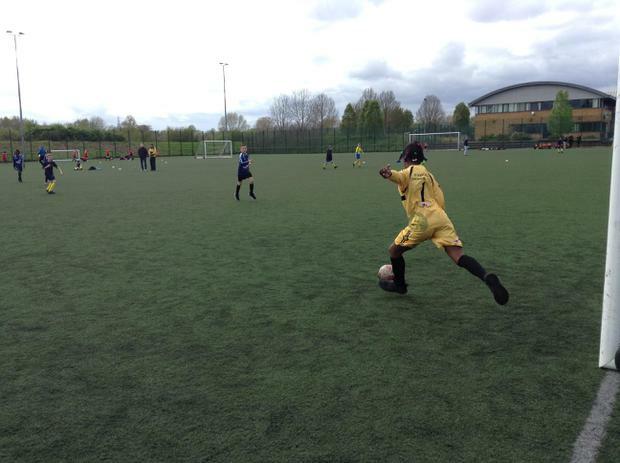 This is "Football League" by on Vimeo, the home for high quality videos and the people who love them. 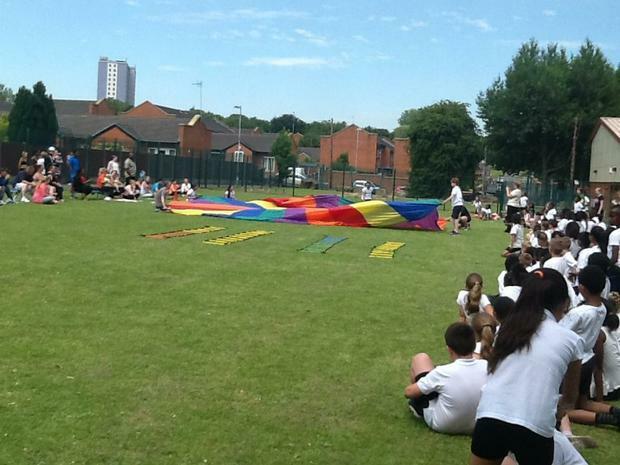 What a fantastic day we have had! 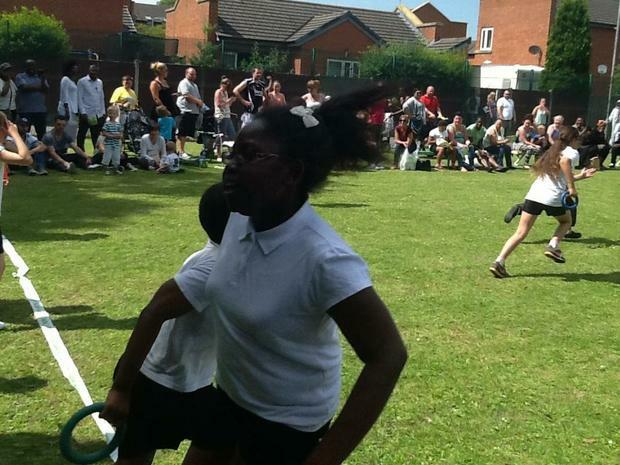 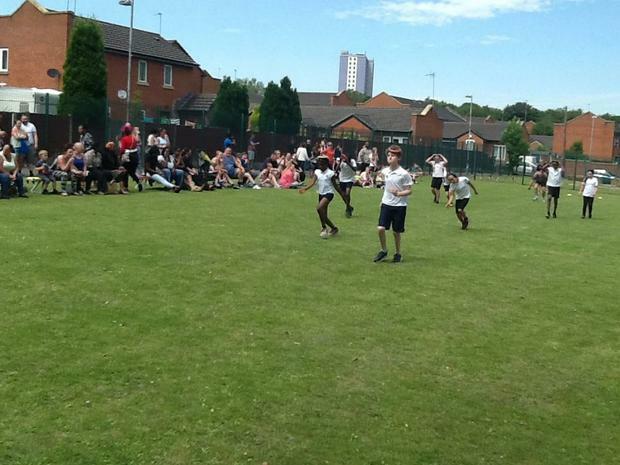 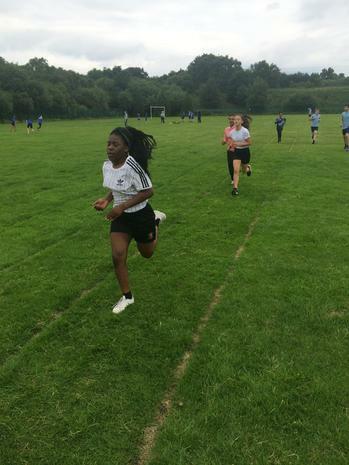 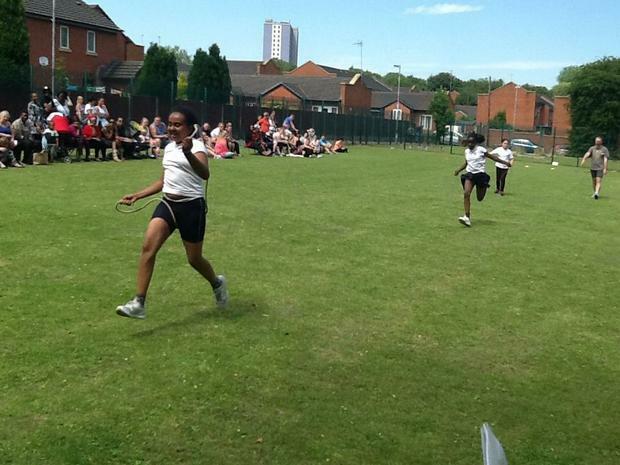 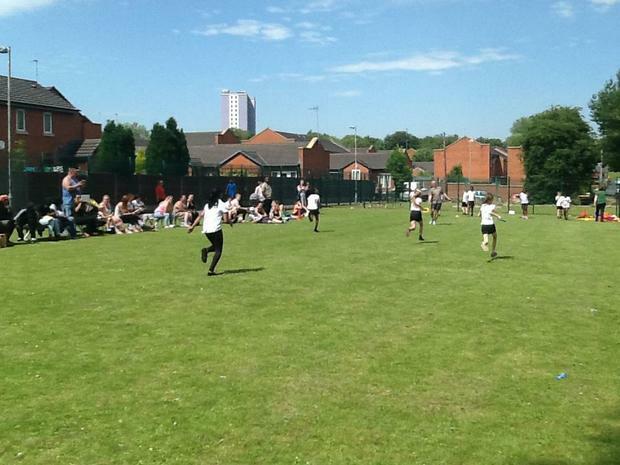 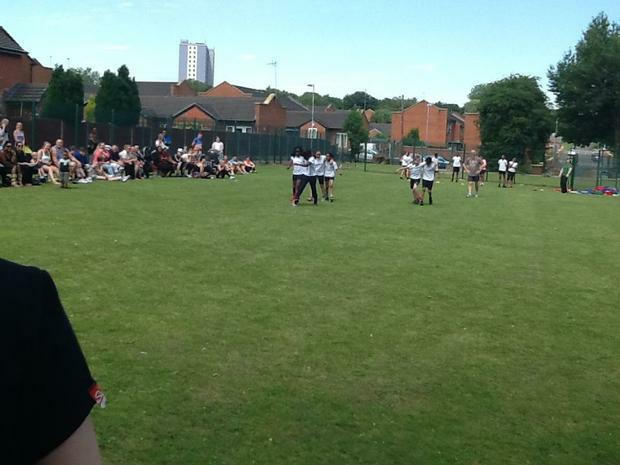 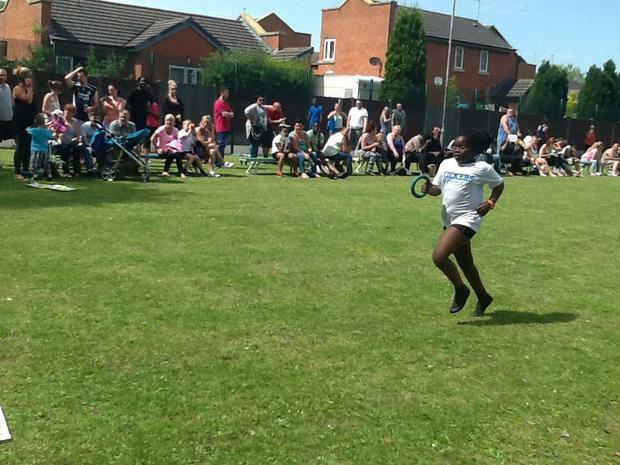 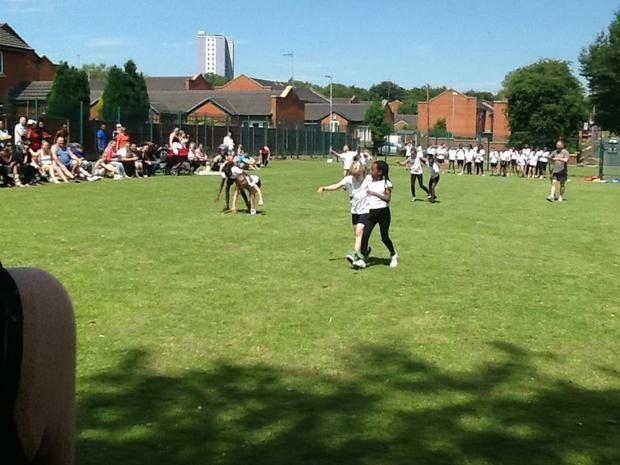 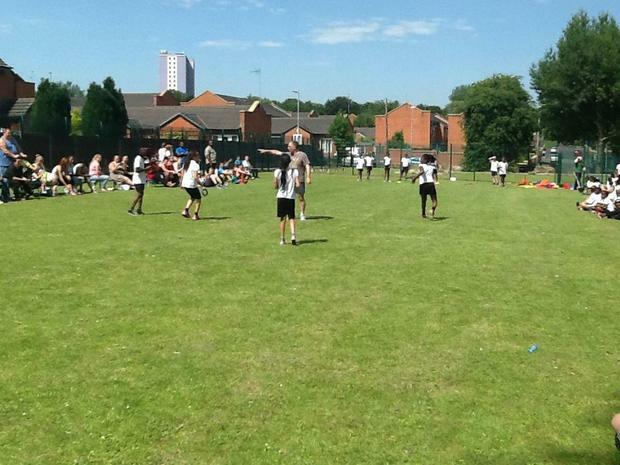 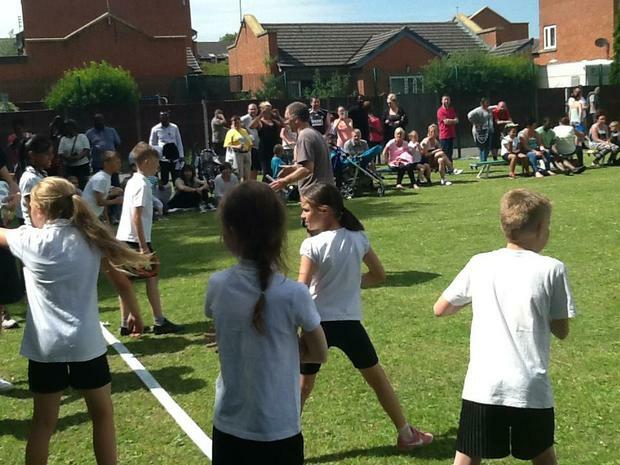 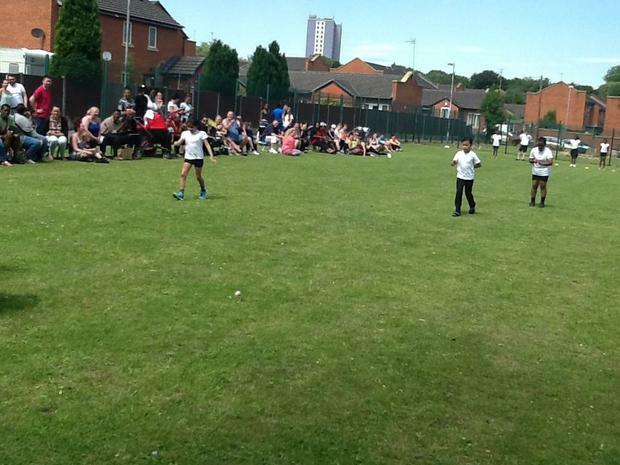 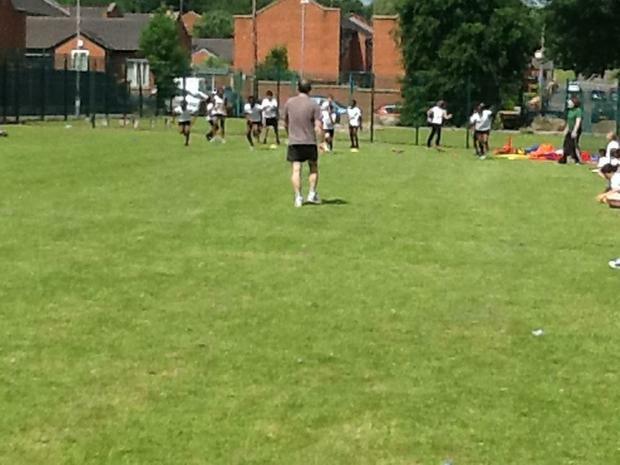 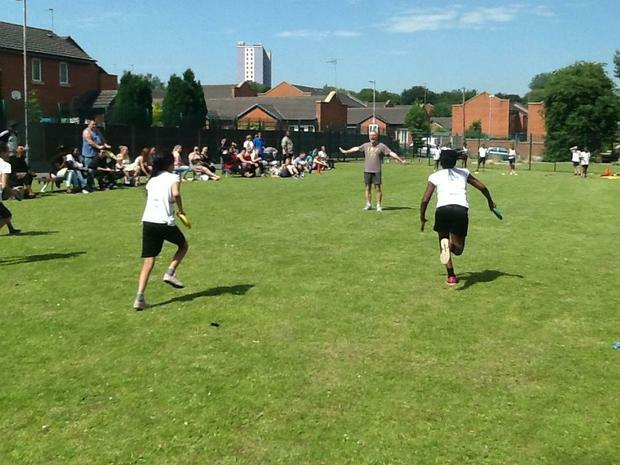 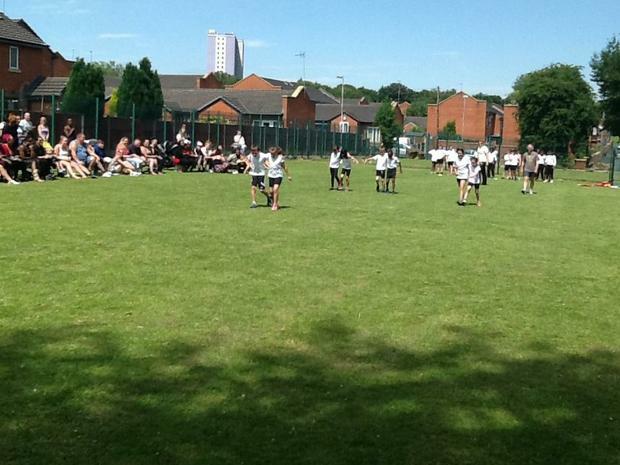 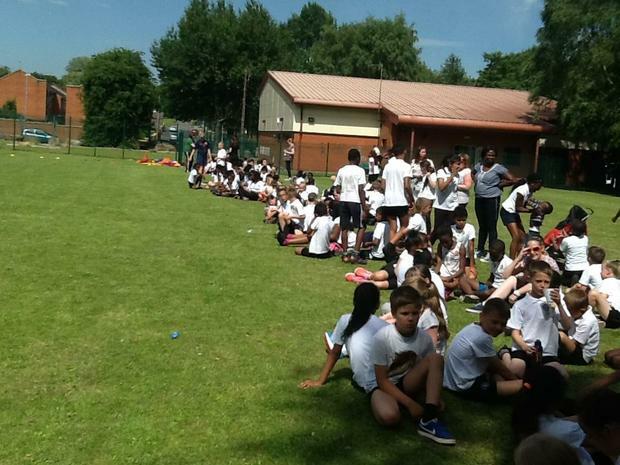 Well done to everyone who took part in this years sports day. 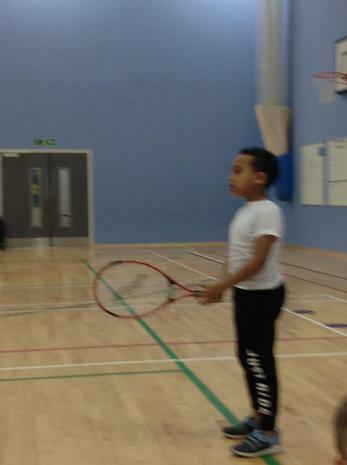 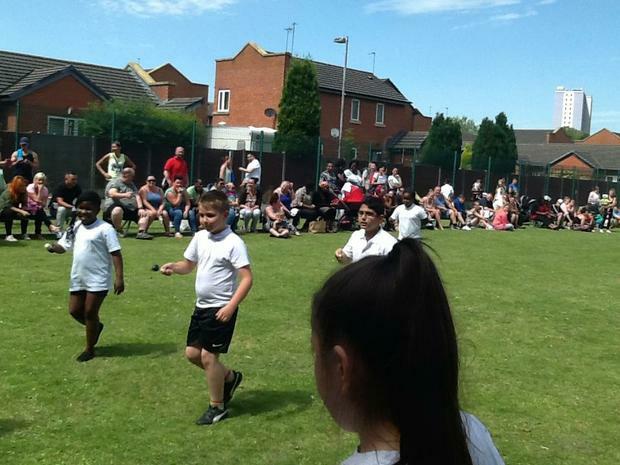 The children showed fantastic determination, team work and sportsmanship and we are very proud of you. 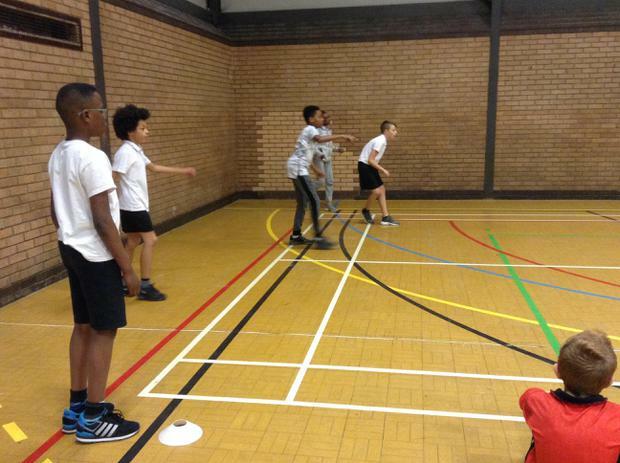 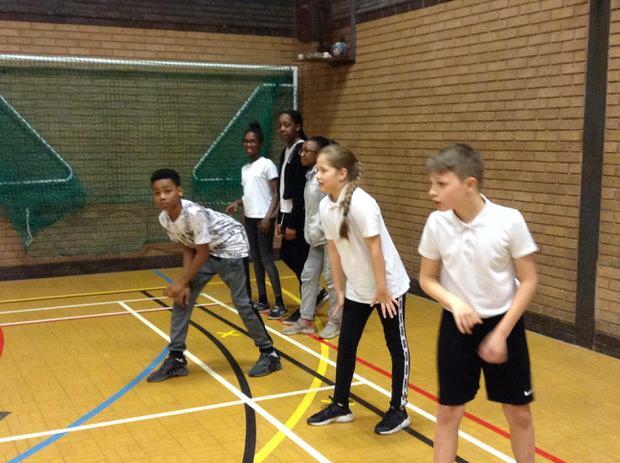 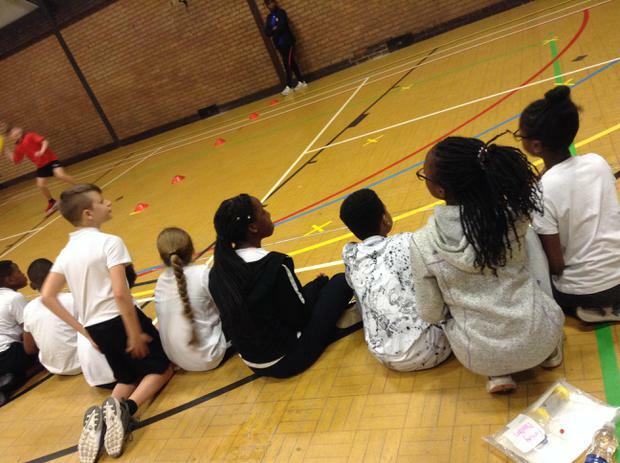 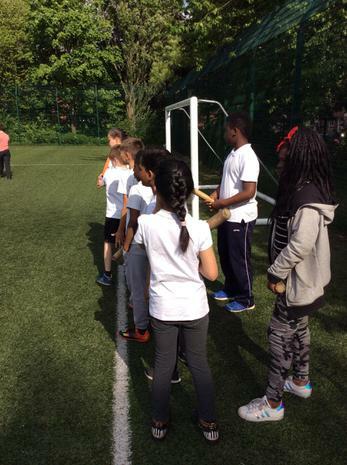 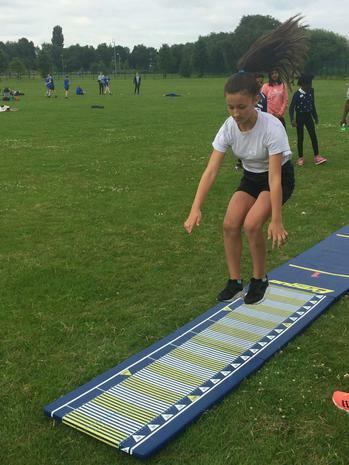 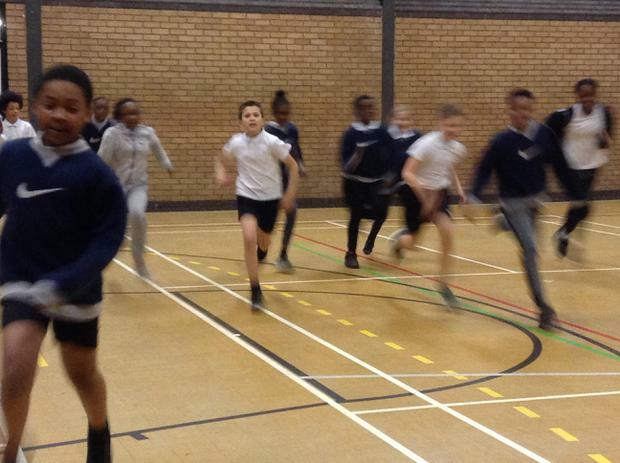 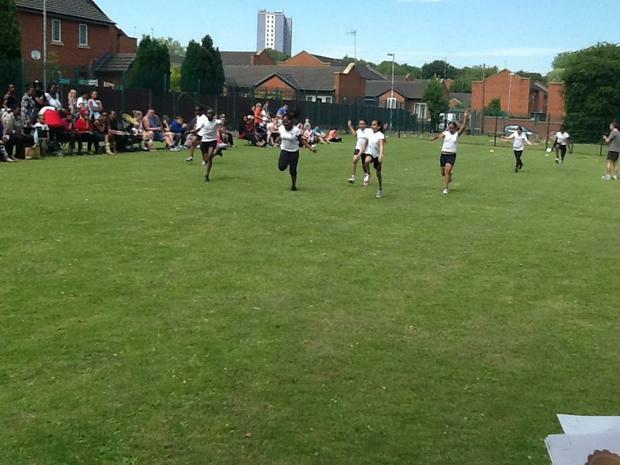 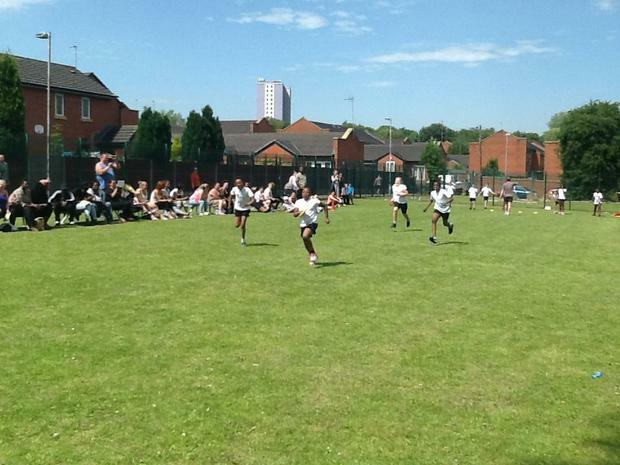 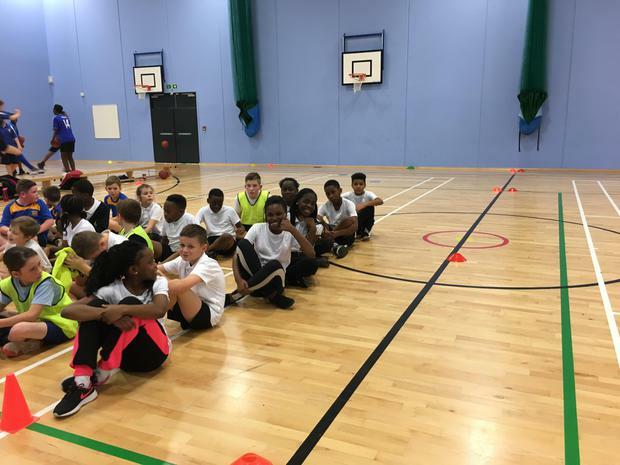 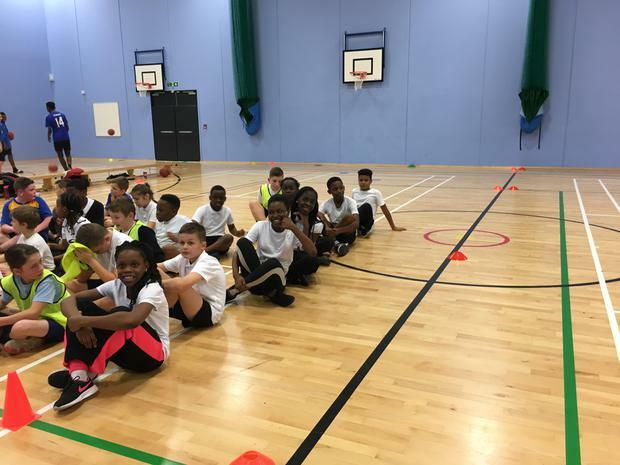 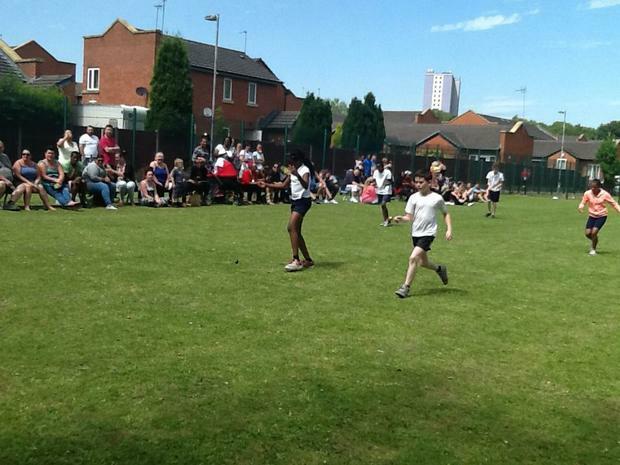 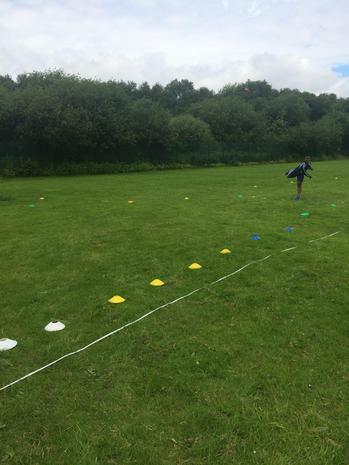 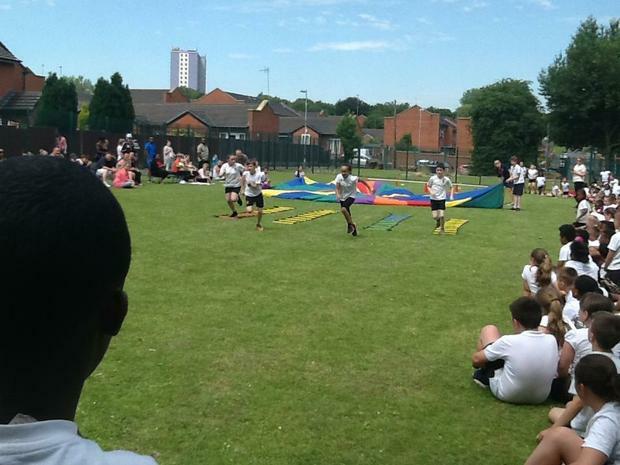 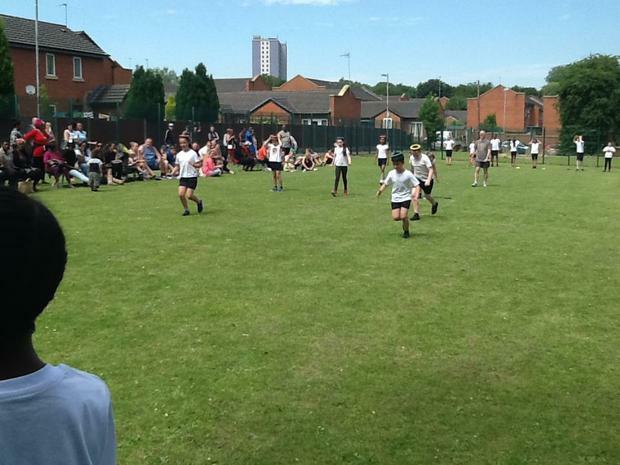 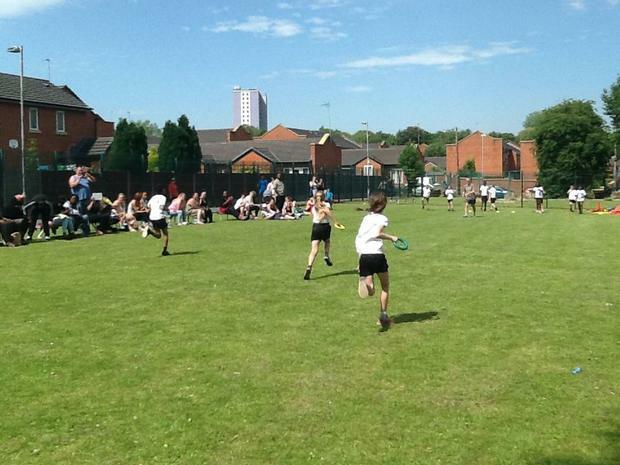 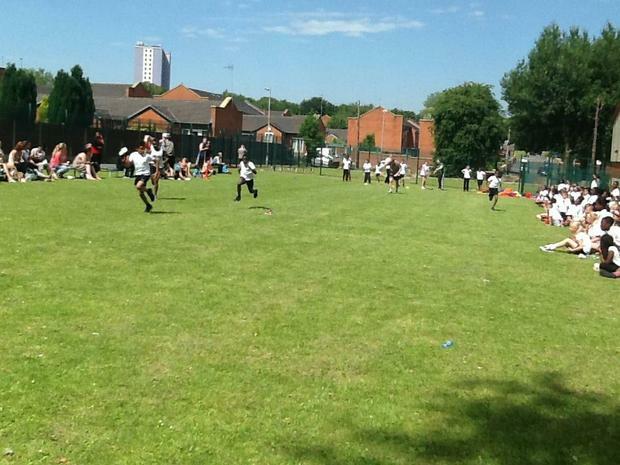 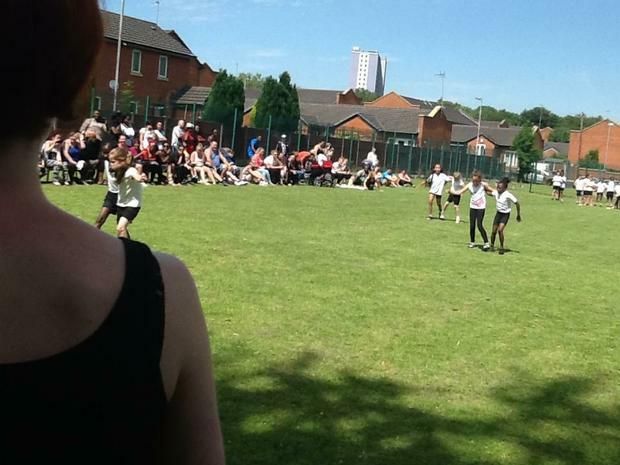 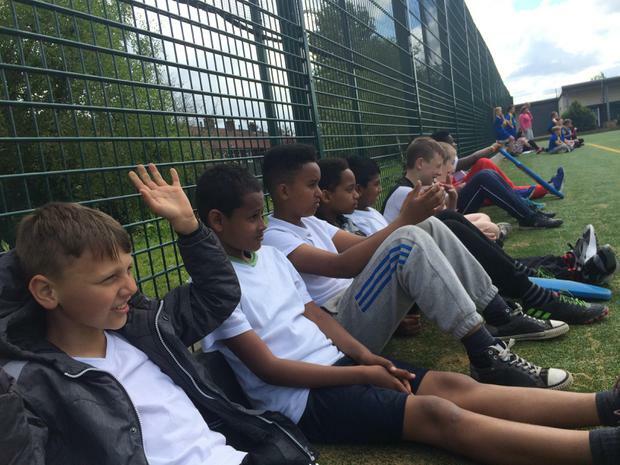 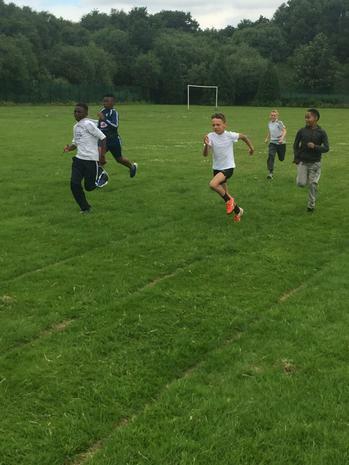 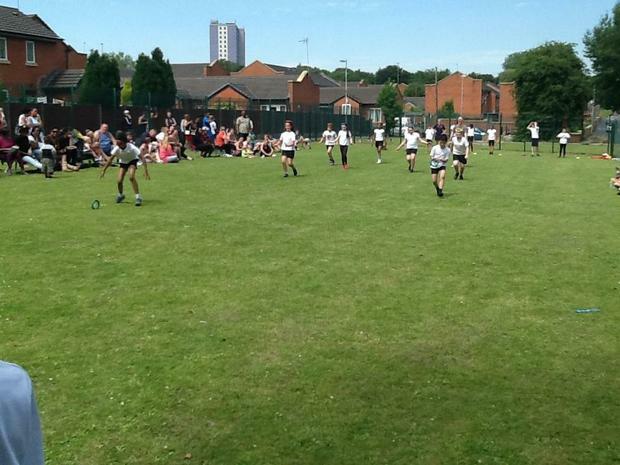 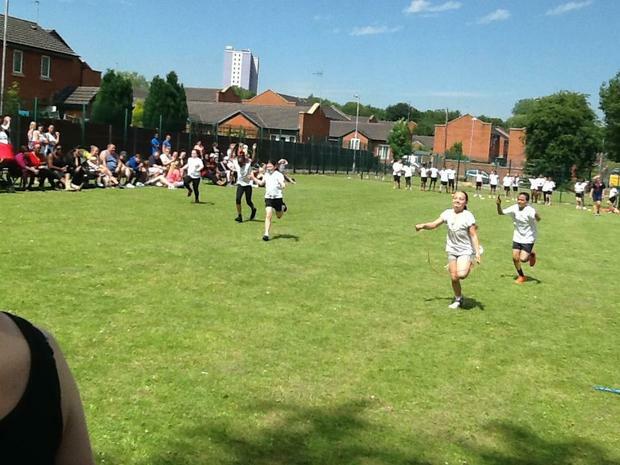 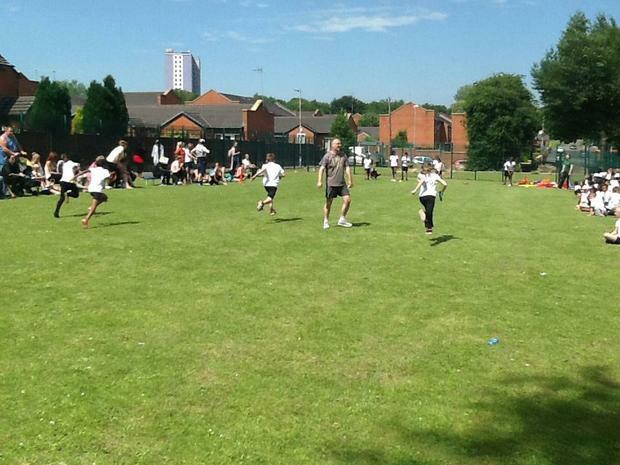 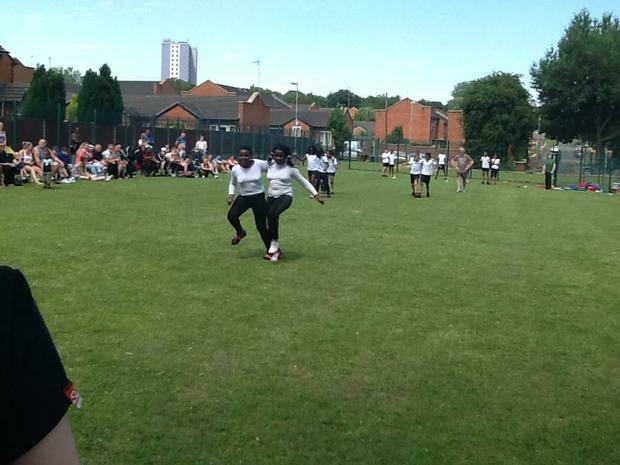 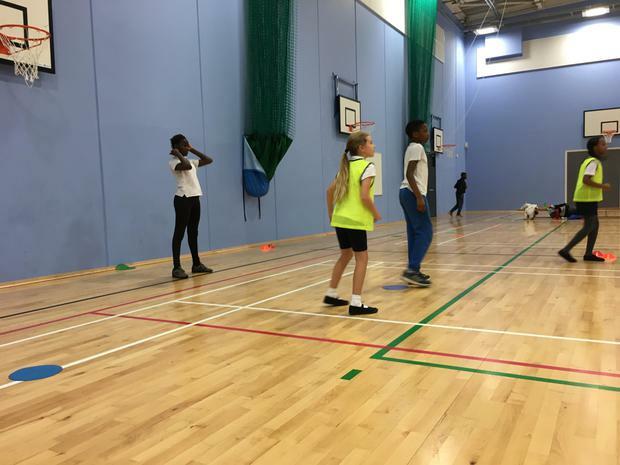 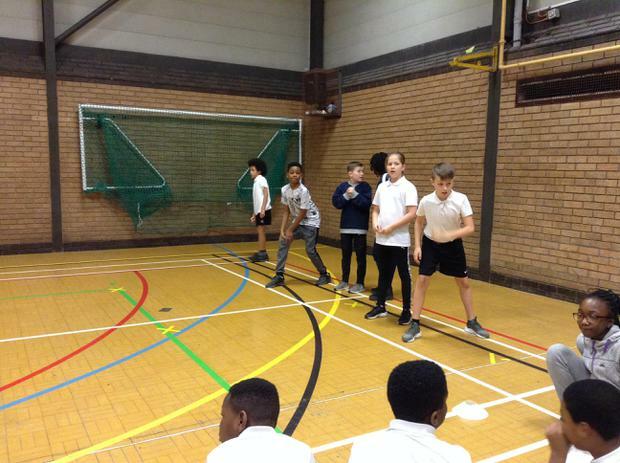 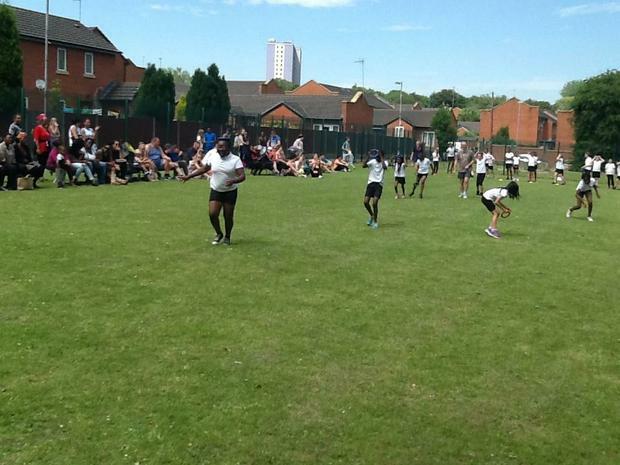 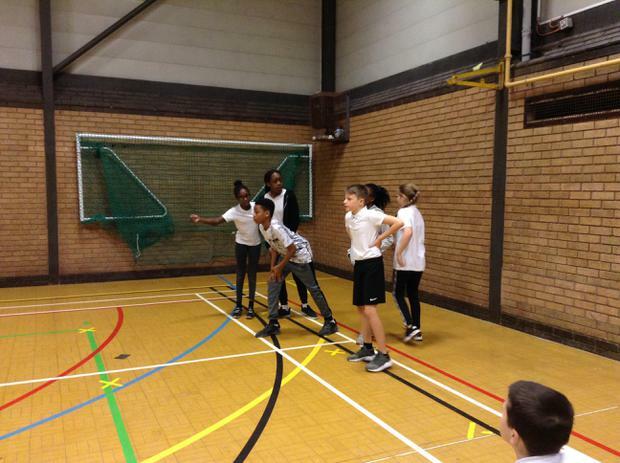 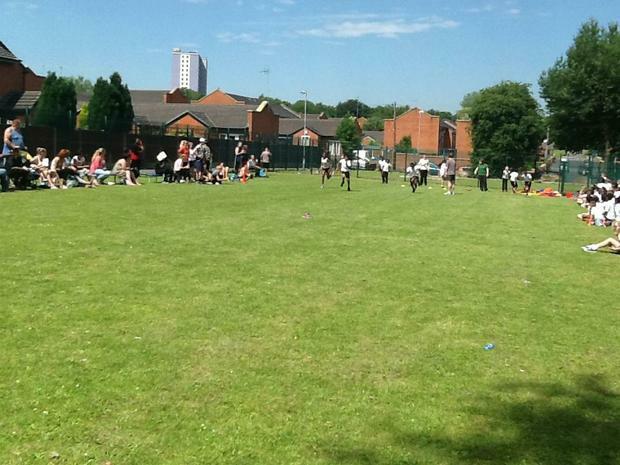 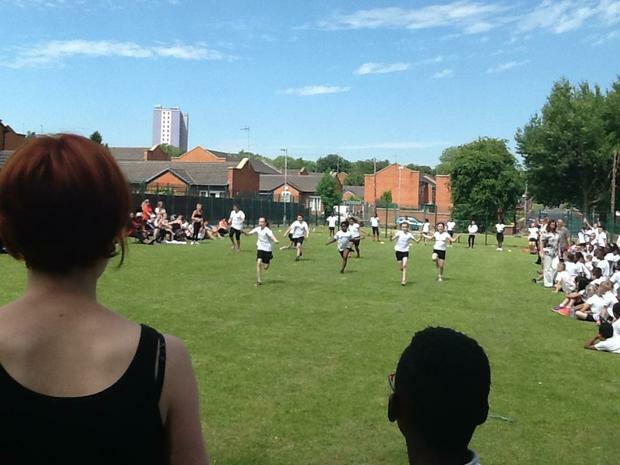 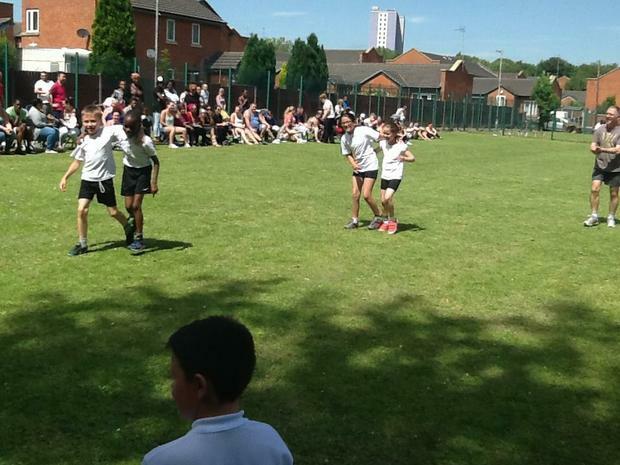 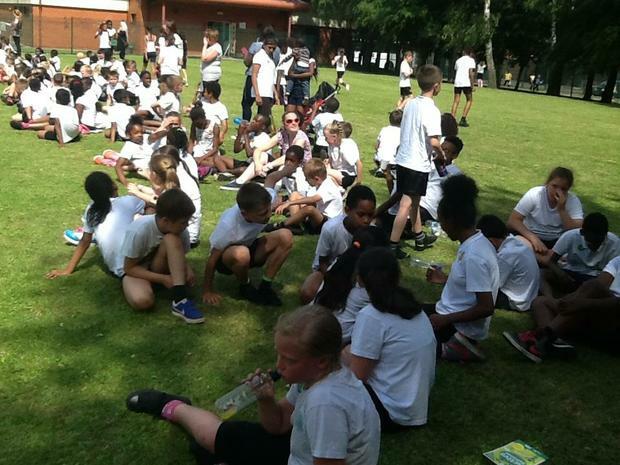 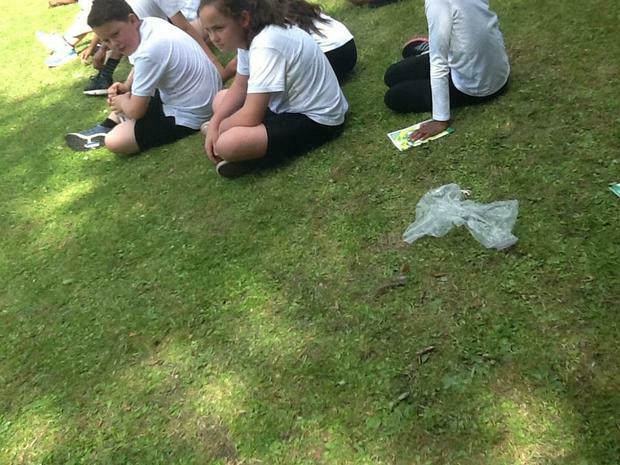 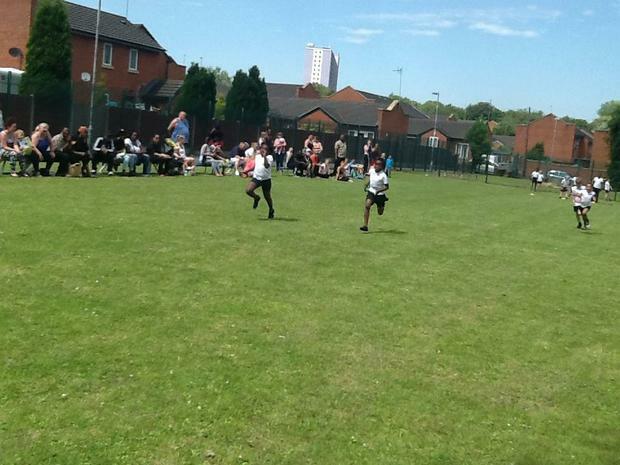 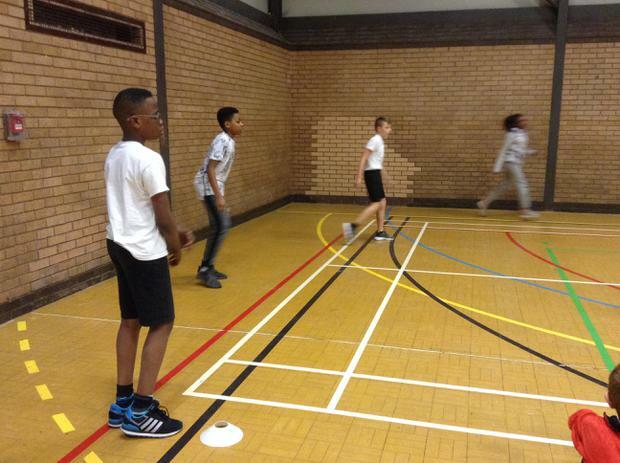 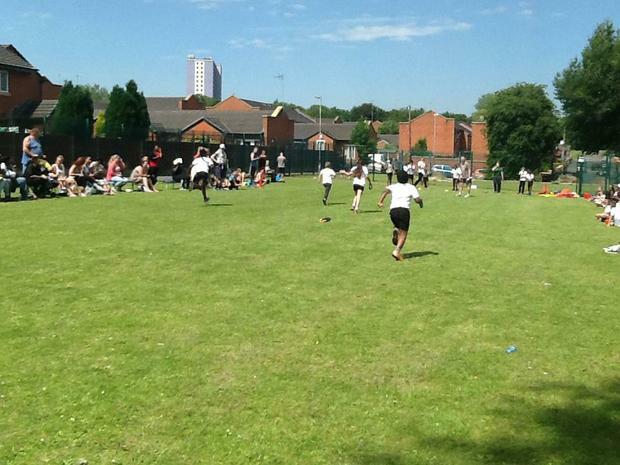 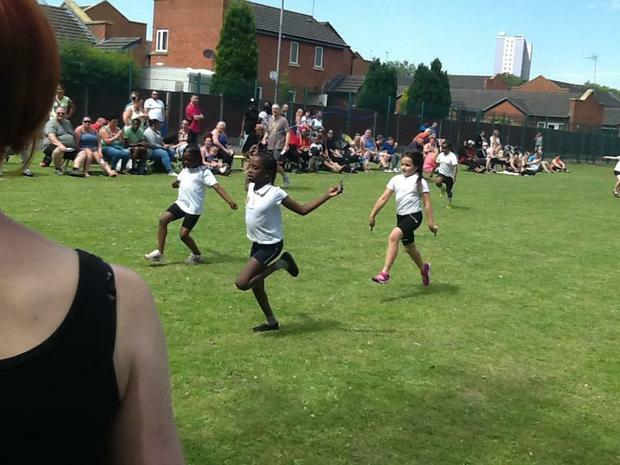 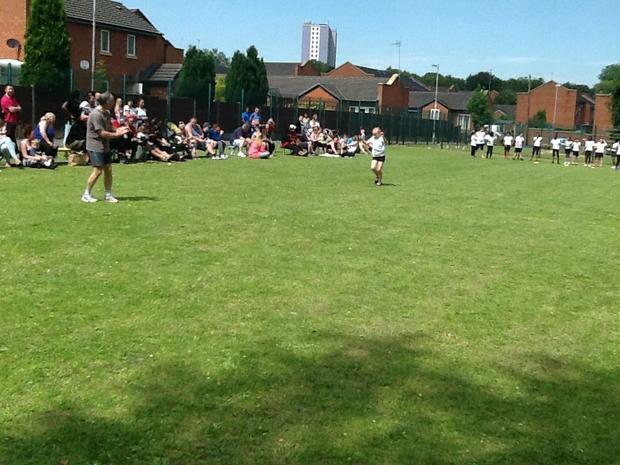 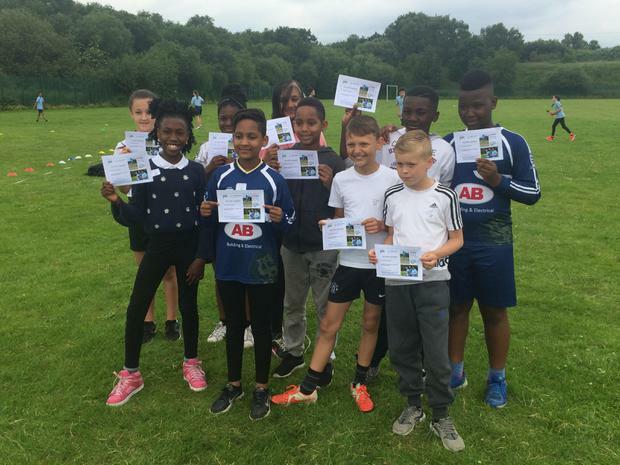 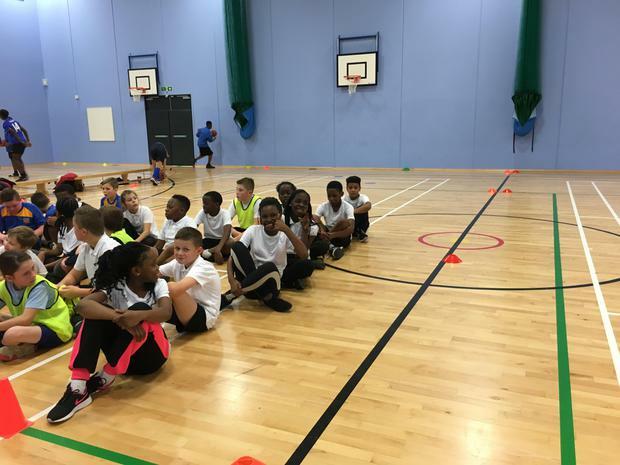 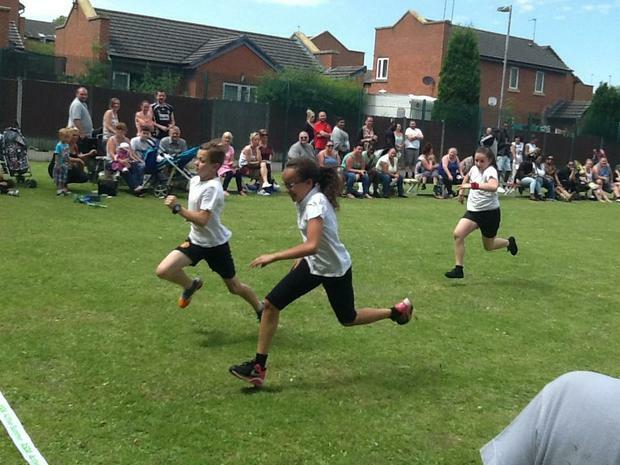 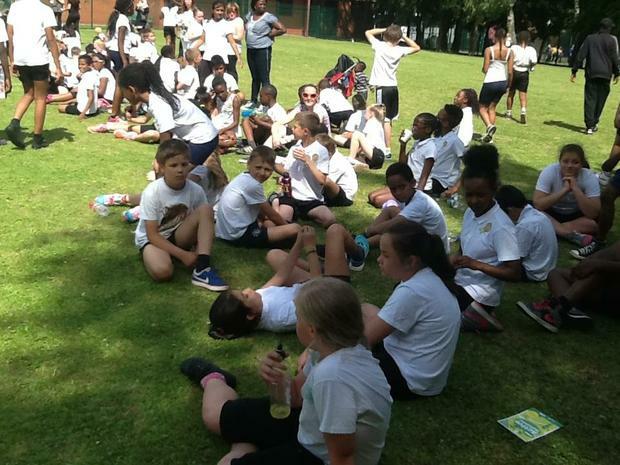 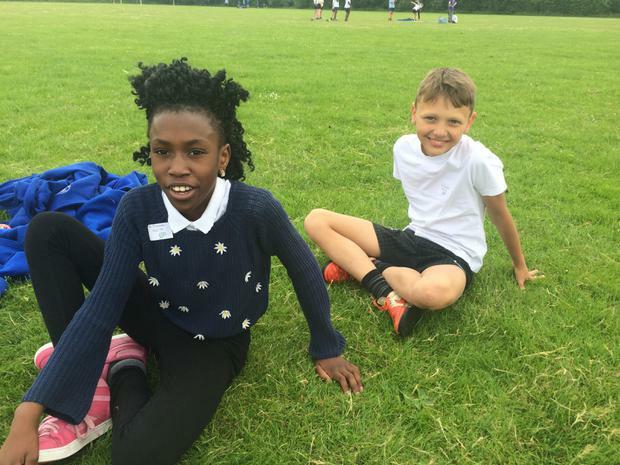 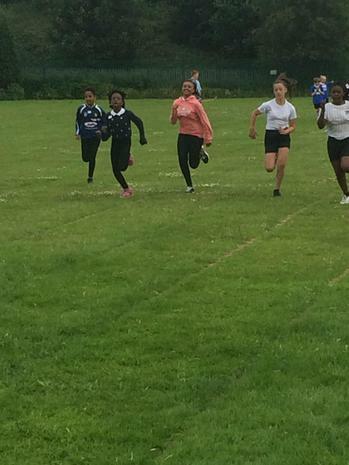 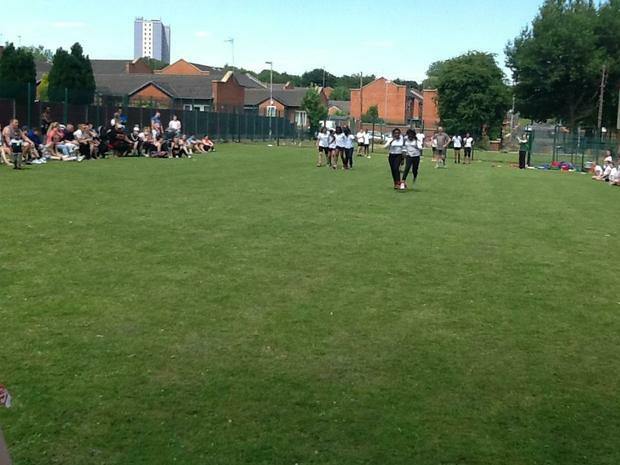 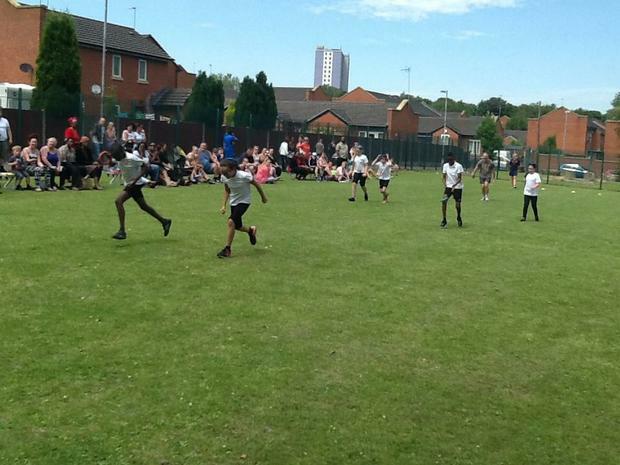 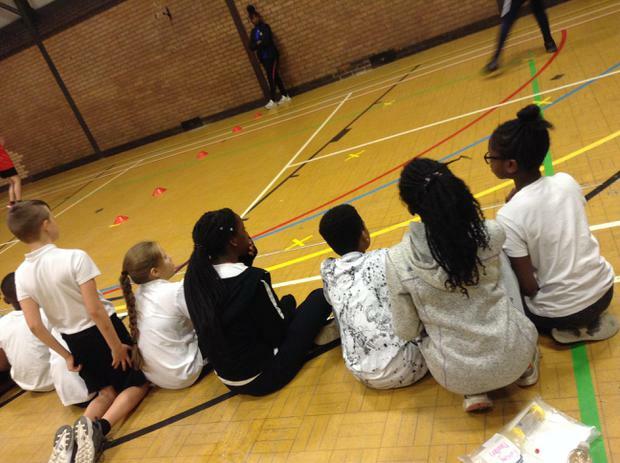 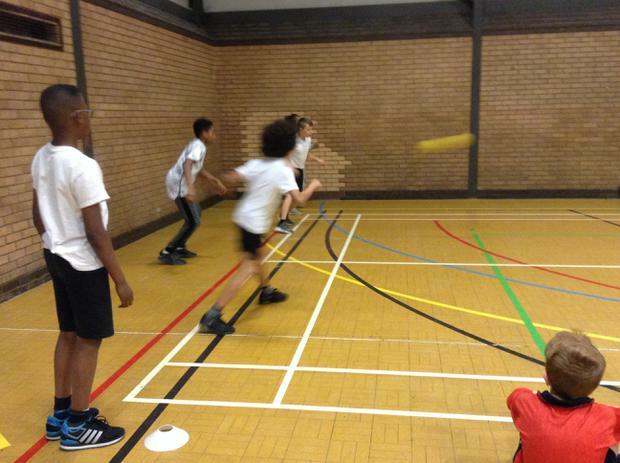 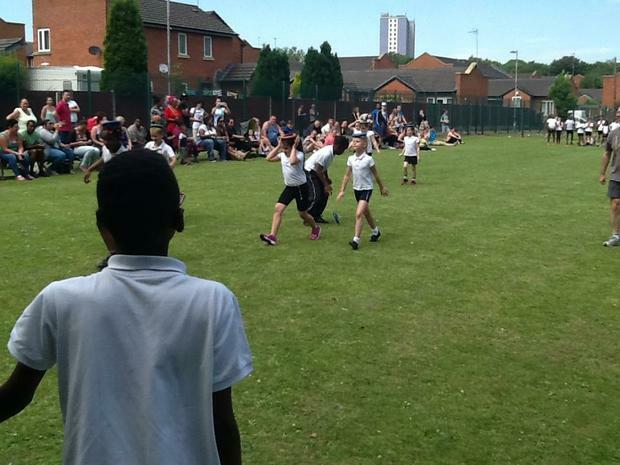 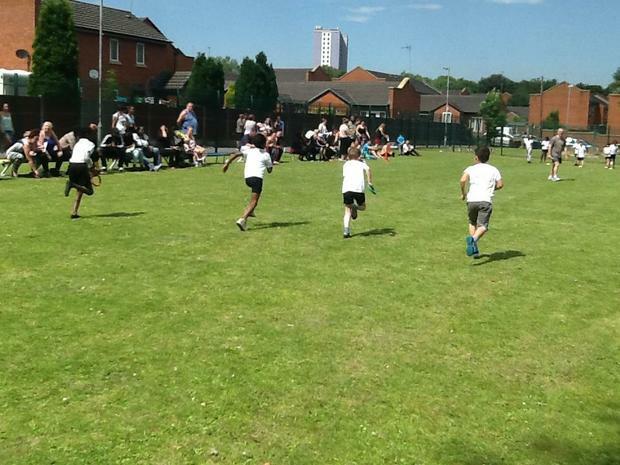 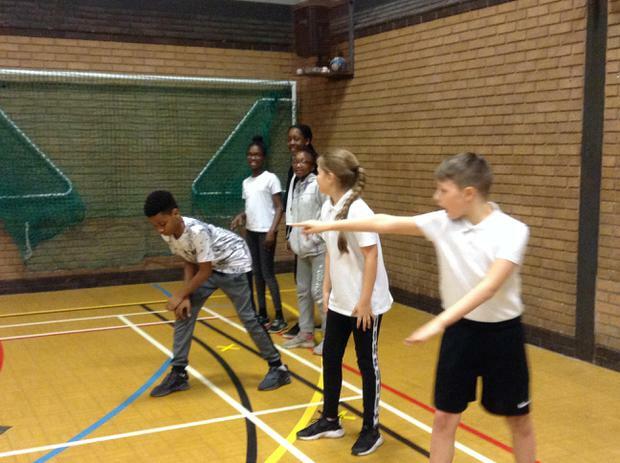 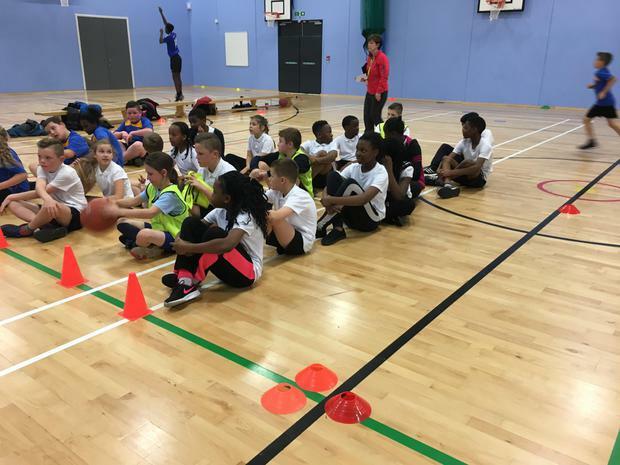 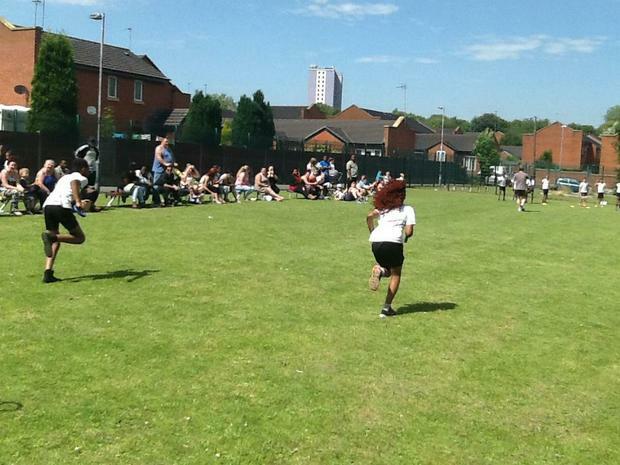 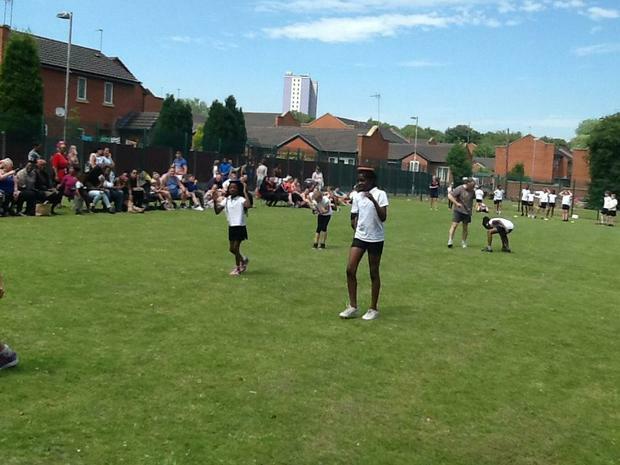 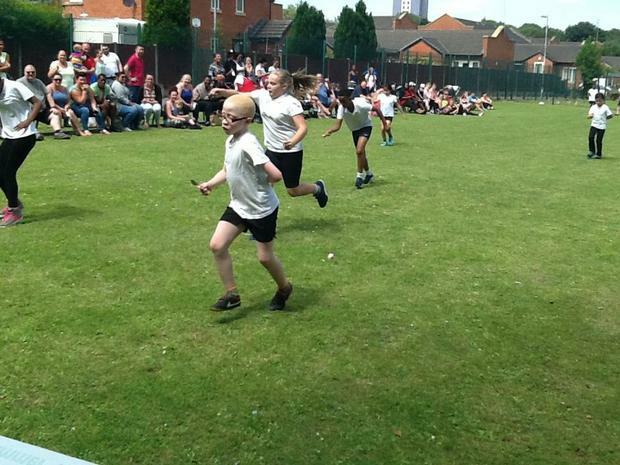 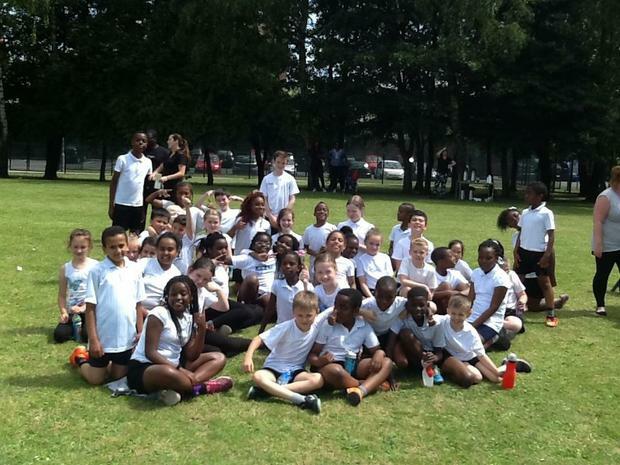 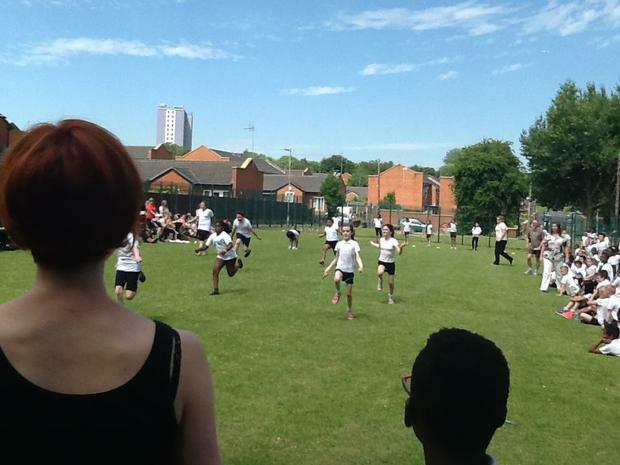 Our Year 6's took part in the Salford Quadkids event (consisting of a 600m run, a 75m sprint, a standing long jump and a vertex throw) on Wednesday 22nd June at Salford City Academy. 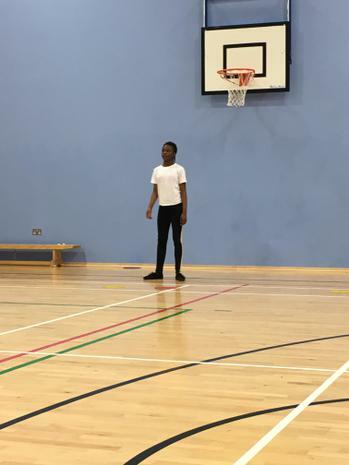 Despite our early start and some of our team players not making it, we had some last minute stand ins, who turned out to be fantastic additions to the team. 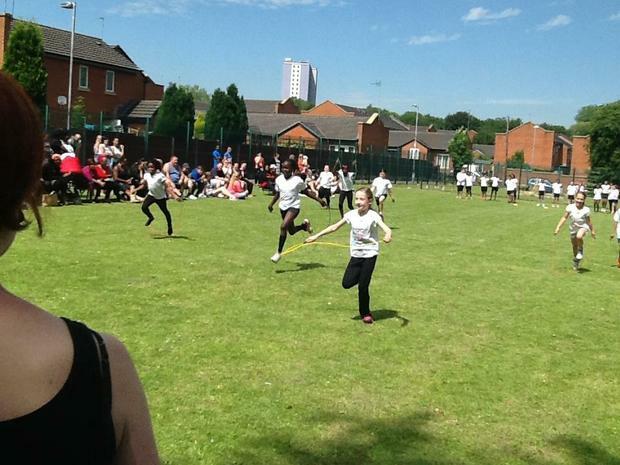 Miss Watson was really impressed with the children's performance as they secured second place with 996 points. 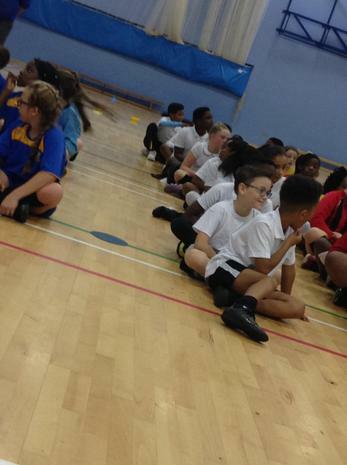 Unfortunately we came third overall, with an event in the both the morning and the afternoon, meaning we only just missed out on representing Salford at L3 School Games Quadkids event. 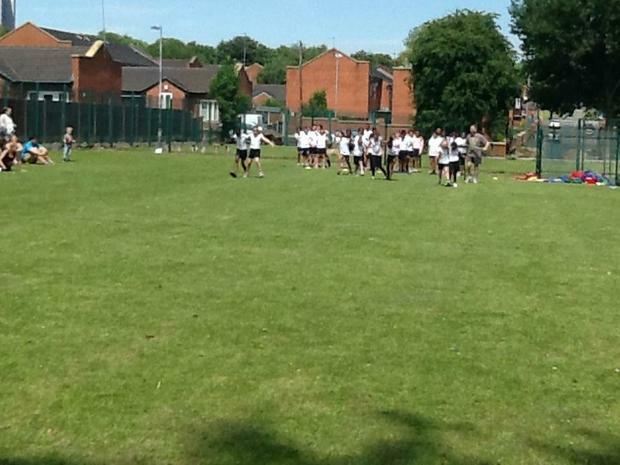 Great team work guys, keep it up! 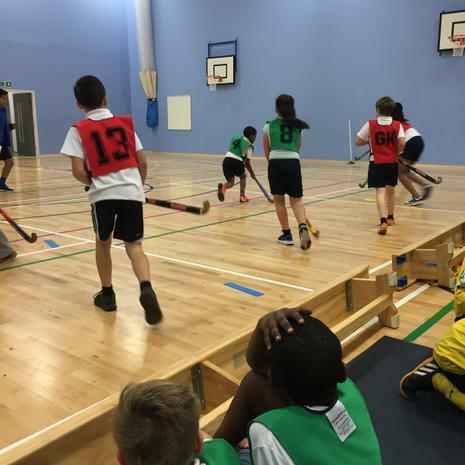 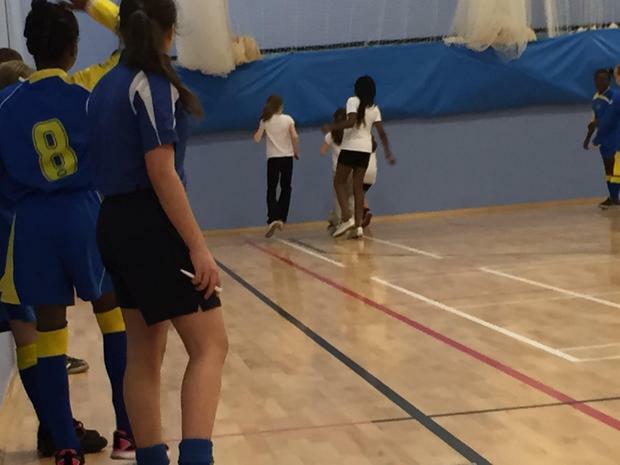 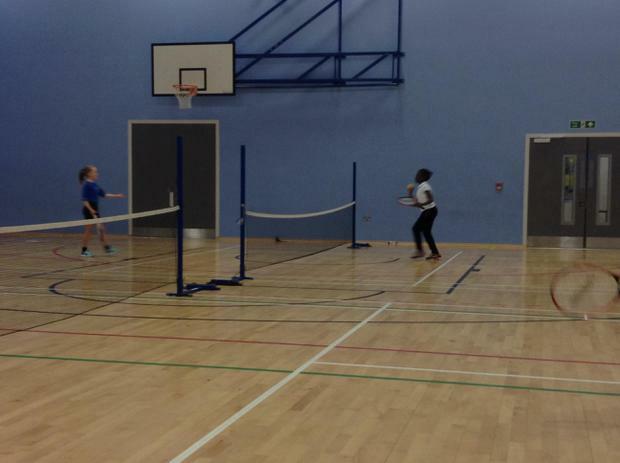 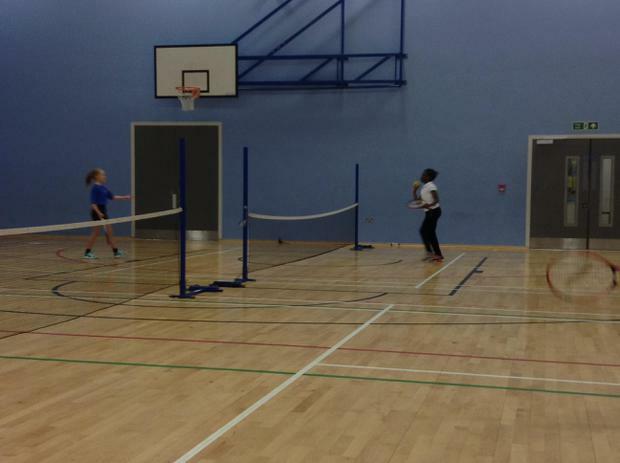 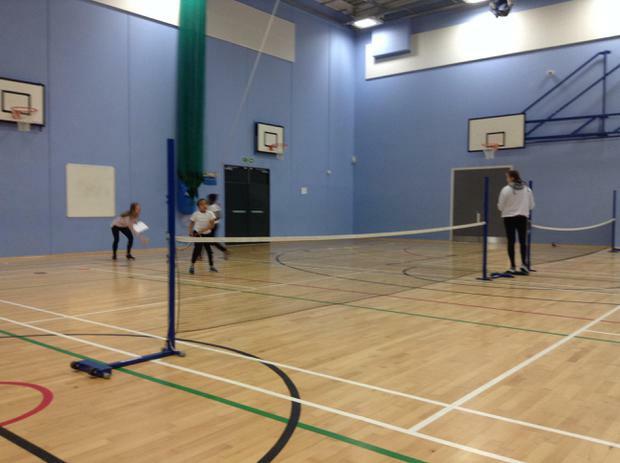 It's a busy time of year for our sporting competitions! 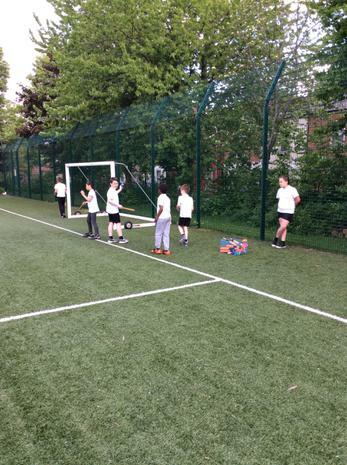 Last night (23/5/16) it was time for our rounder's tournament. 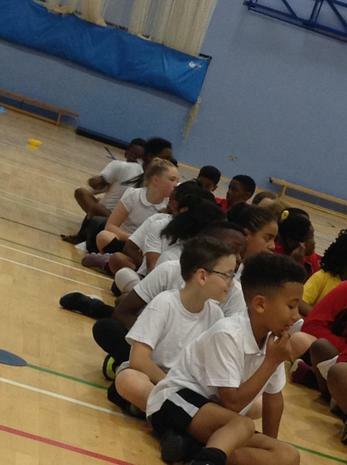 The children put in lots of training time at school prior to the competition but it didn't seem to go our way on the night! 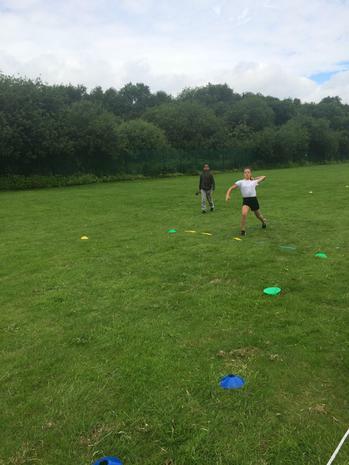 We did however, show some fantastic teamwork especially with William as back stop and Brandon on first base, stumping many of our opposing players out before they had time to get any further around the course. 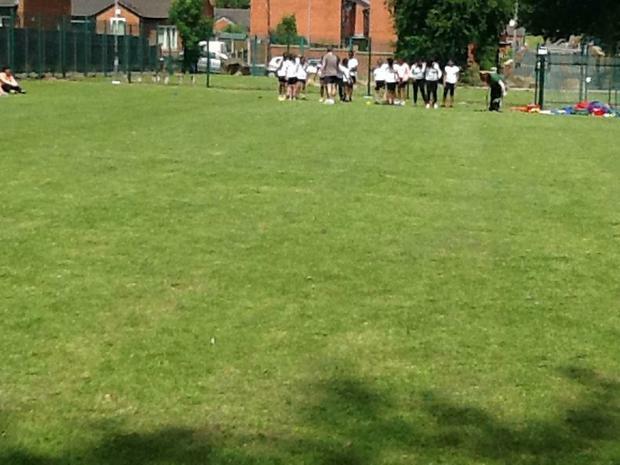 Nikita demonstrated how to bowl the ball accurately and Tilly put in a good performance on fourth base. 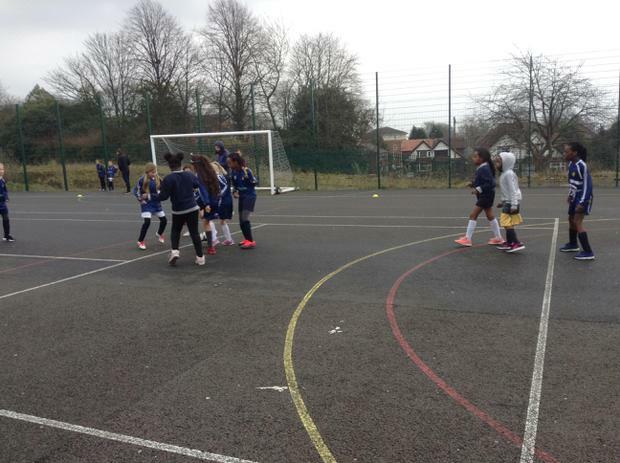 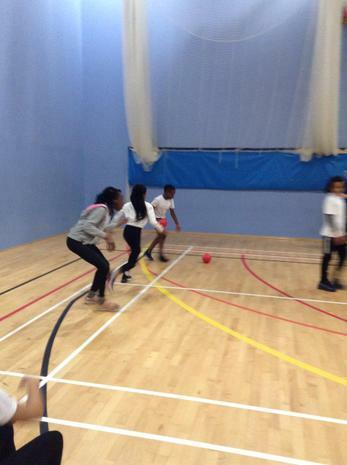 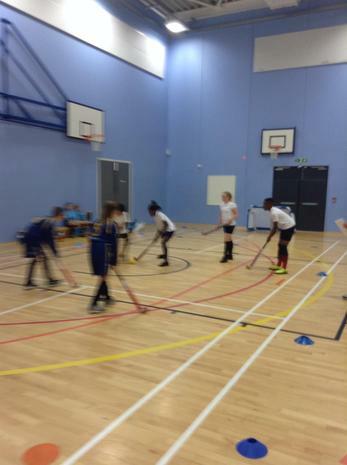 By the time our second game came round we had warmed up and were gelling together as a team. 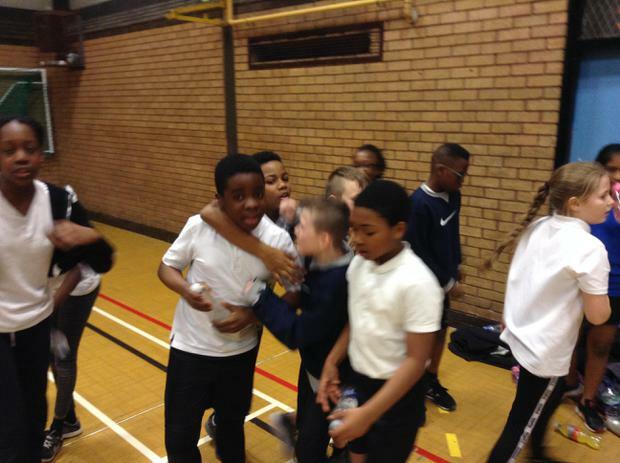 Many half rounder's were scored and Brandon achieved our first full rounder. 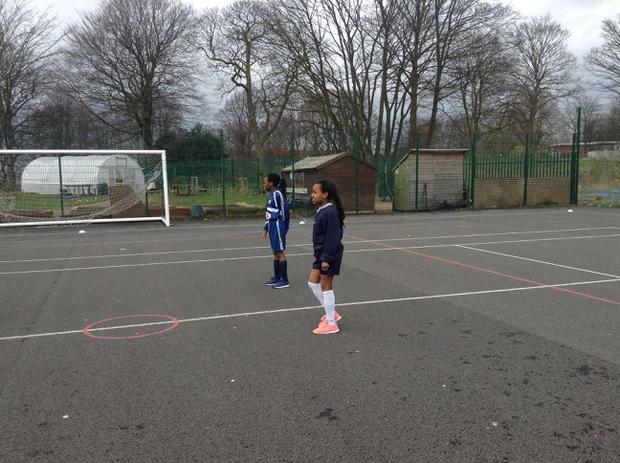 We still have a few games left to play in order to perfect our playing! 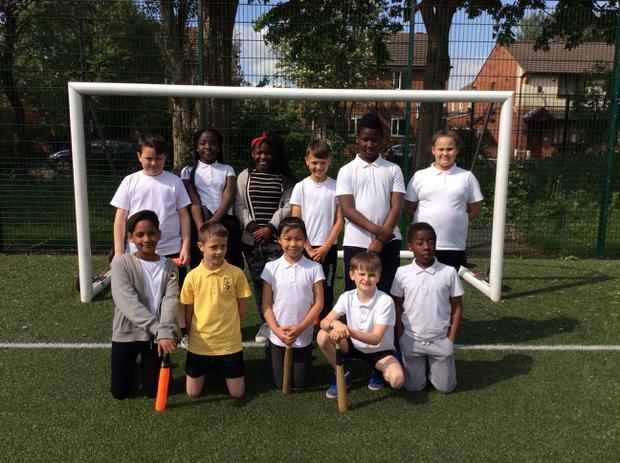 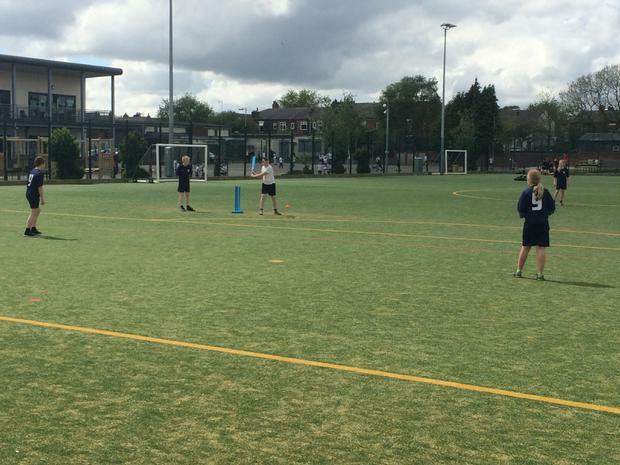 Well done to our kwik cricket team who, after very little practise, still managed to secure second place in their competition on Wednesday evening. 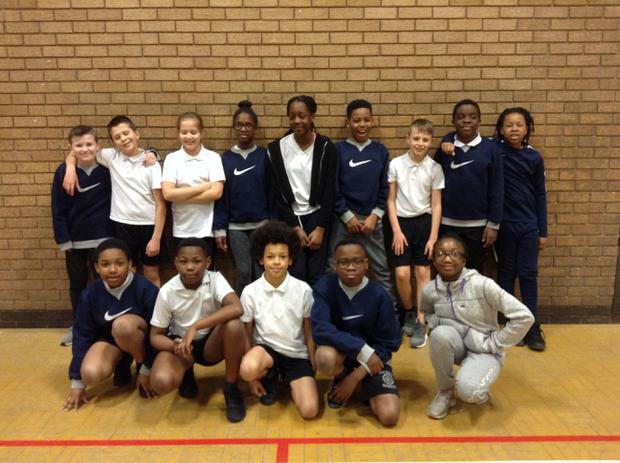 The team won their first match at St Edmund's primary school by a staggering 24 points but unfortunately lost their second match. 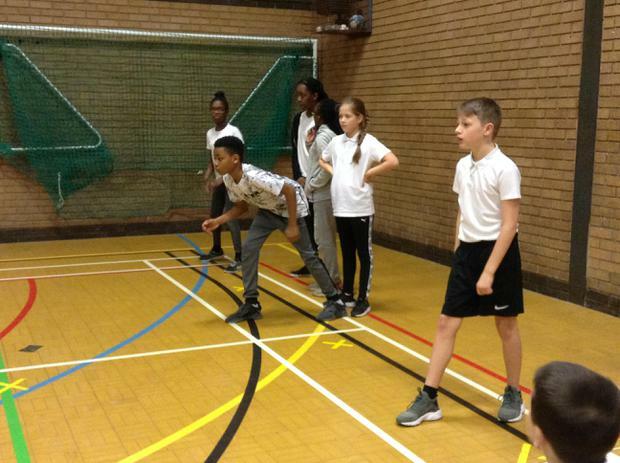 By the time the final match came though, the team had mastered working together and they were showing fantastic skills and tactics in the game. 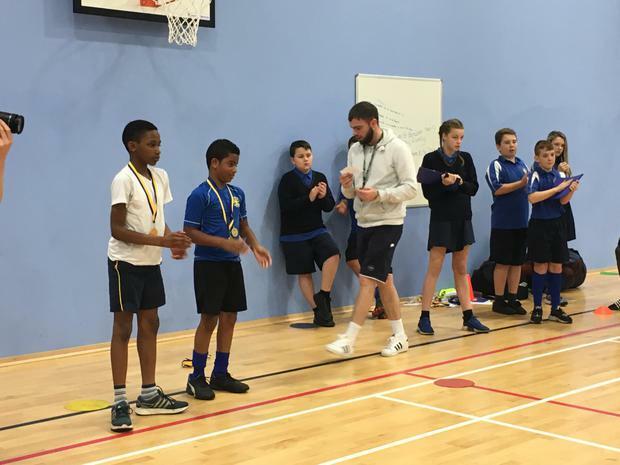 A great achievement STOC! 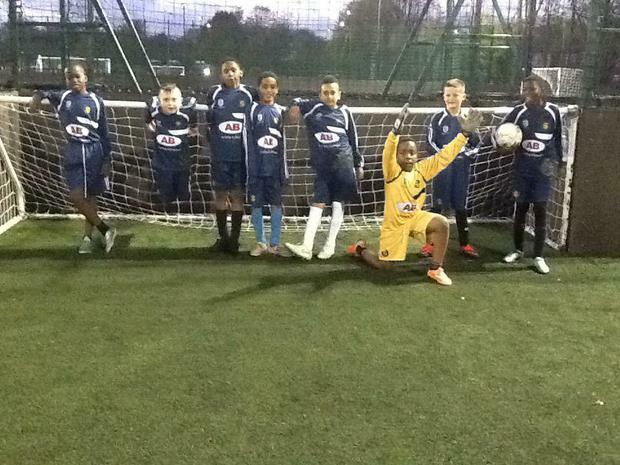 Team: William, Eyob, Robin, Nikita, Testimony, Giovanni, Troy and Thomas. 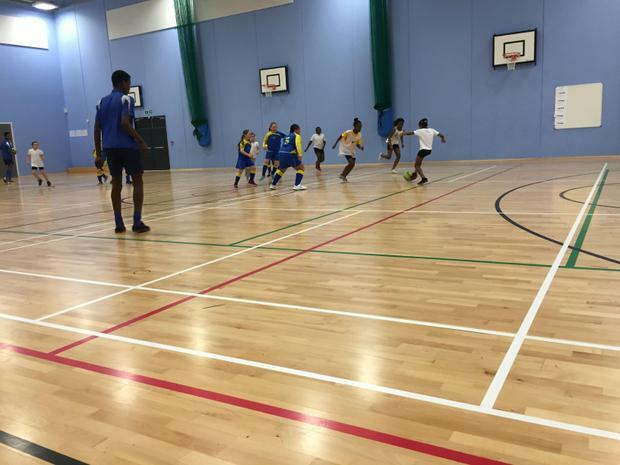 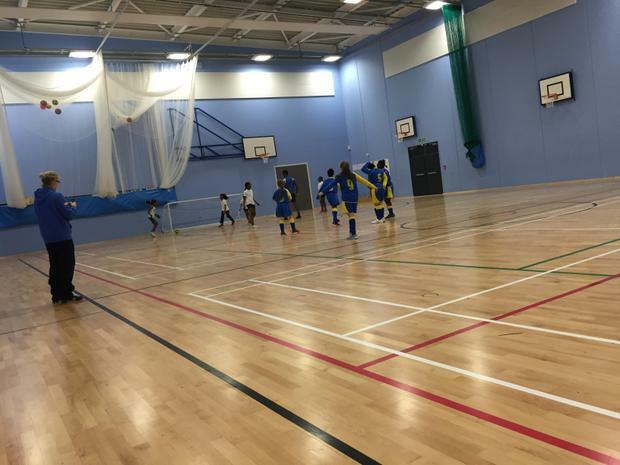 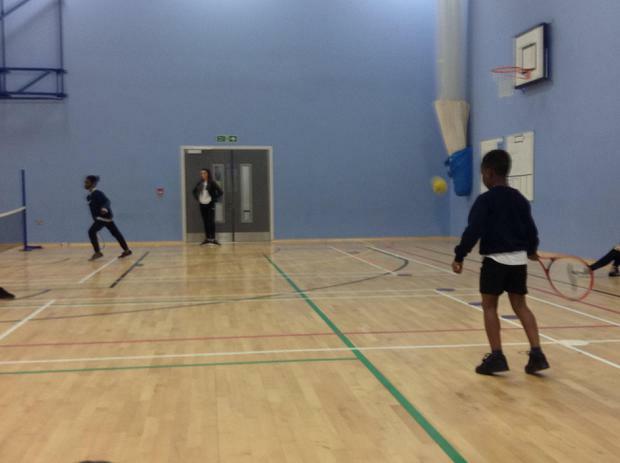 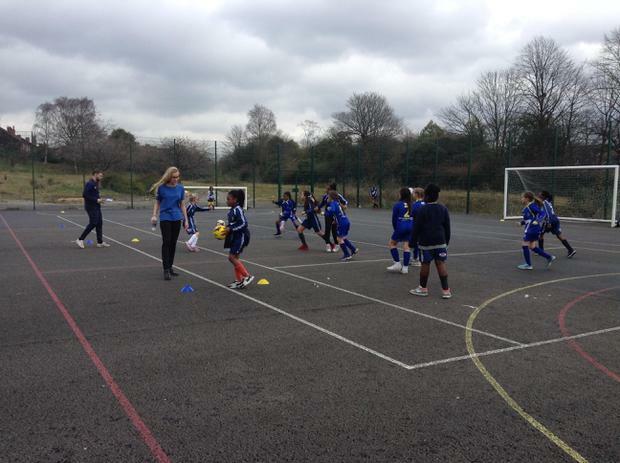 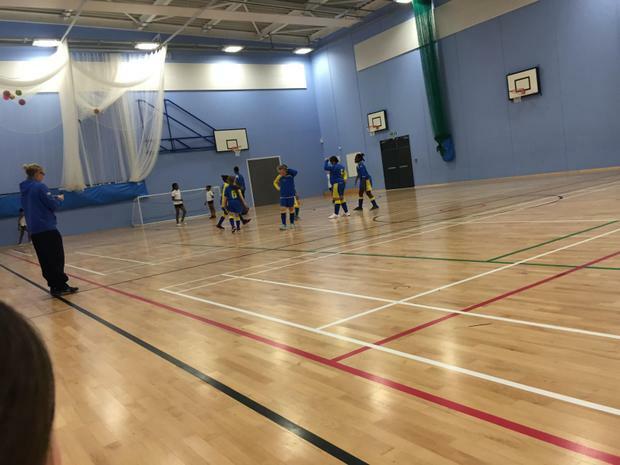 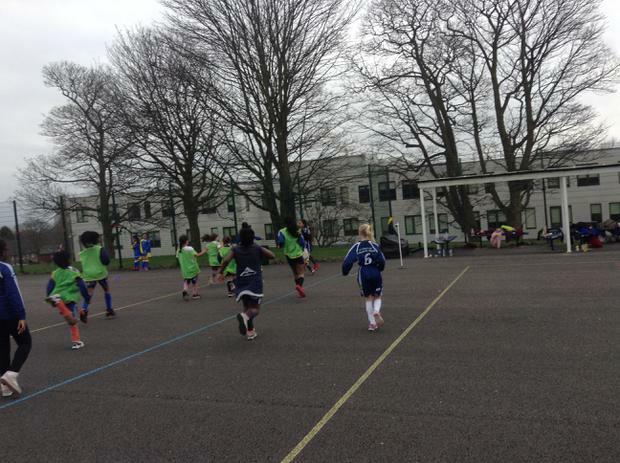 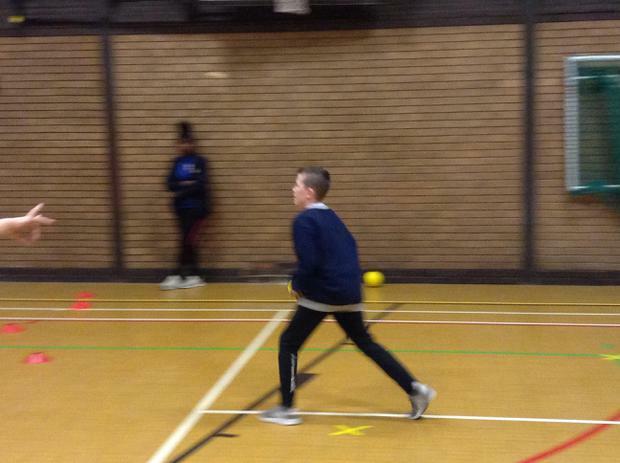 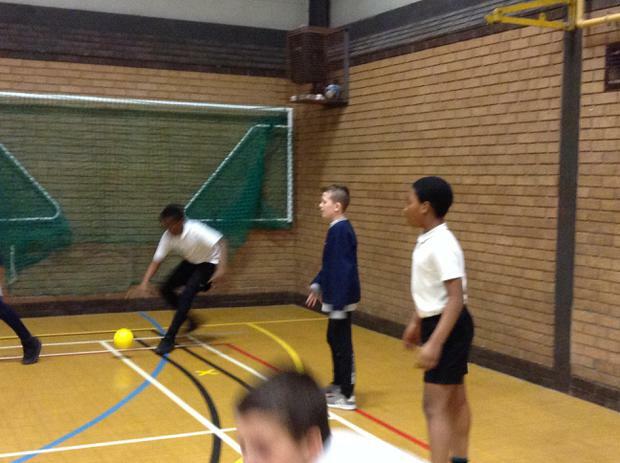 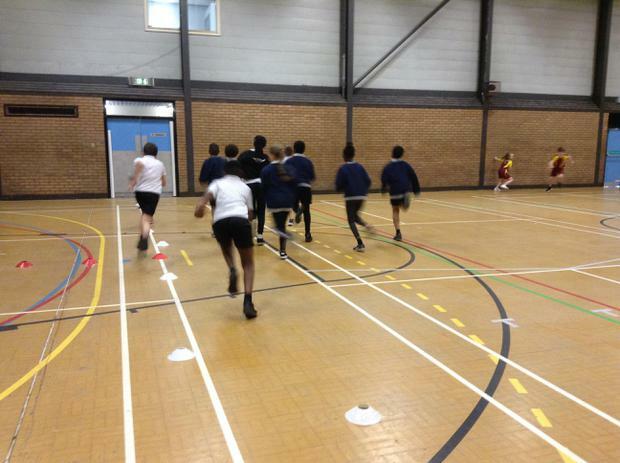 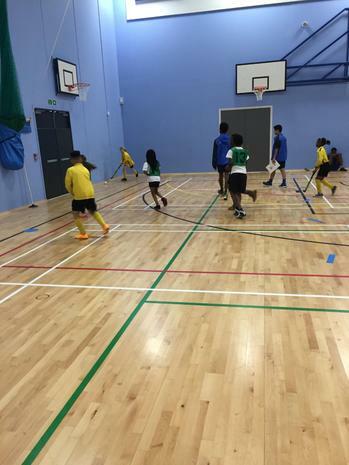 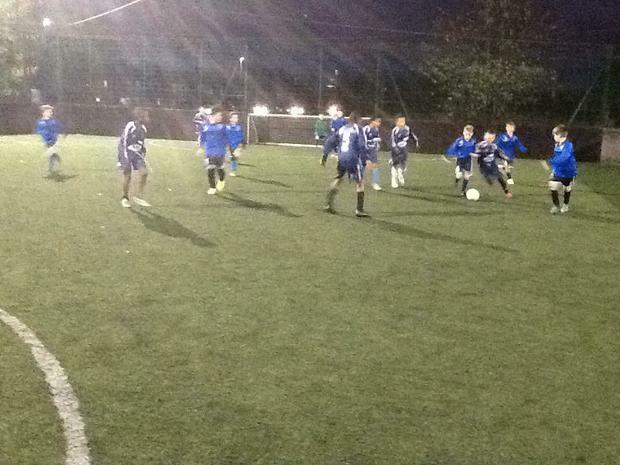 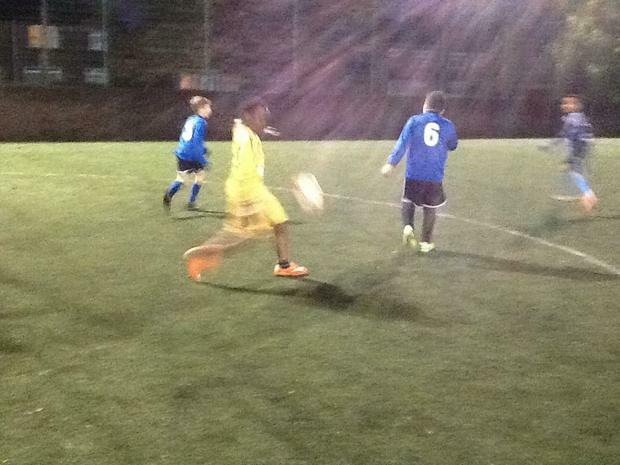 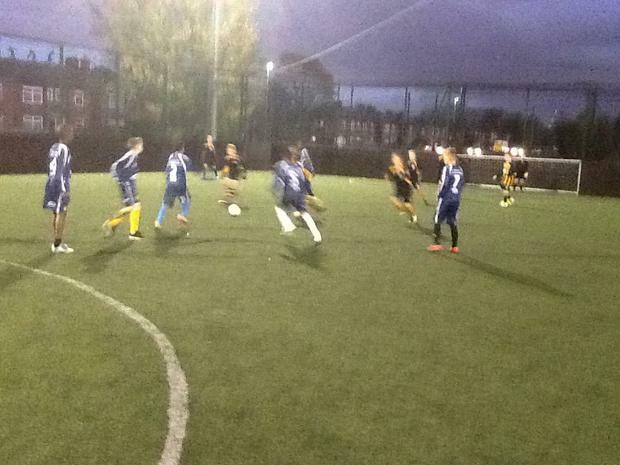 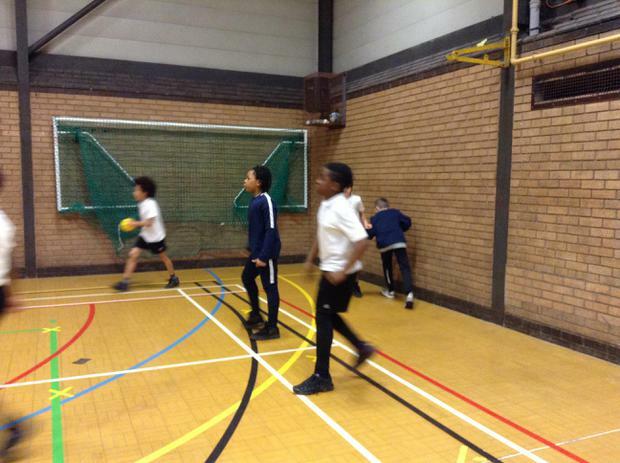 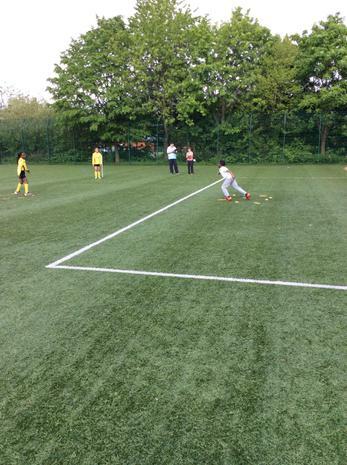 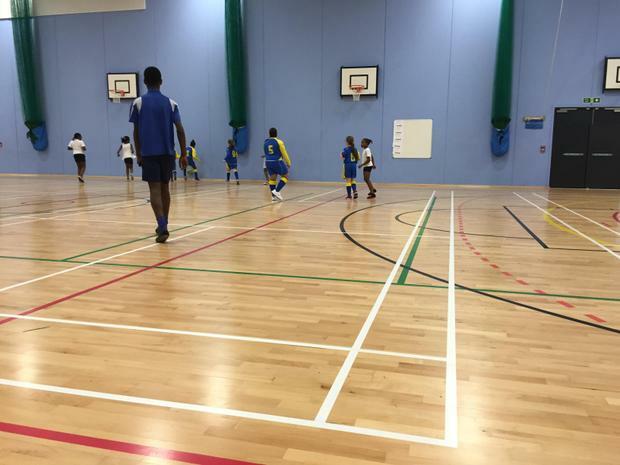 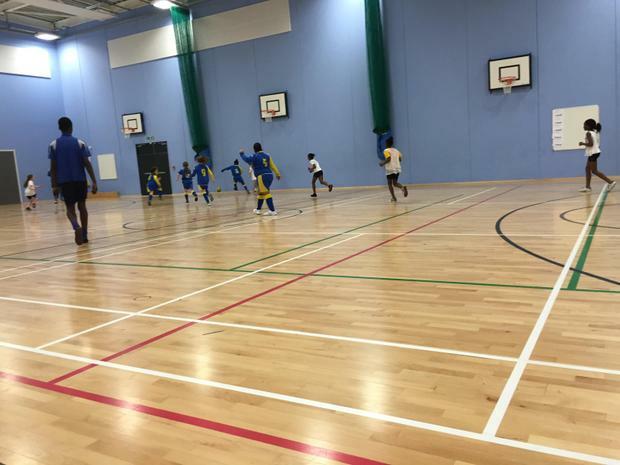 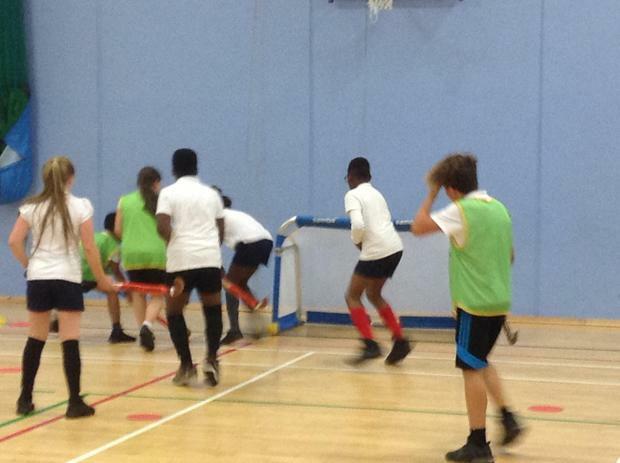 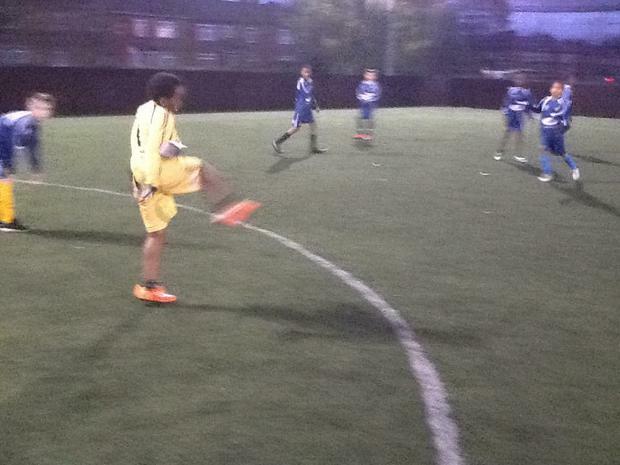 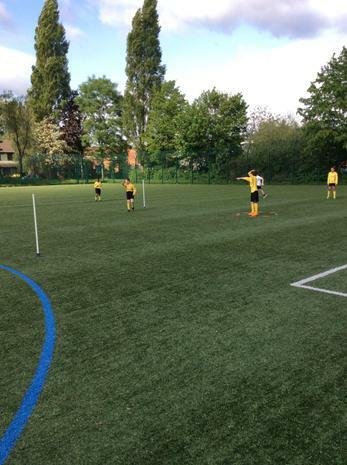 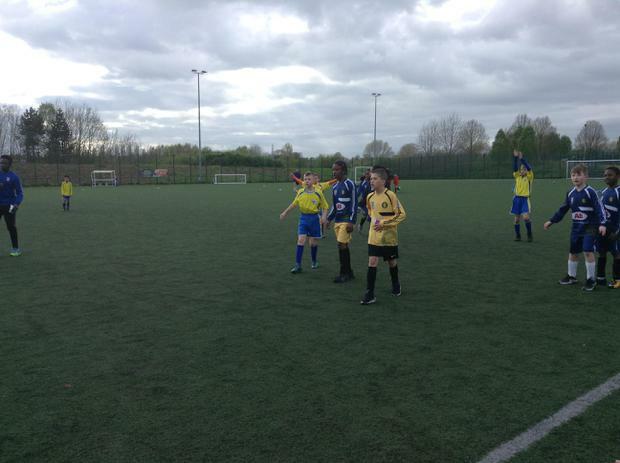 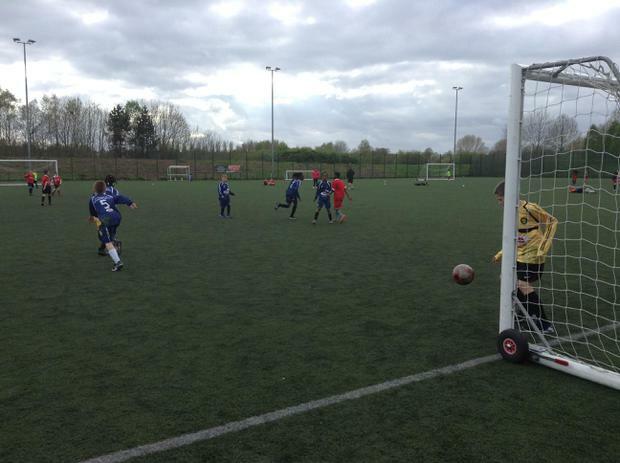 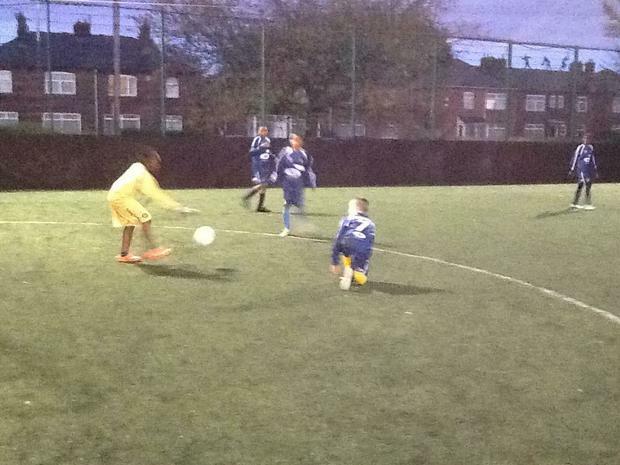 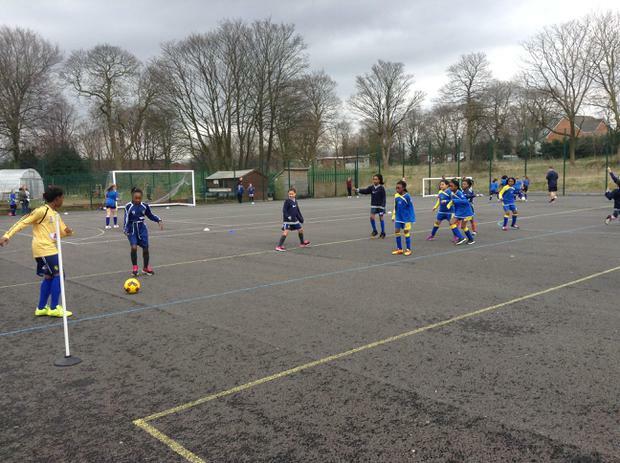 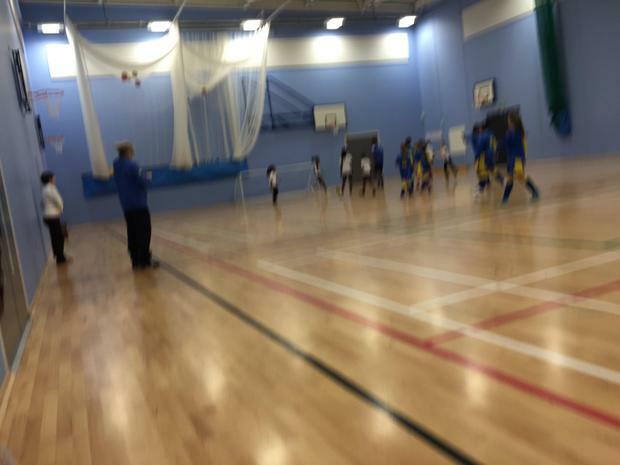 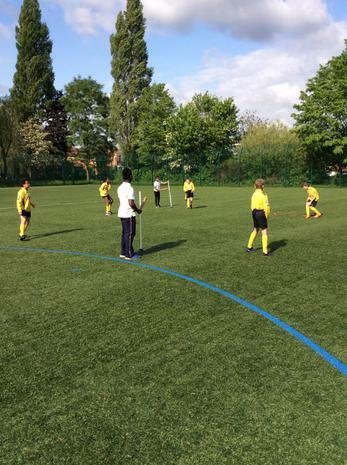 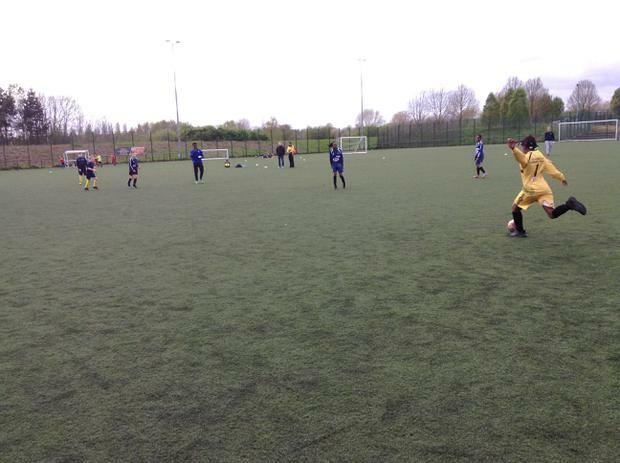 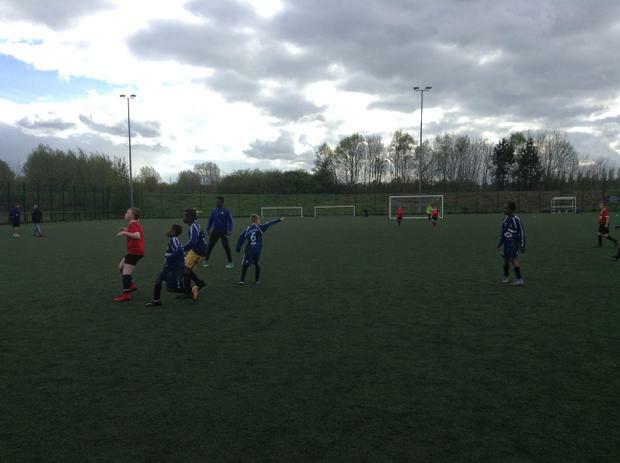 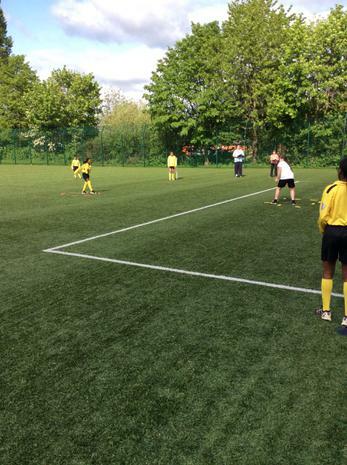 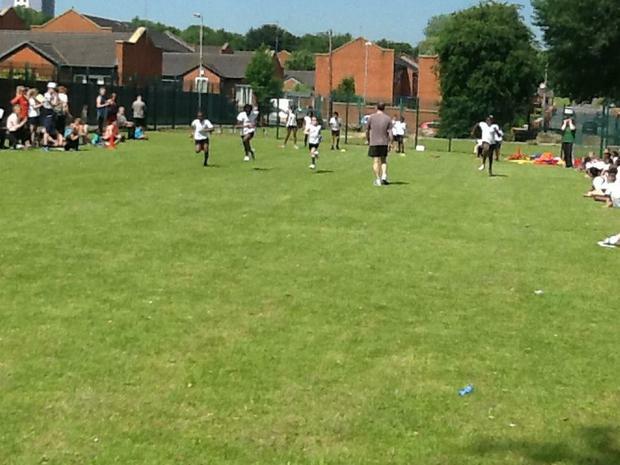 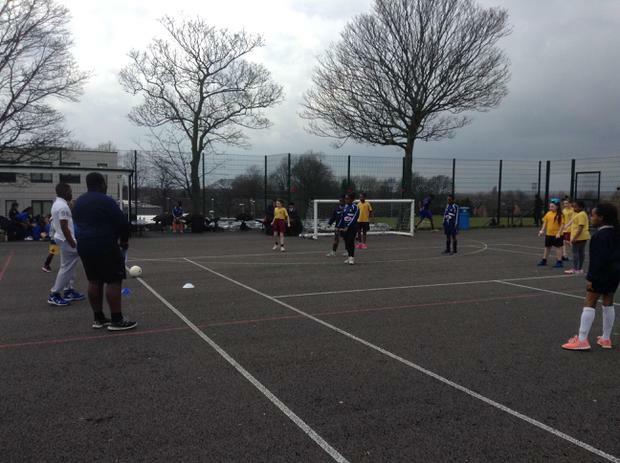 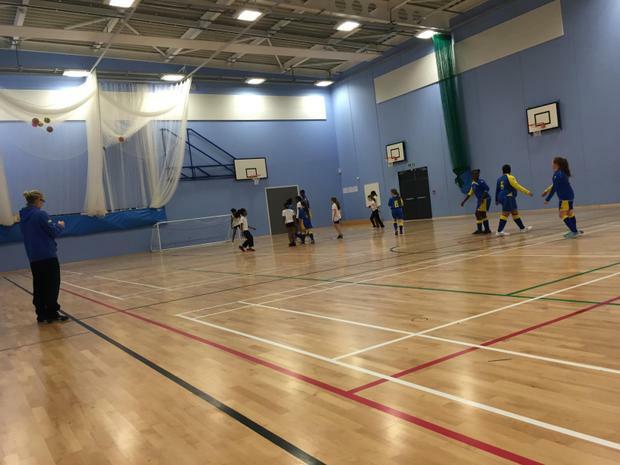 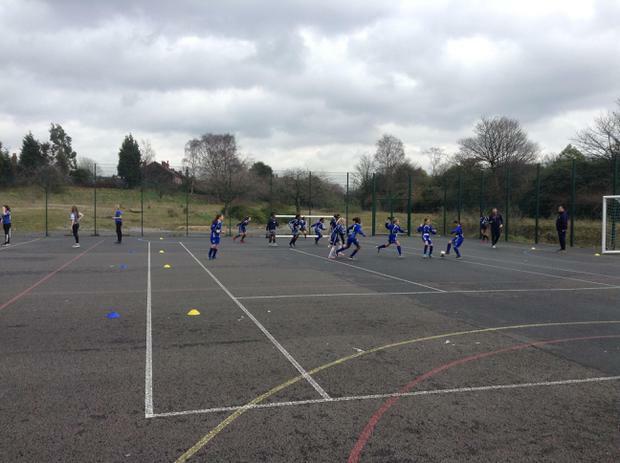 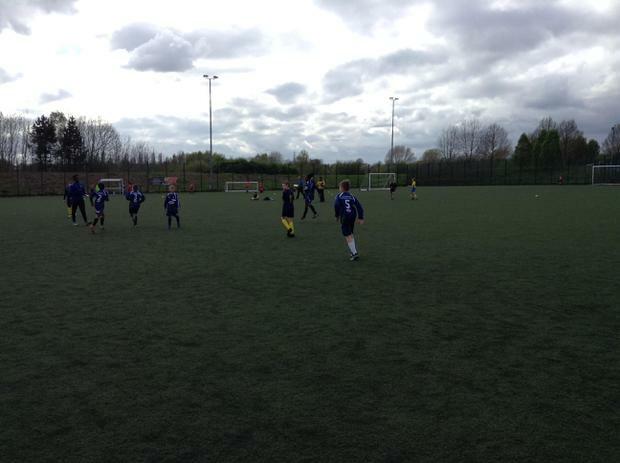 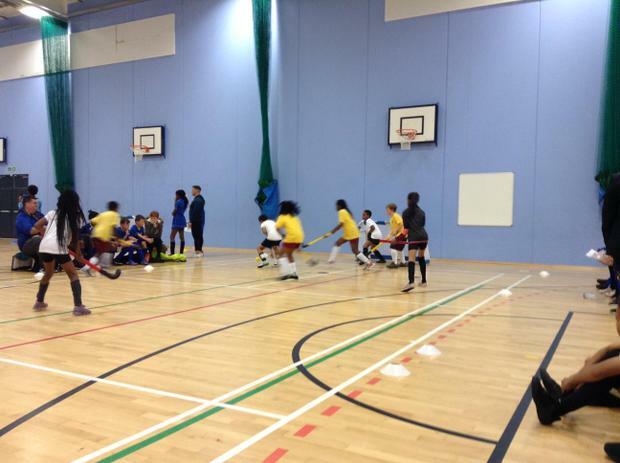 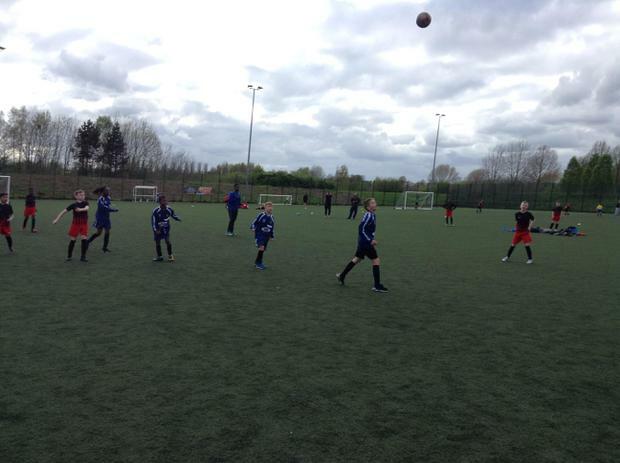 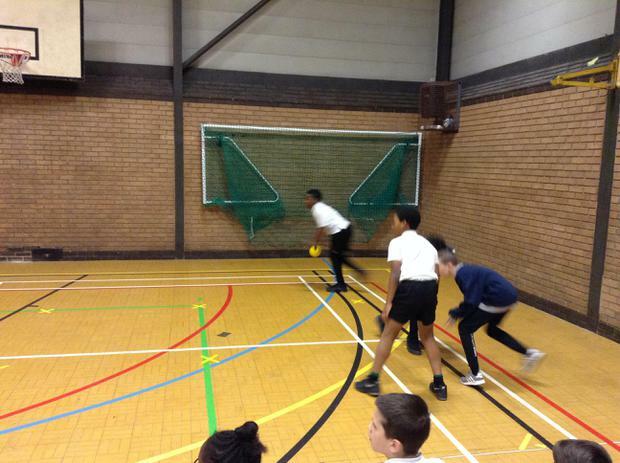 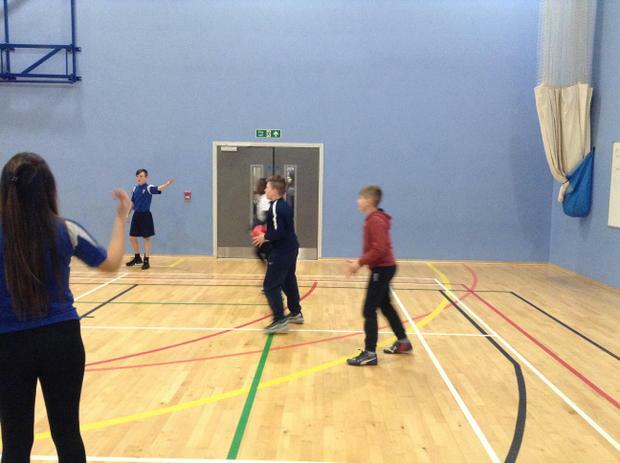 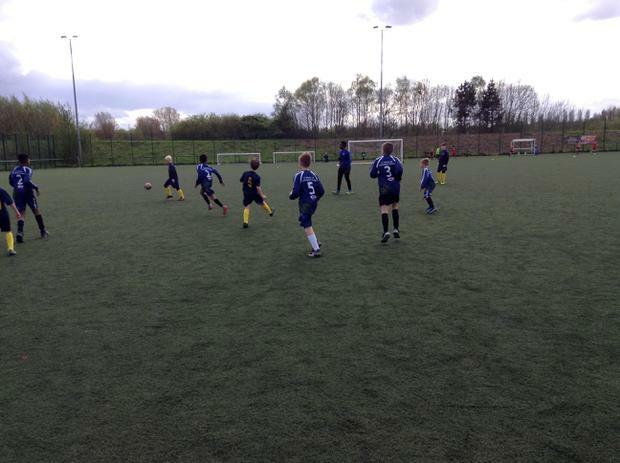 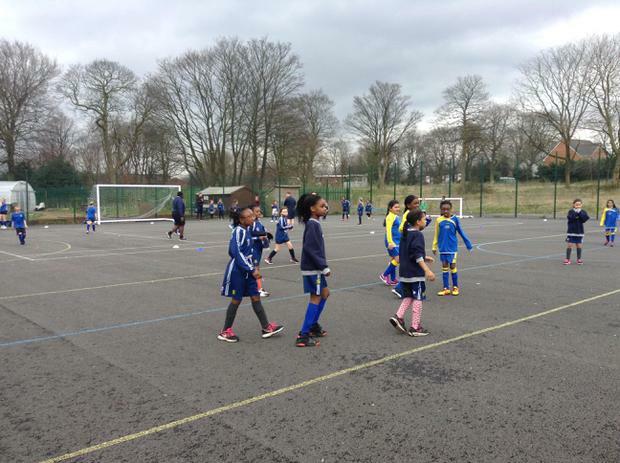 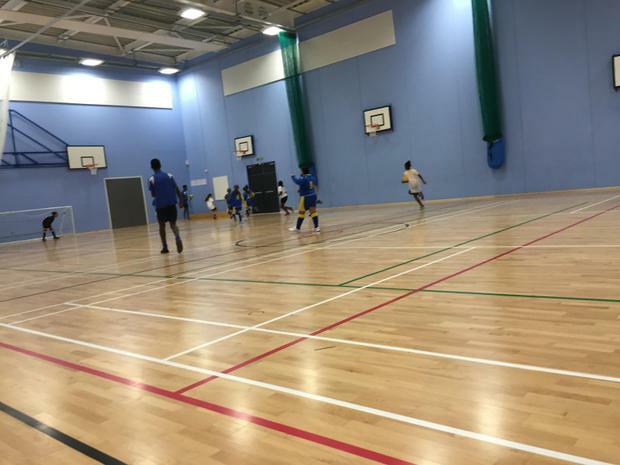 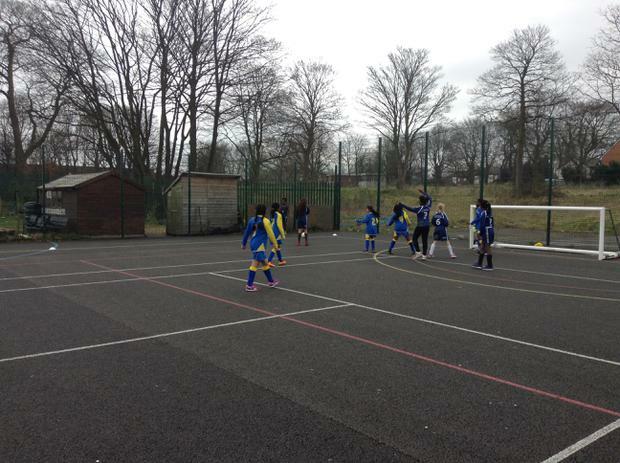 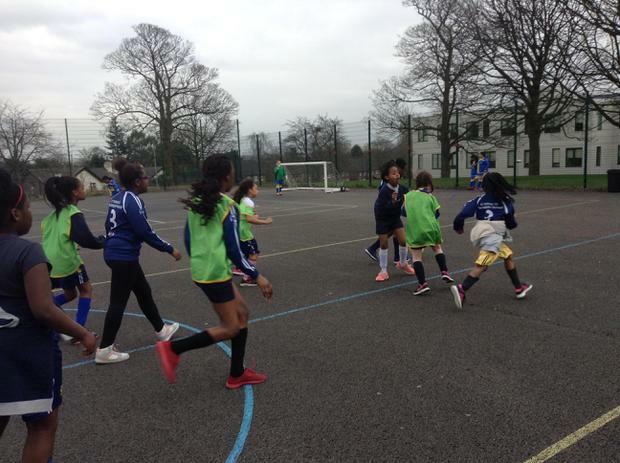 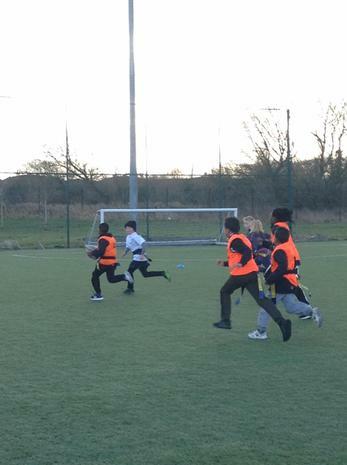 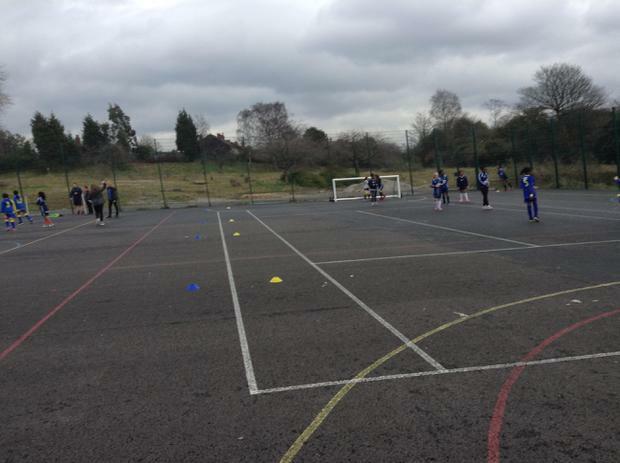 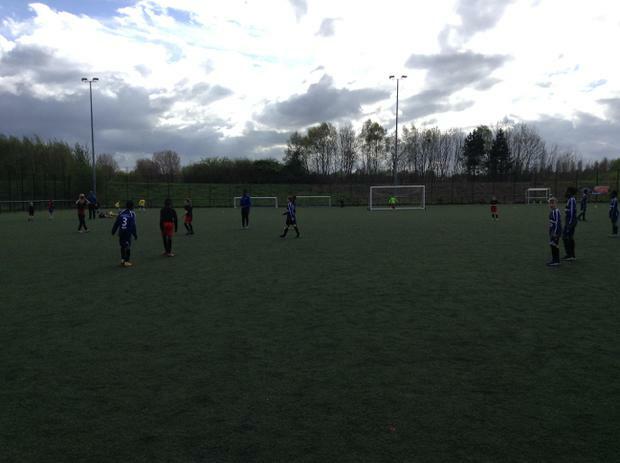 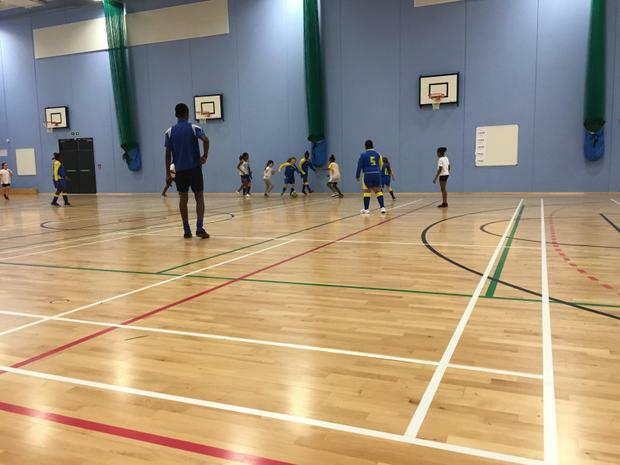 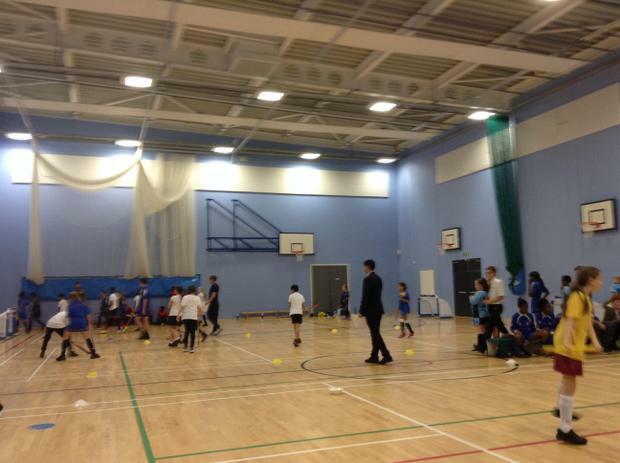 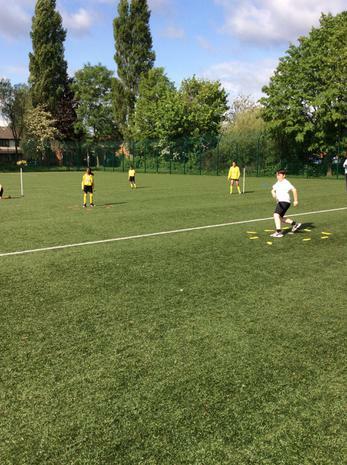 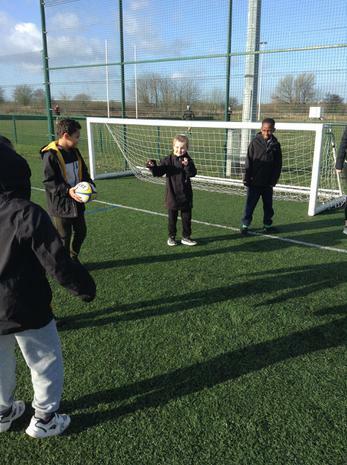 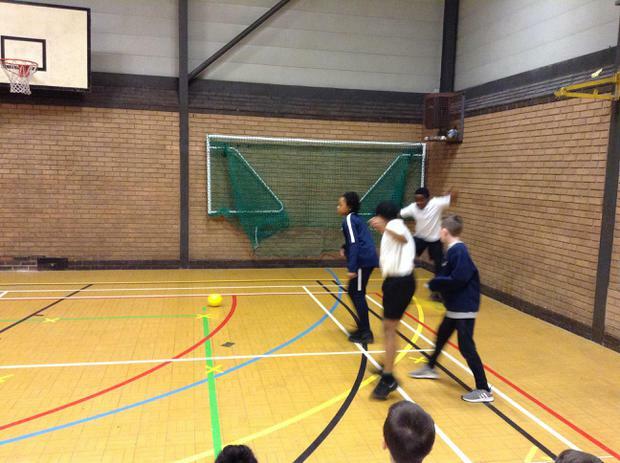 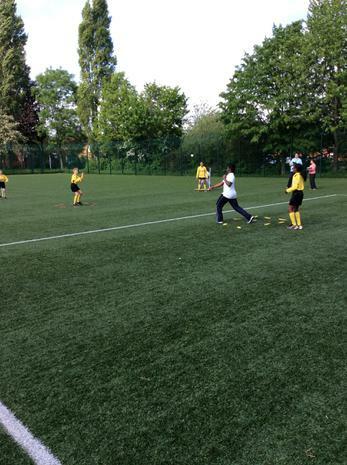 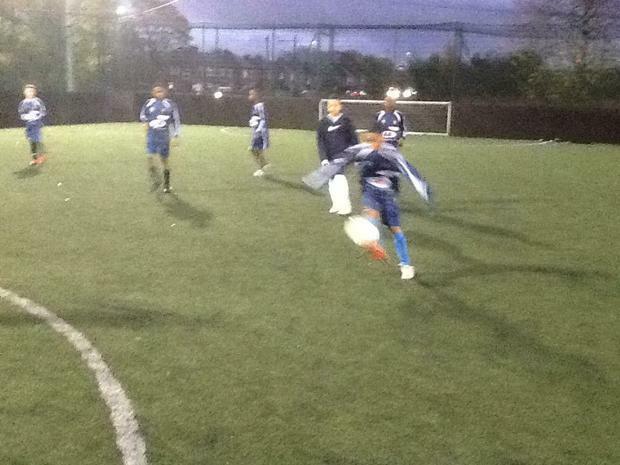 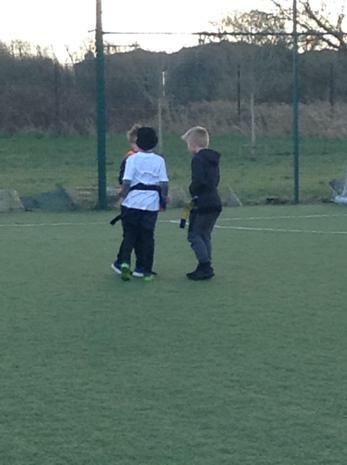 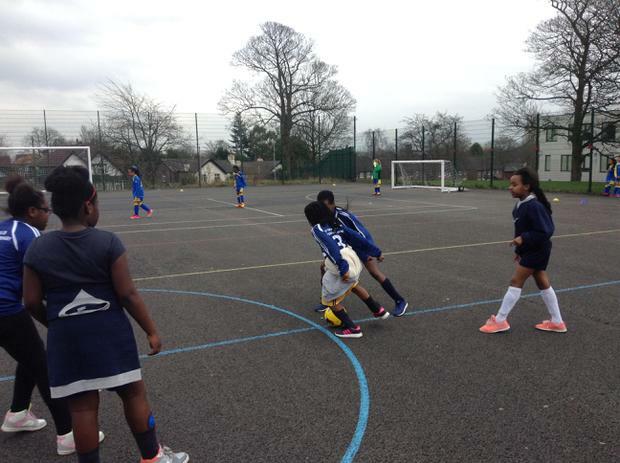 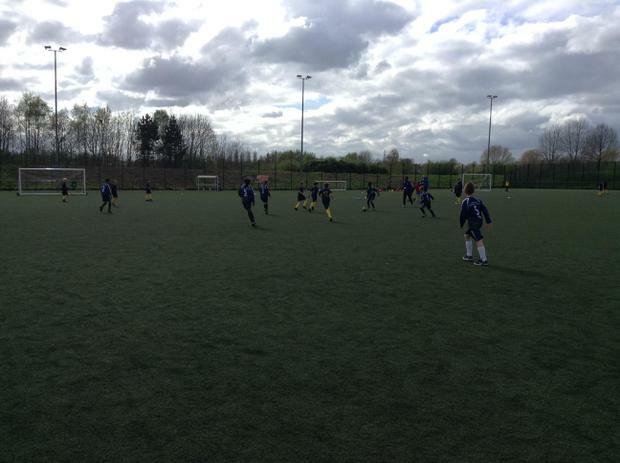 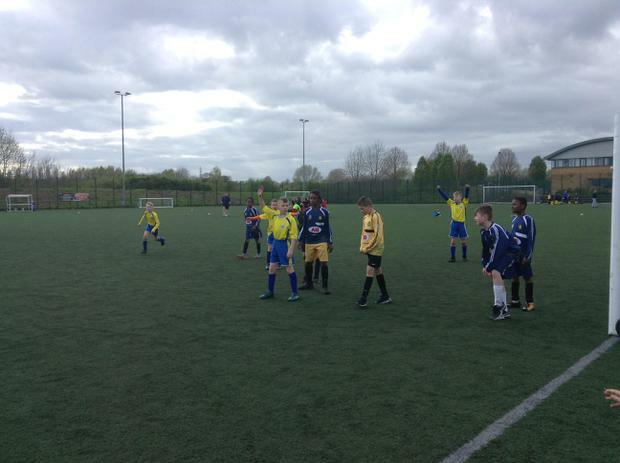 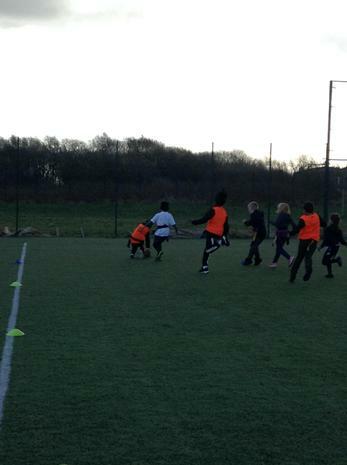 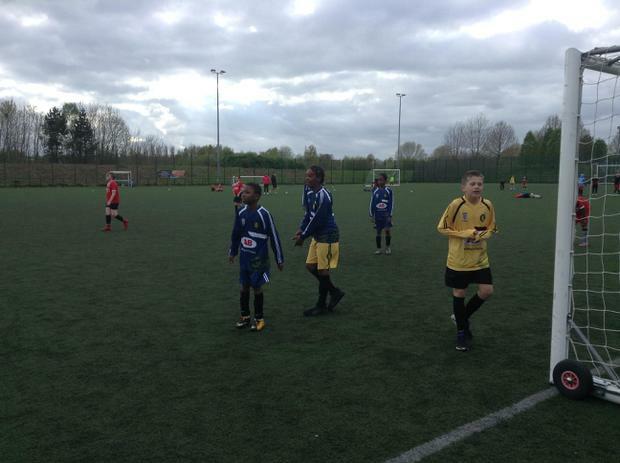 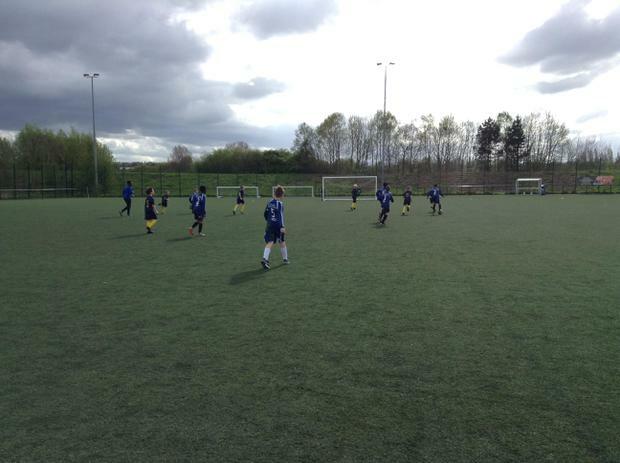 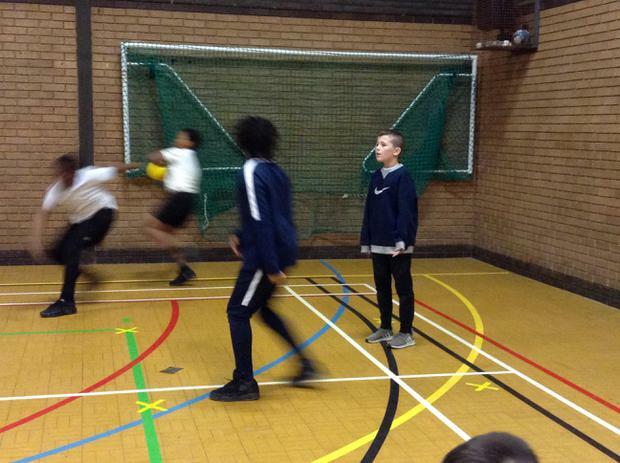 On Thursday 28th April, the boys football went to compete in their football league tournament. 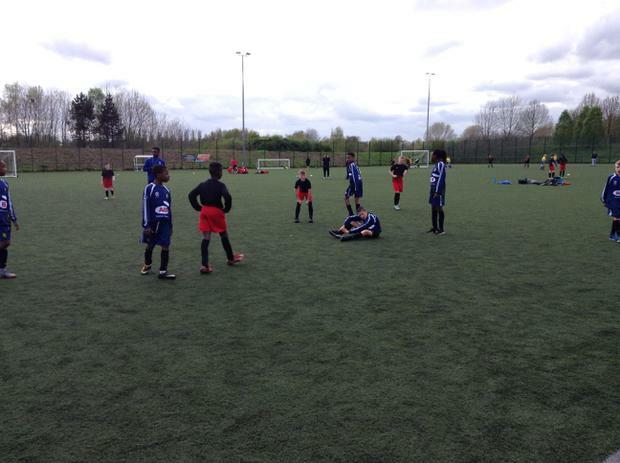 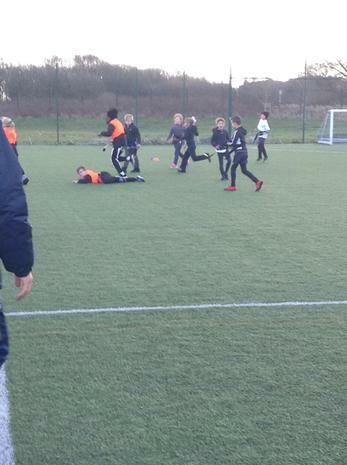 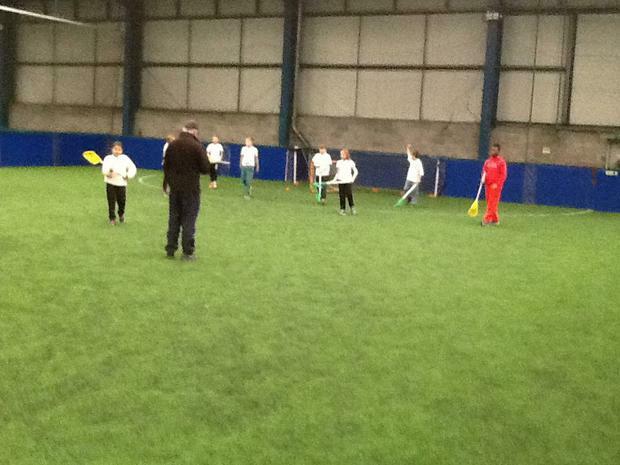 After finally making it to Salford Sports Village, the boys unfortunately lost their first game. 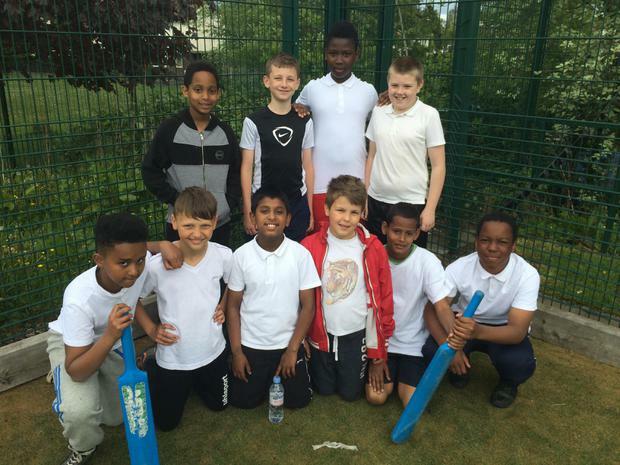 Once joined by their team mates though, STOC soon got into the swing of the game as they went on to win their second match. 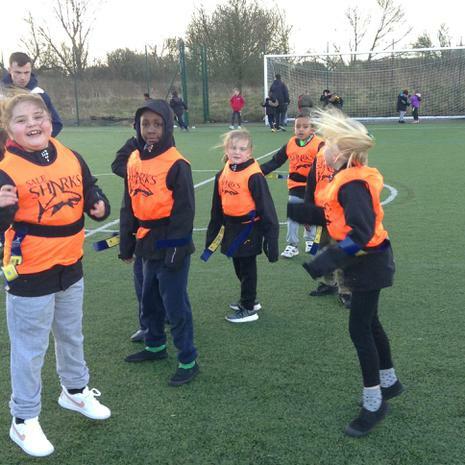 Spirits were now high despite the fact that the rain was coming down faster than ever resulting in everyone being dripping wet! 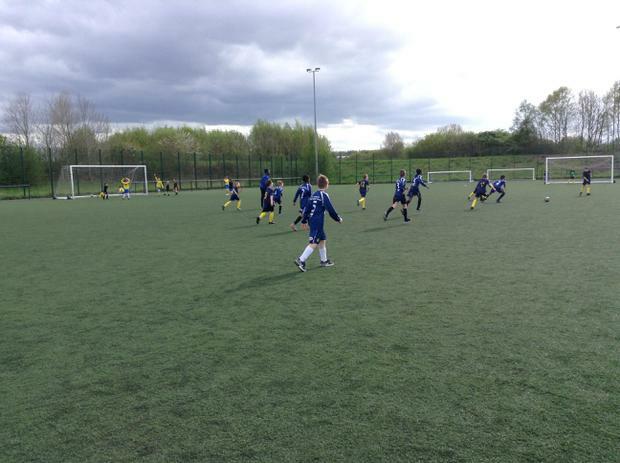 STOC went on to win their next and final two matches leaving the team second in the league. 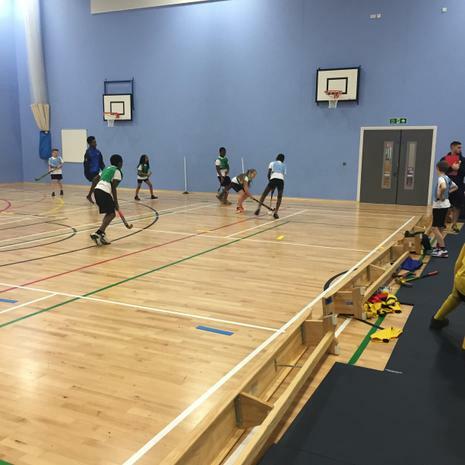 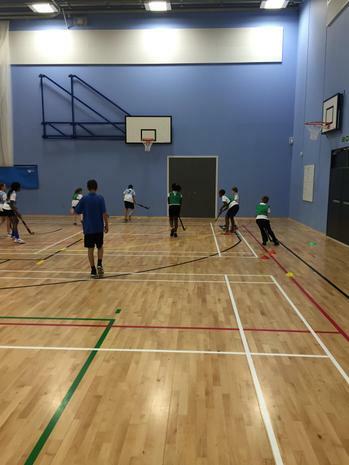 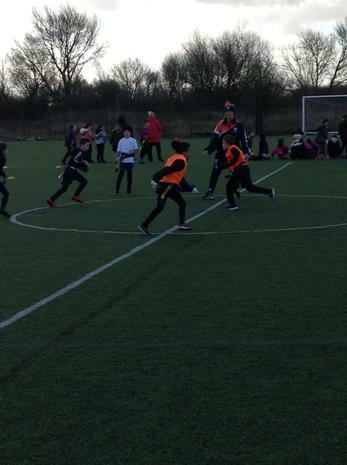 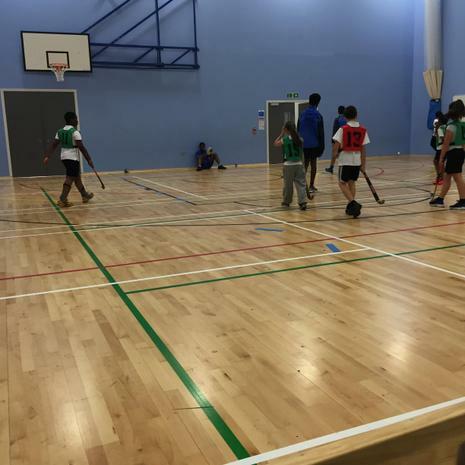 On Friday 4th March, eight of us (4 boys, 4 girls) were lucky enough to be selected to play in a Lacrosse Tournament organised by Salford Sports. 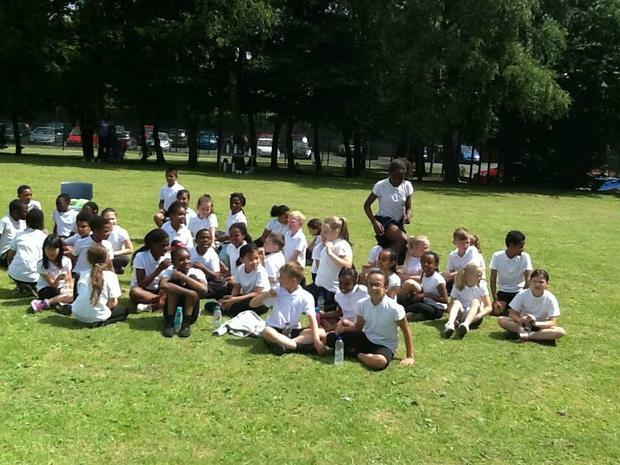 Considering we’ve only had two lessons in P.E., we think we did rather well! 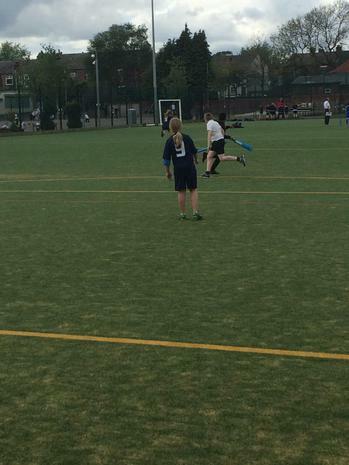 It was meant to be an outdoor tournament but, of course Friday would be the day it decided to ... 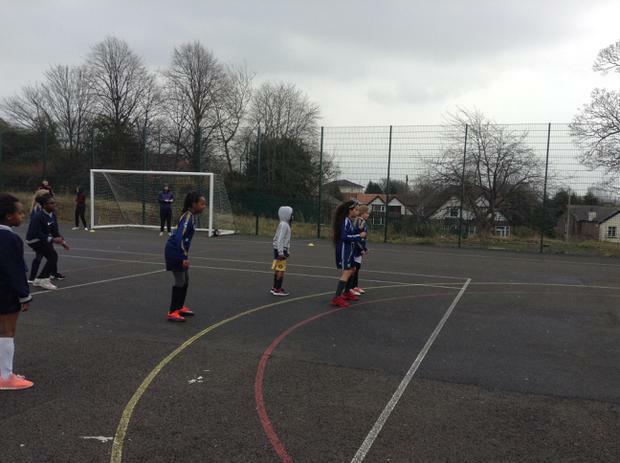 SNOW!! 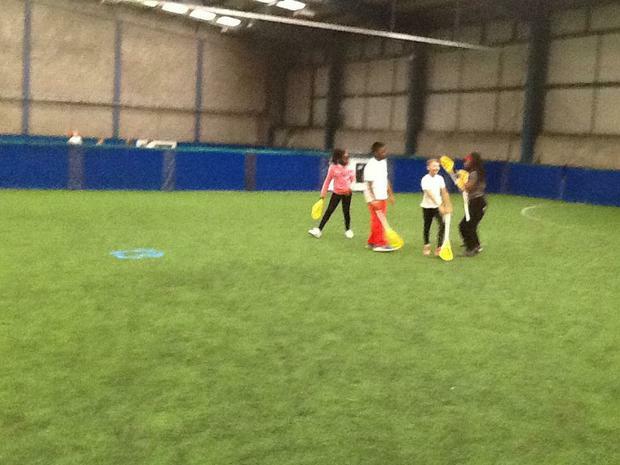 – so the venue was changed at the last minute to the Trafford Soccerdome. 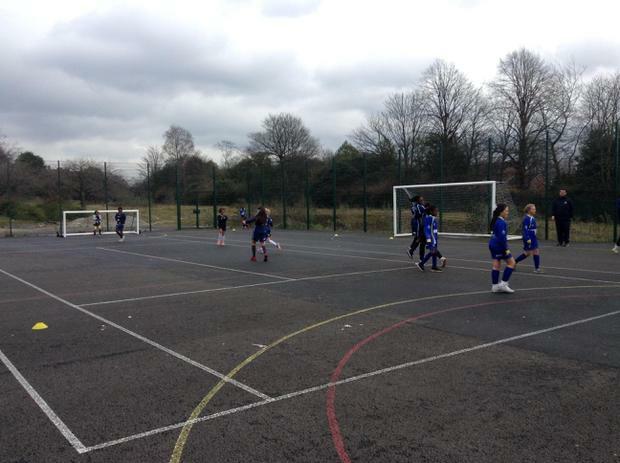 While this was great in that it meant we didn’t freeze, it also made the first couple of games more difficult because we’re not used to playing on Astroturf. 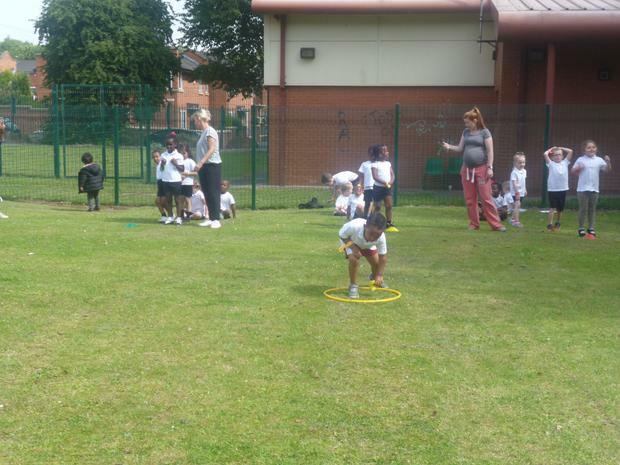 It was really tricky getting the hang of scooping the ball off the plastic grass. 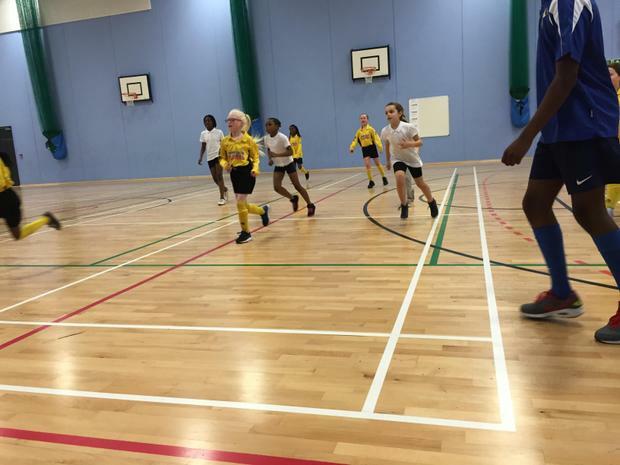 However, we worked really well as a team and were so proud of ourselves when we qualified through the group stage to reach the quarter-finals. 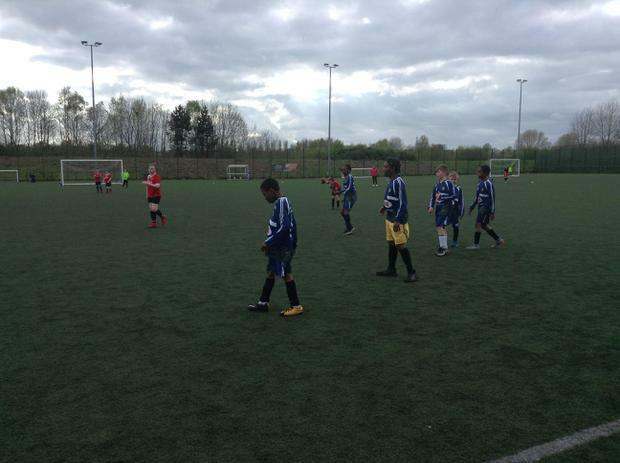 Unfortunately, we then came up against the best team in the competition and were knocked out. 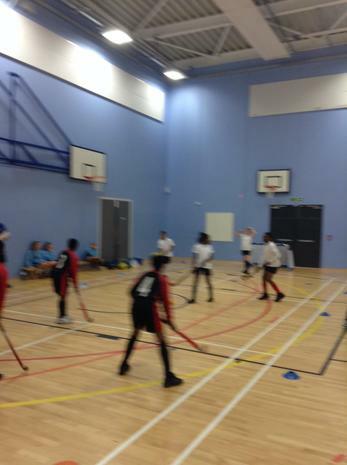 There were definitely some high points though and Nikita was overjoyed when he scored a spectacular goal from the corner. 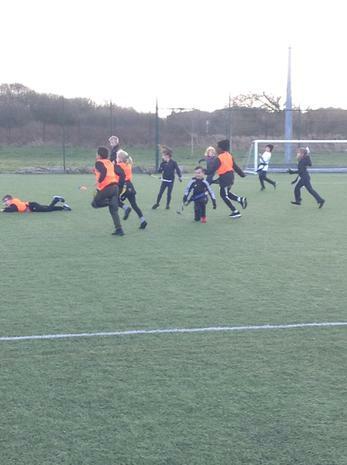 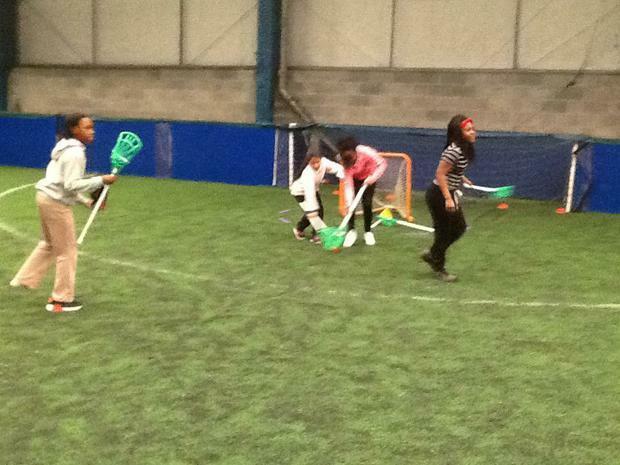 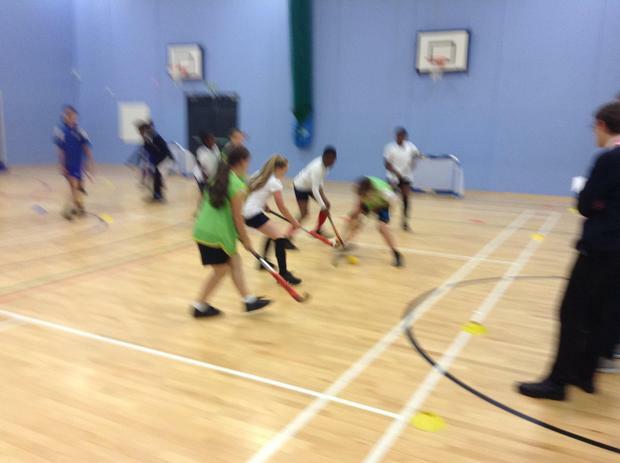 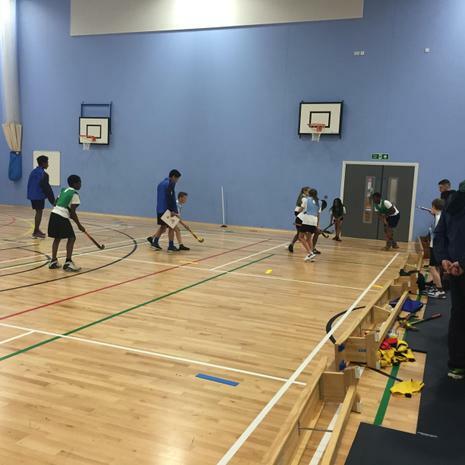 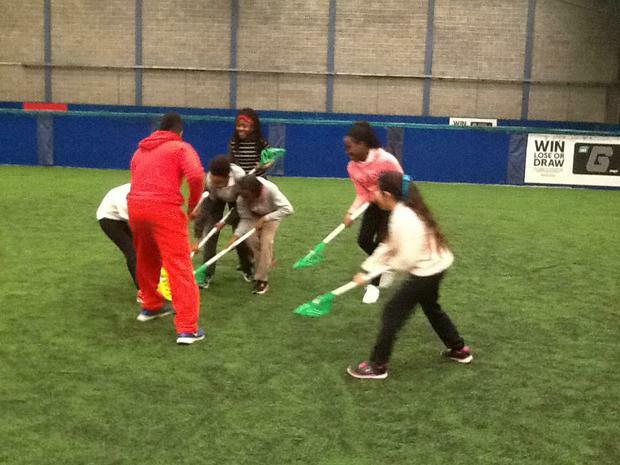 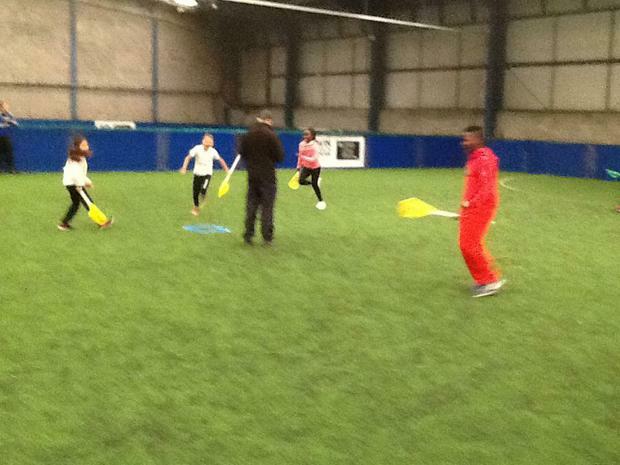 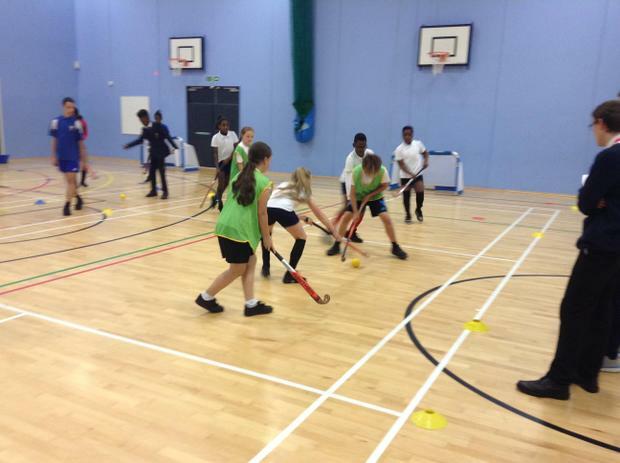 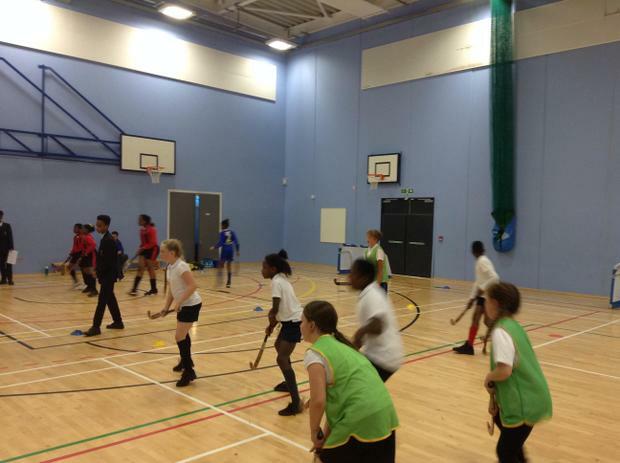 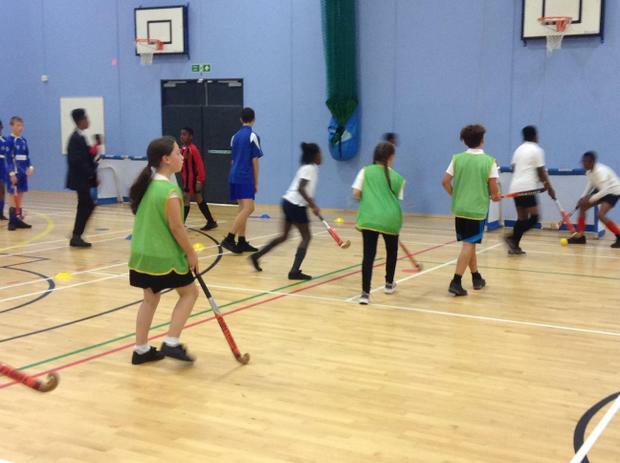 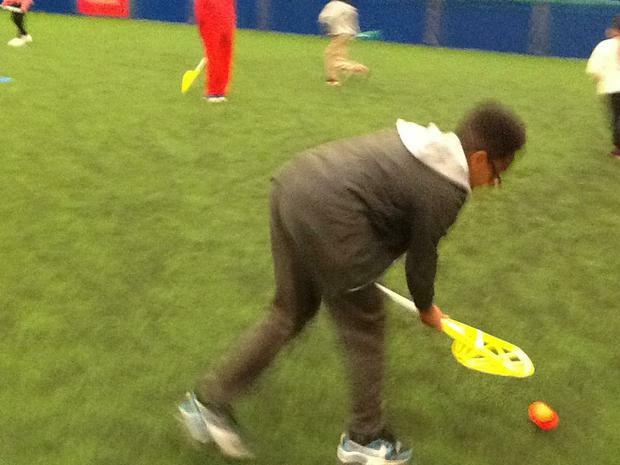 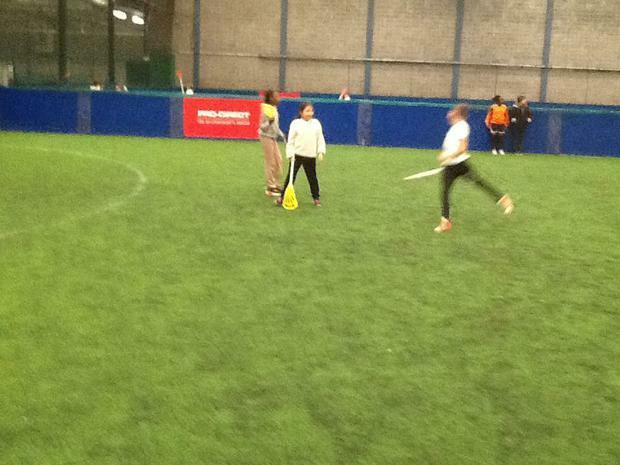 All in all, we’d say that Lacrosse is a great sport and we’d love to carry on learning more in P.E. 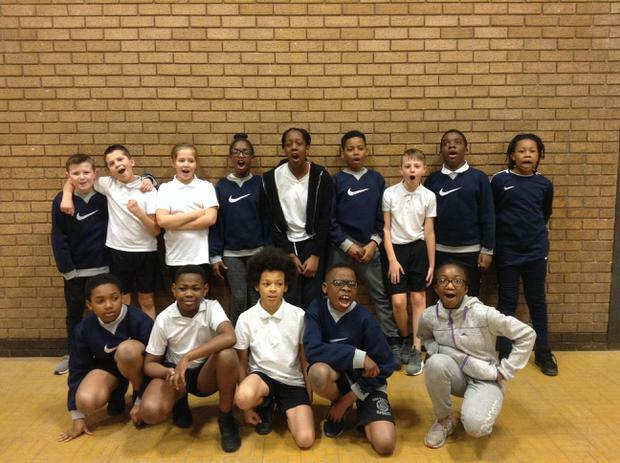 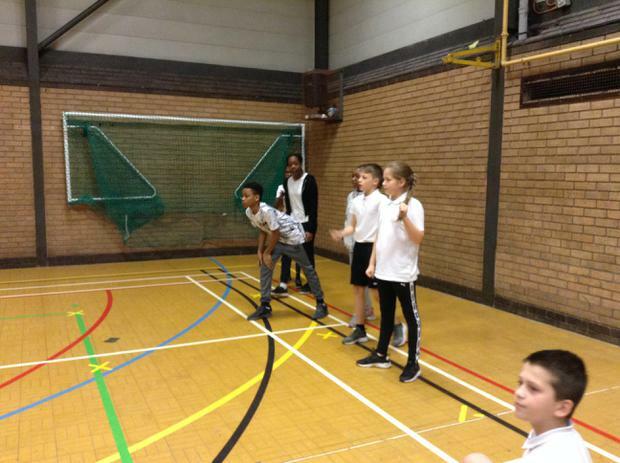 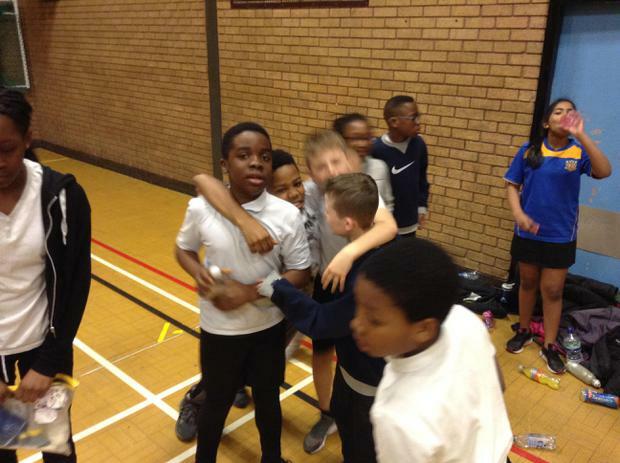 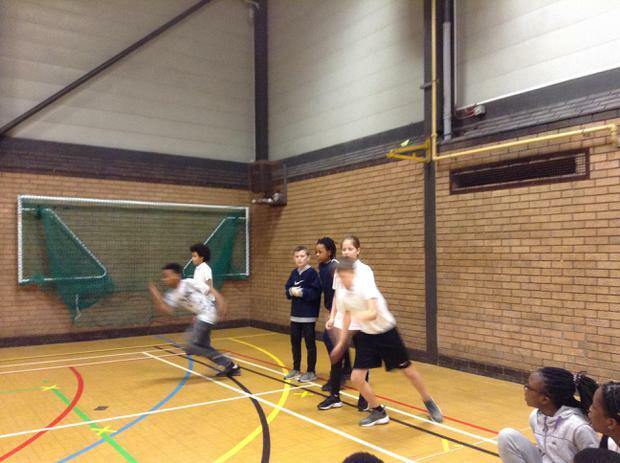 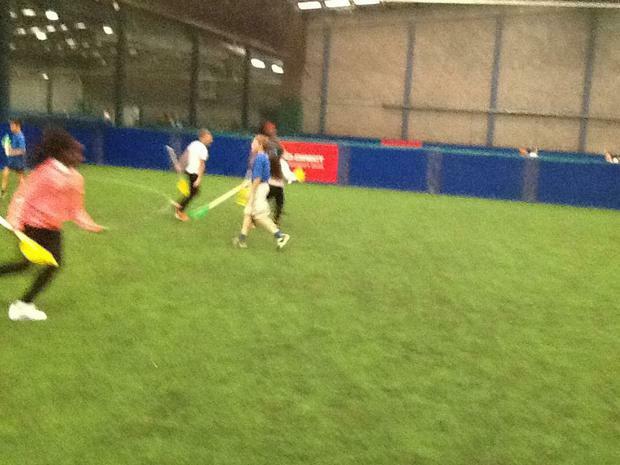 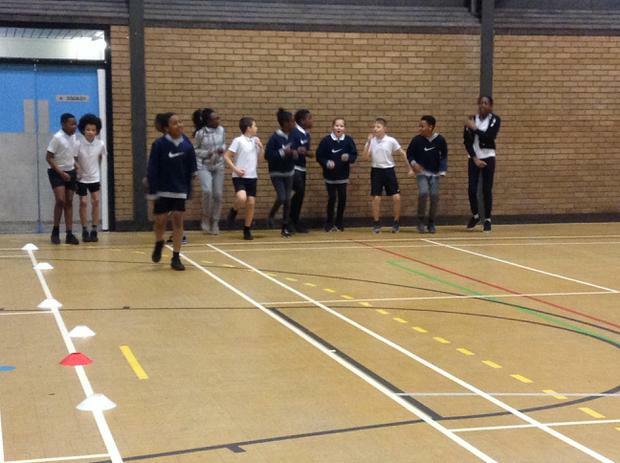 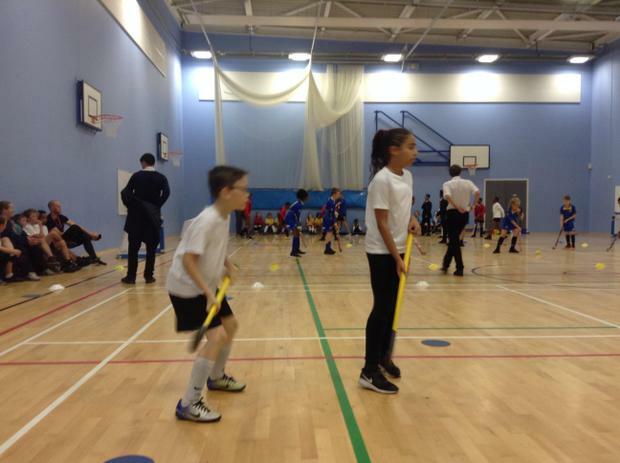 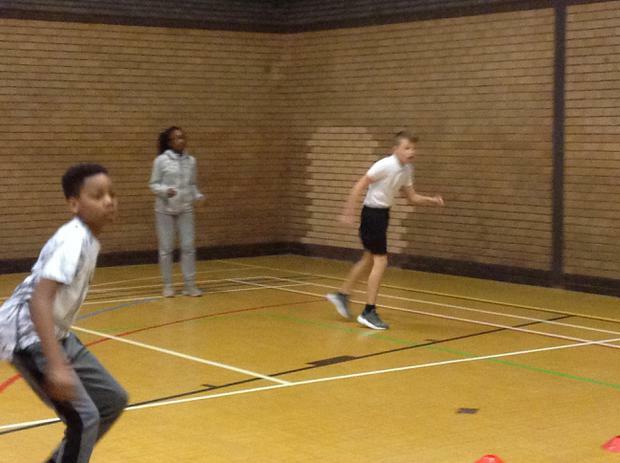 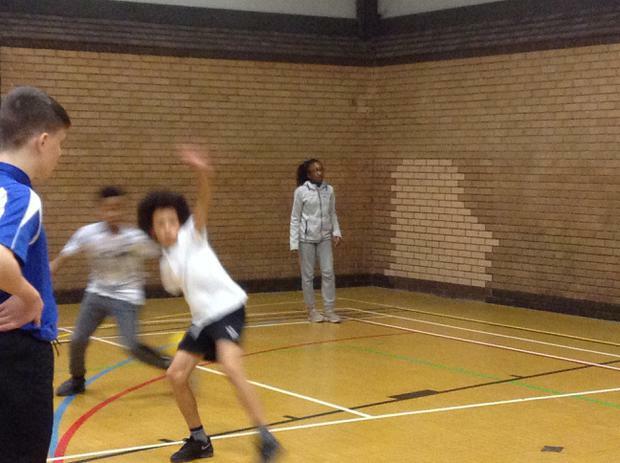 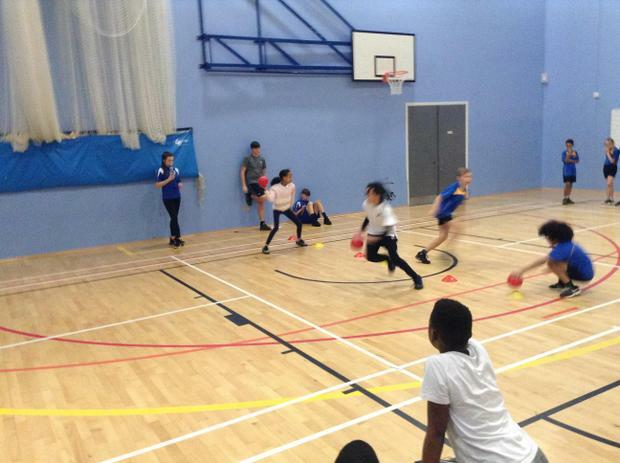 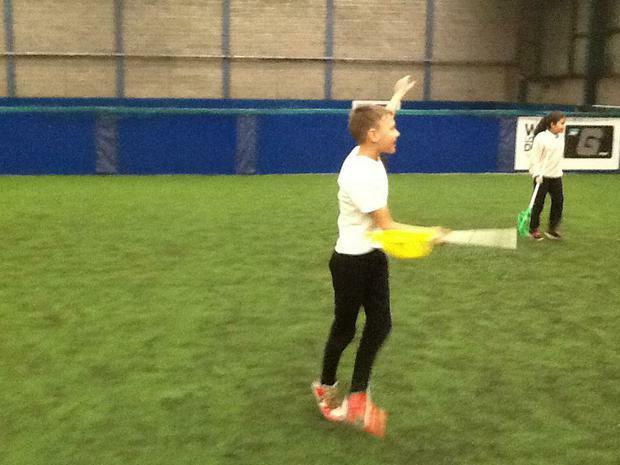 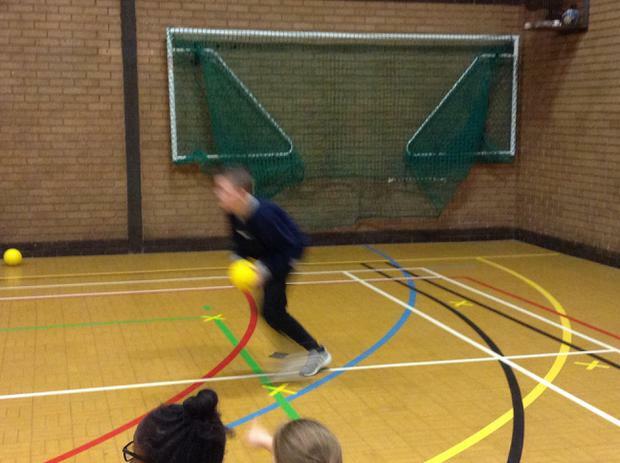 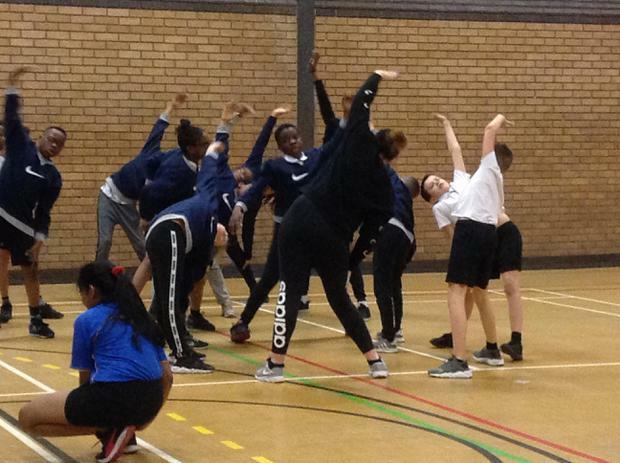 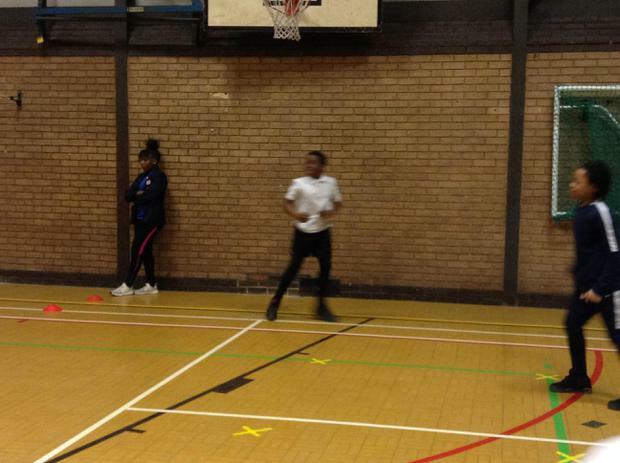 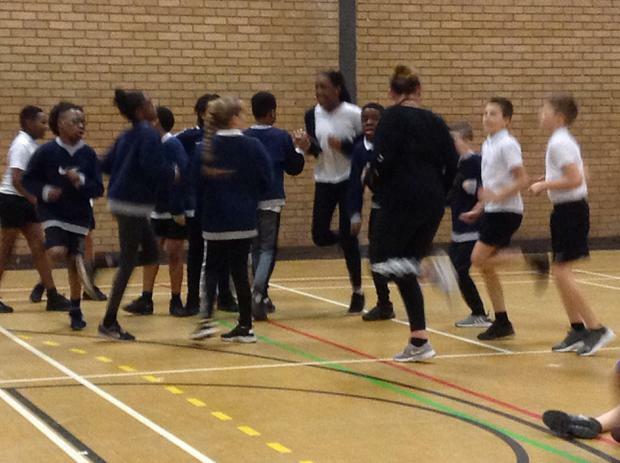 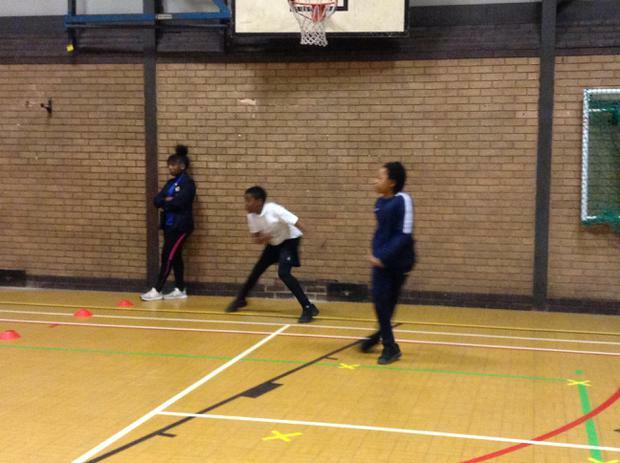 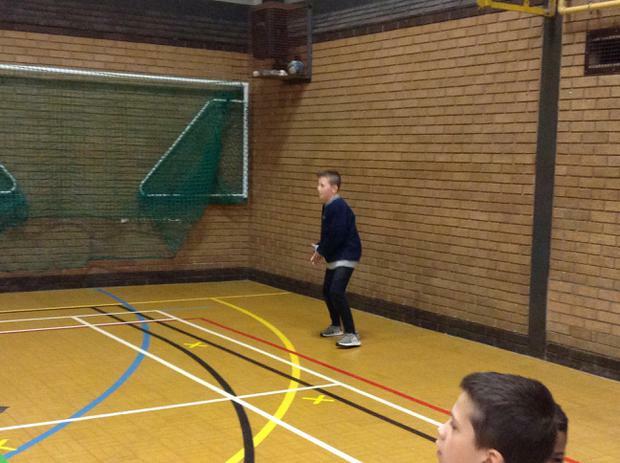 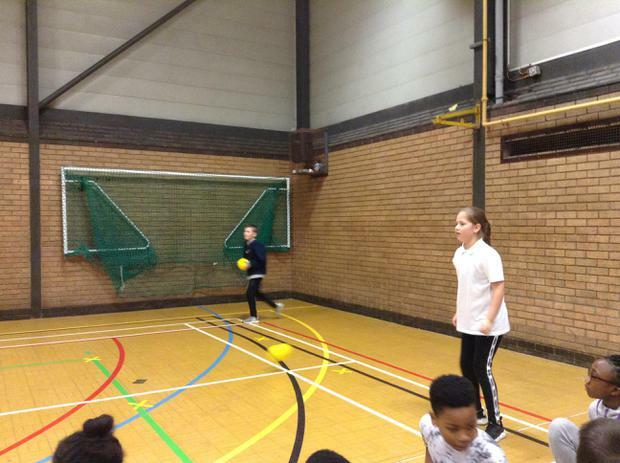 Loads of fun was had by all at the Sporshall Athletics event that was held at Irlam Leisure Centre on Tuesday 19th January 2016. 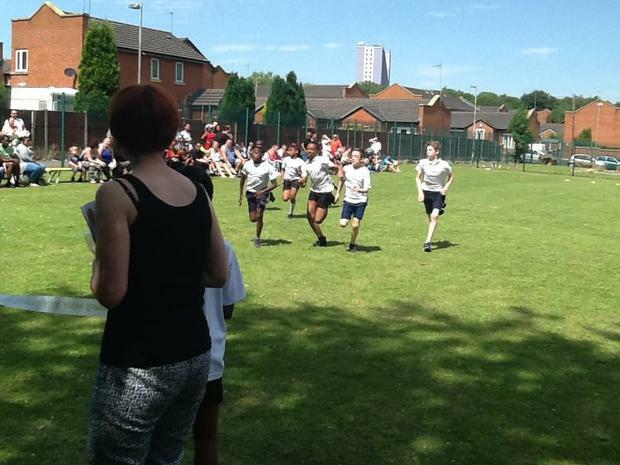 9 boys and 9 girls participated in the competition, which consisted of both field and track events. It was clear that we had some tough competition from the other five schools but we obtained some great results in the individual races and we can't wait to come back with a vengeance next year! 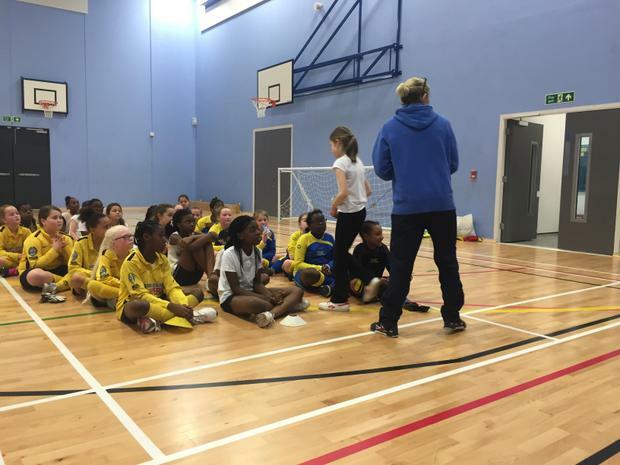 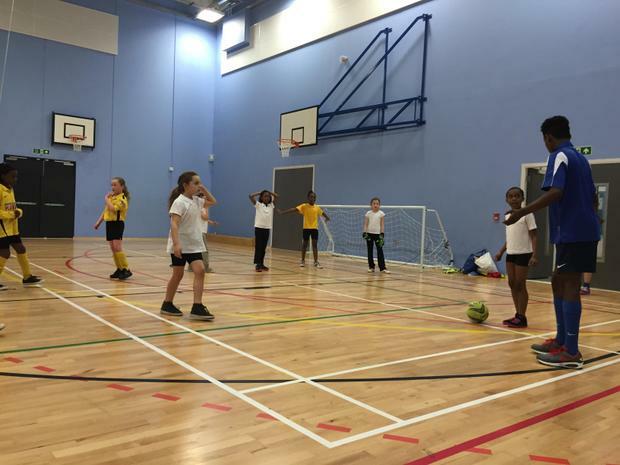 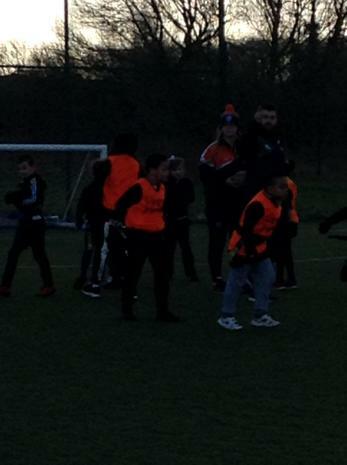 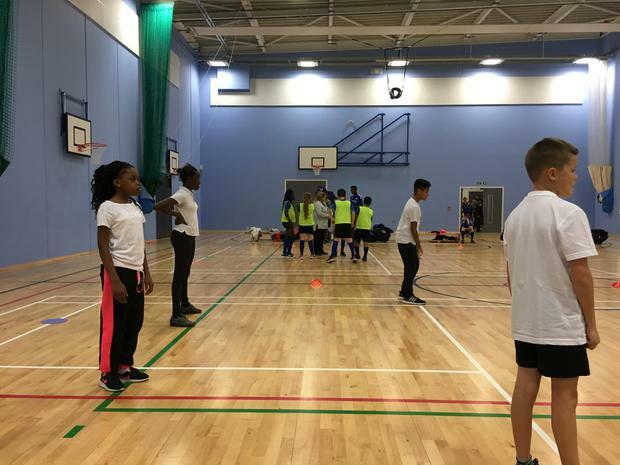 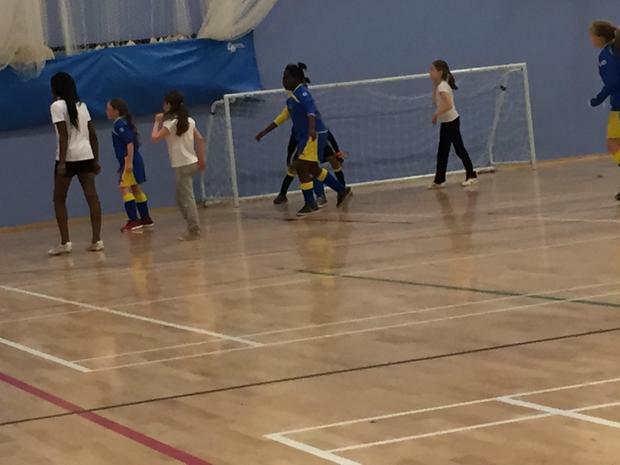 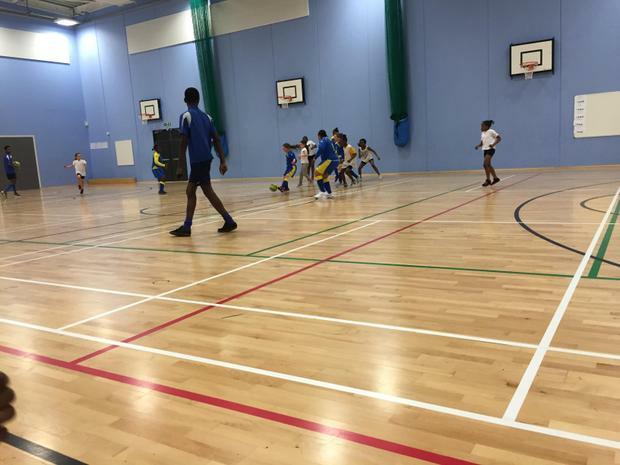 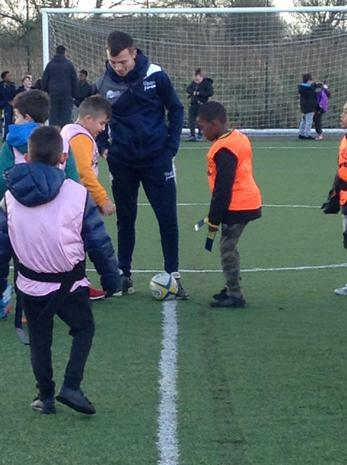 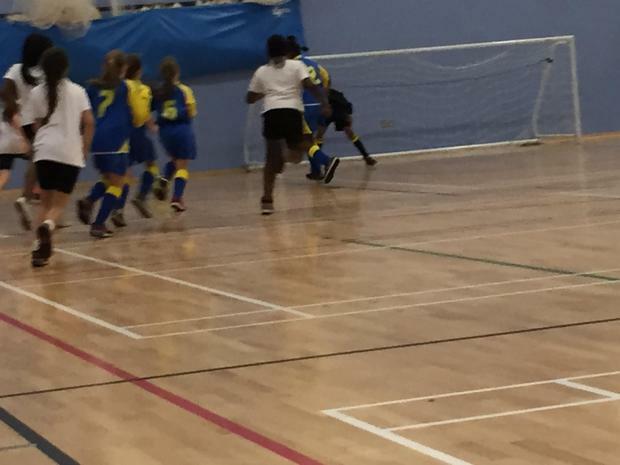 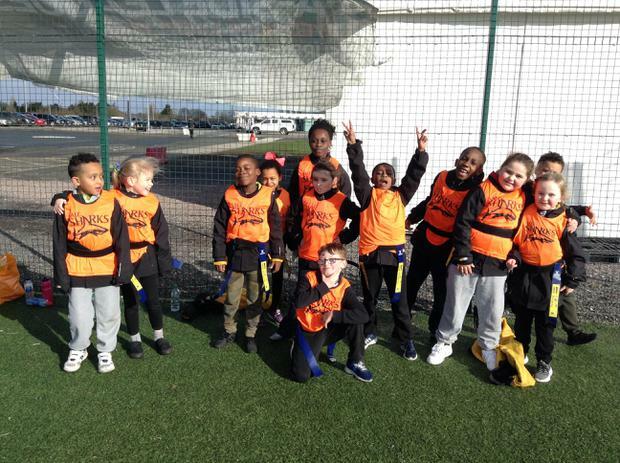 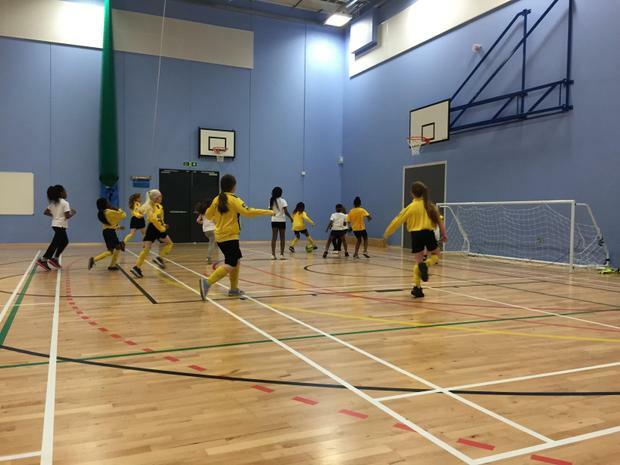 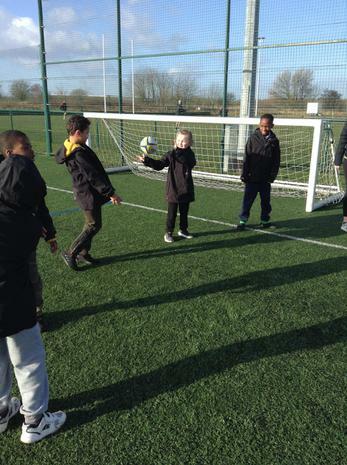 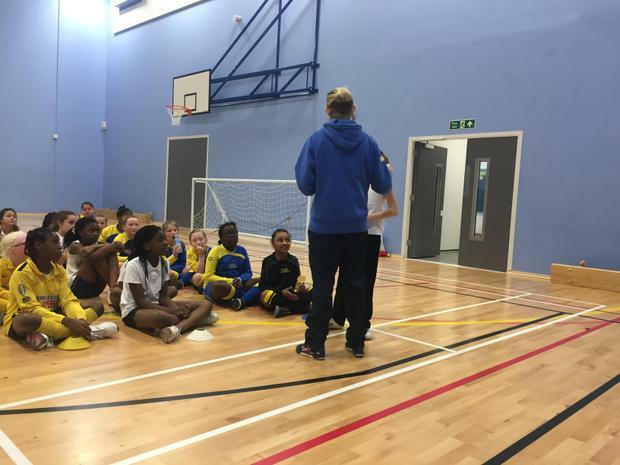 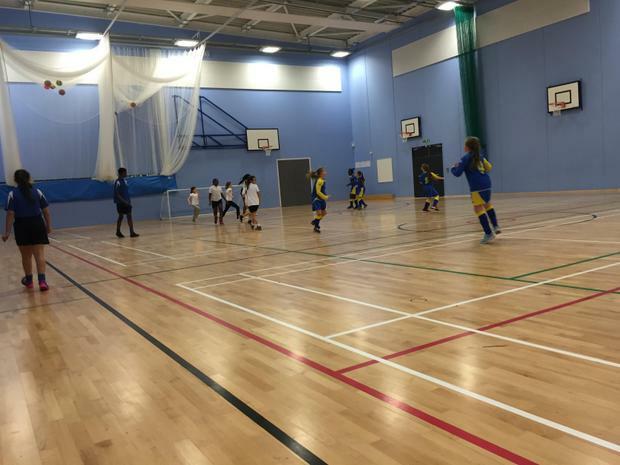 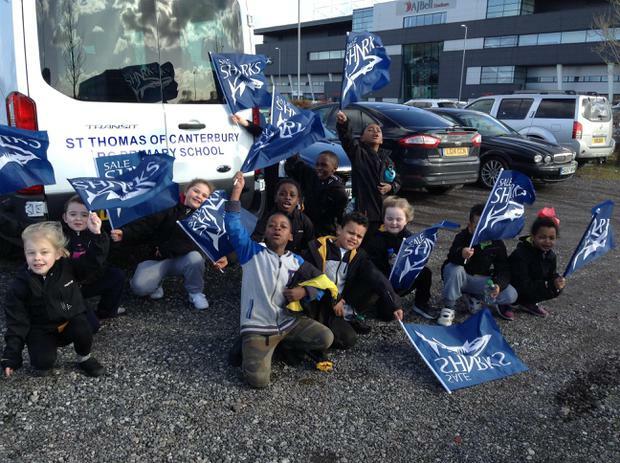 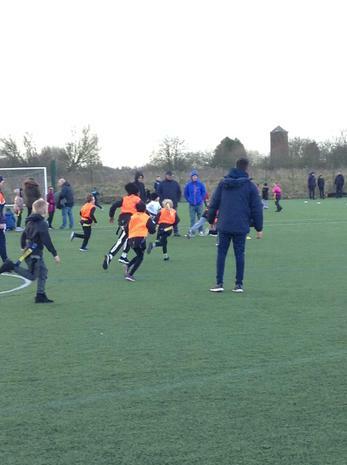 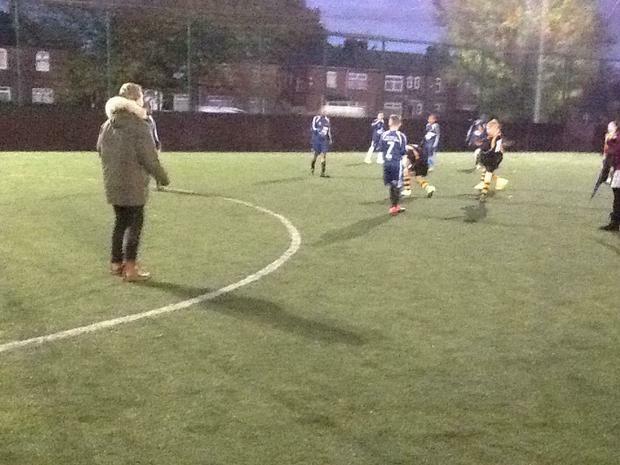 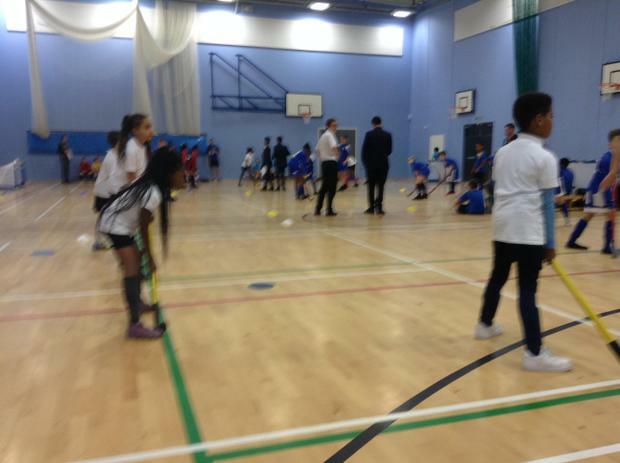 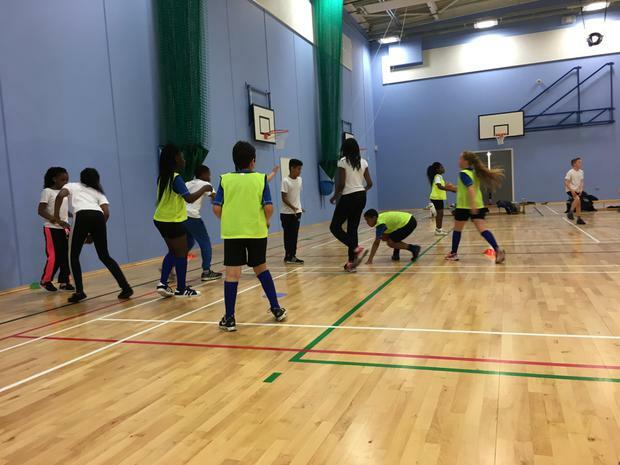 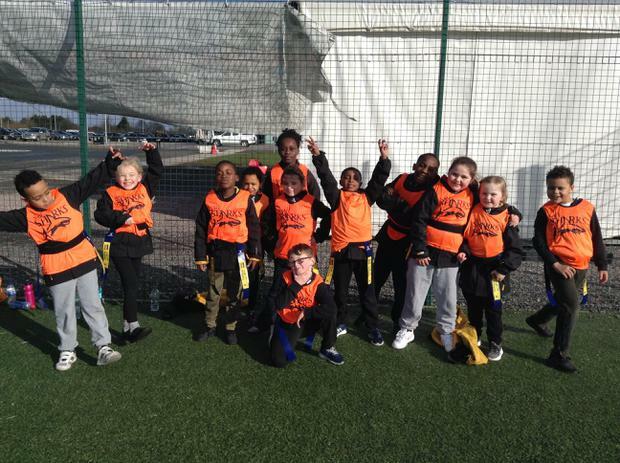 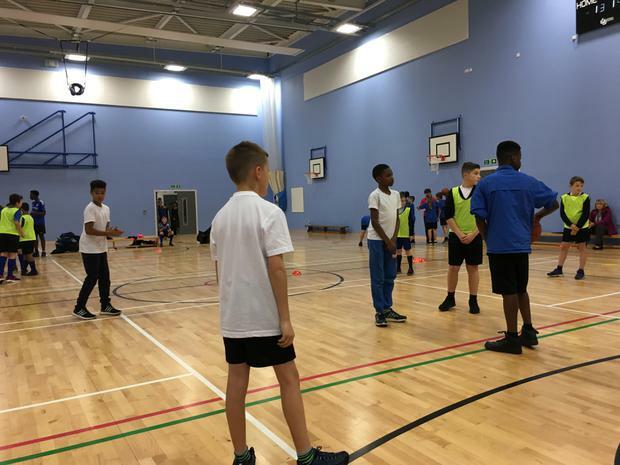 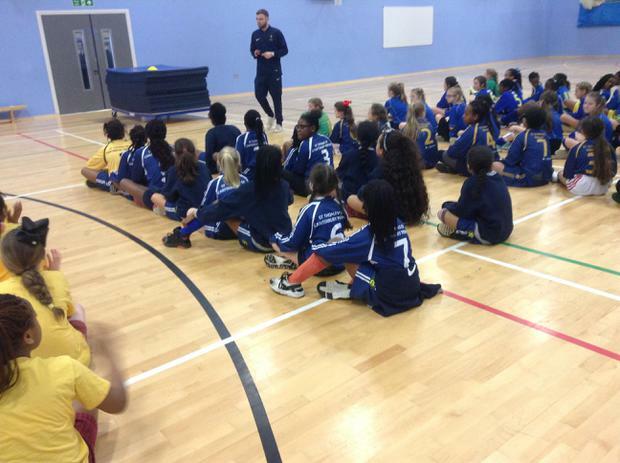 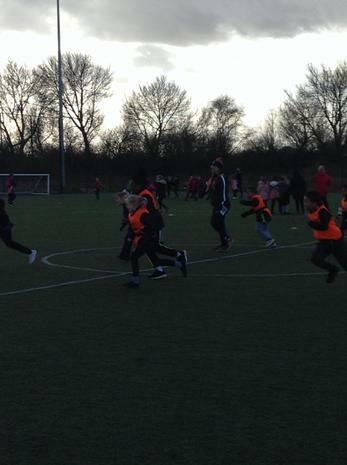 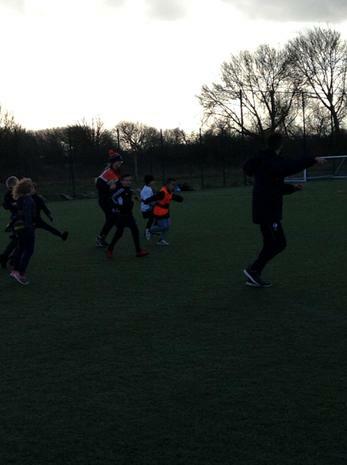 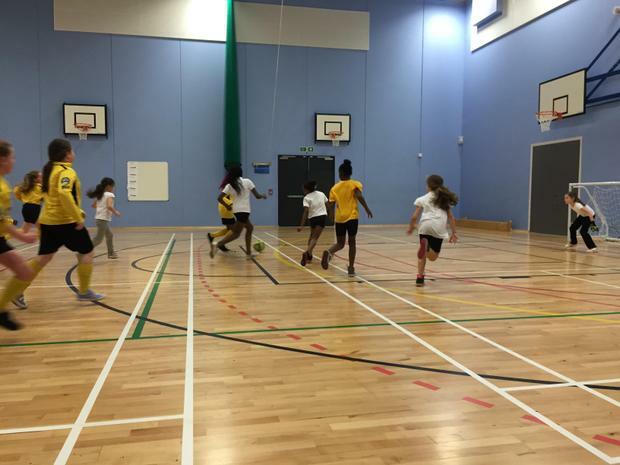 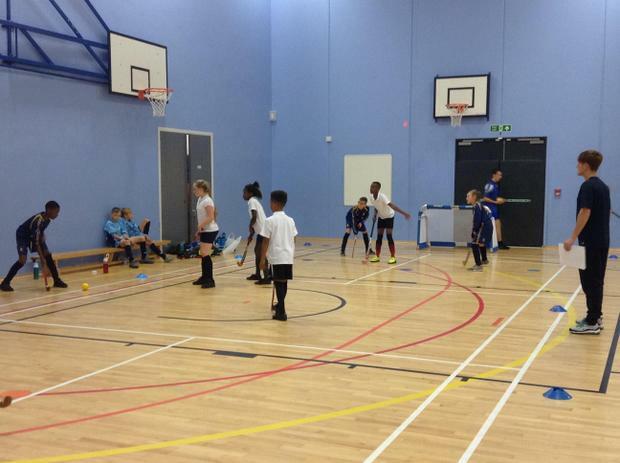 On Thursday 22nd October, our coaches - Mr Garside and Miss Gerrard, took St Thomas of Canterbury's year 5/6 football team to participate in a fun and exciting tournament at the Sports Village. 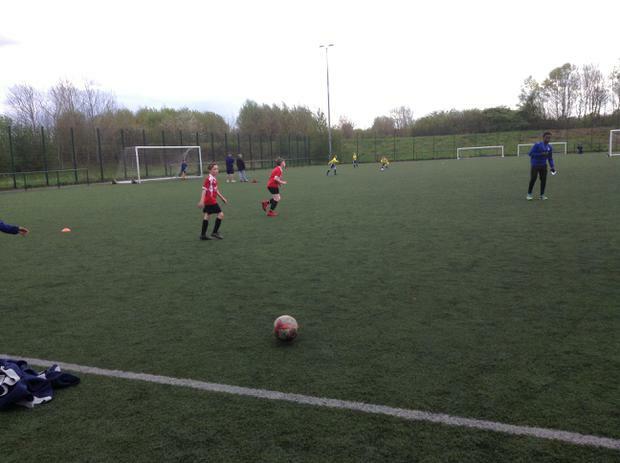 We played six games in total, all lasting for twelve minutes. 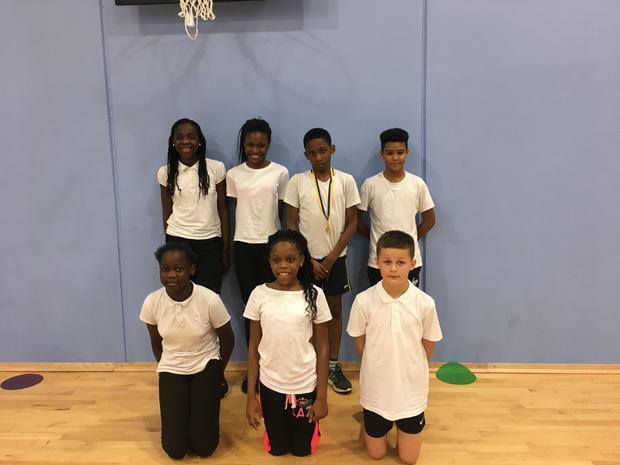 It was a tough competition with some fantastic players participating but we came away with an outstanding 5 out of 6 wins! 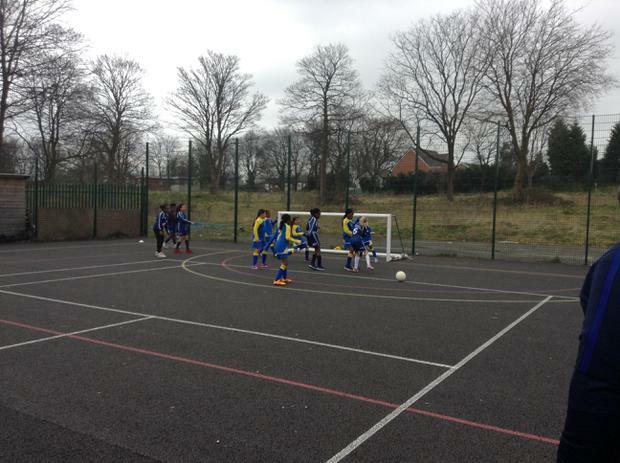 We scored a total of 30 goals Wow! 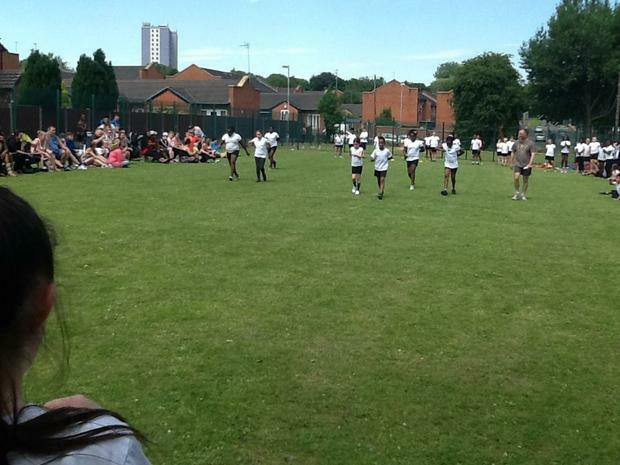 We really enjoyed the tournament, everyone worked well as a team and we are looking forward to our next challenge! 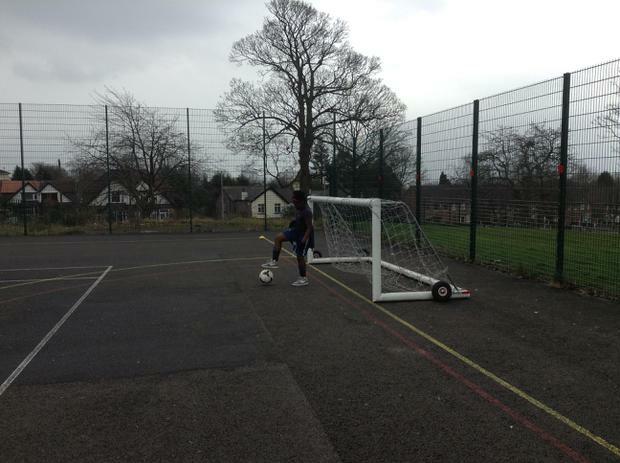 By Eyob, William, Josh and Voldie. 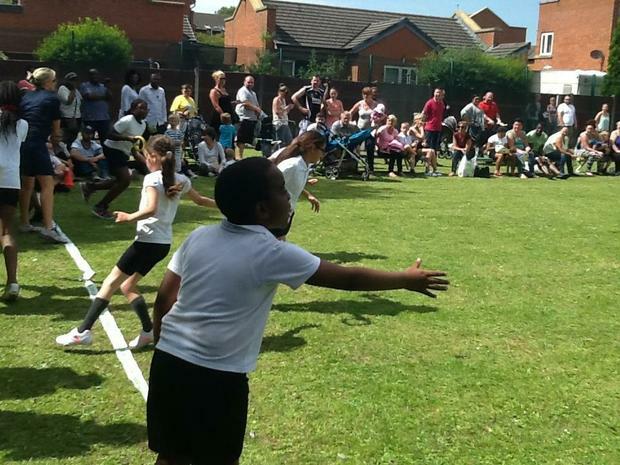 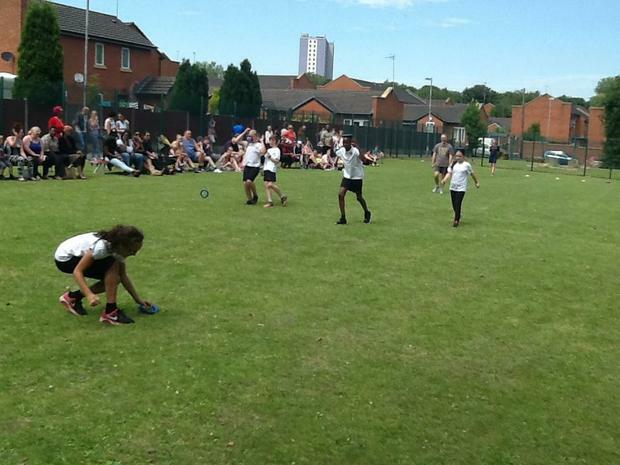 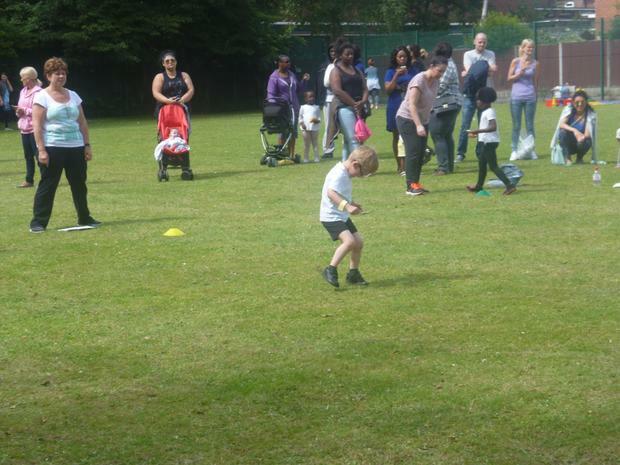 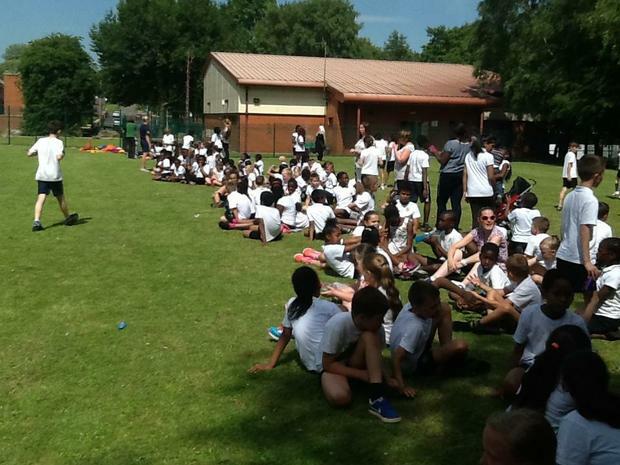 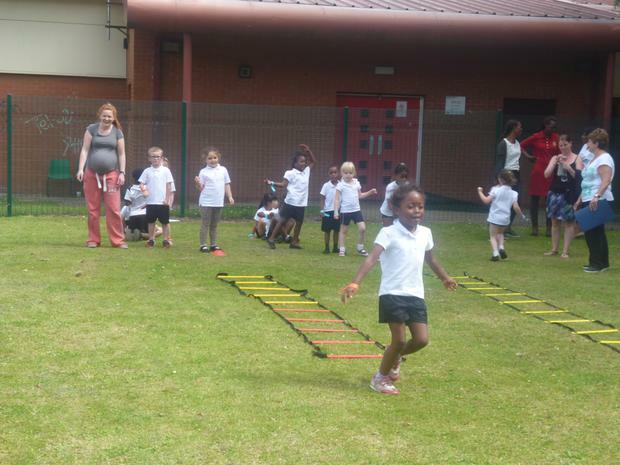 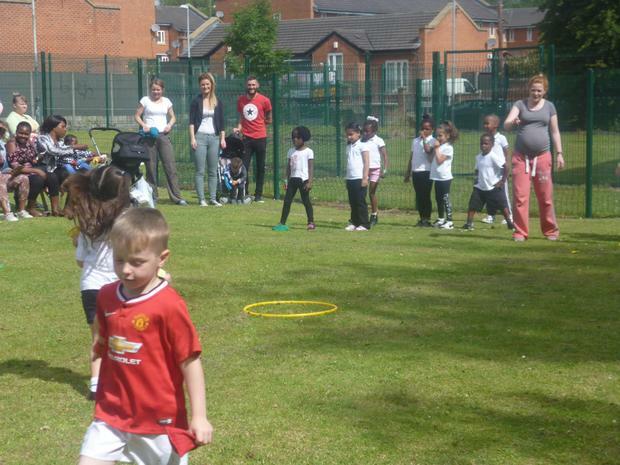 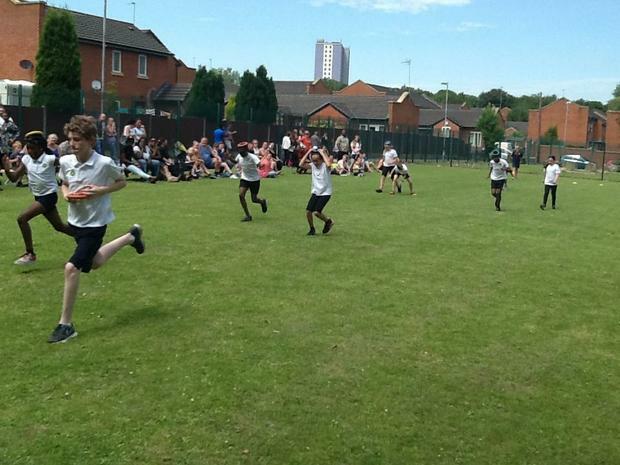 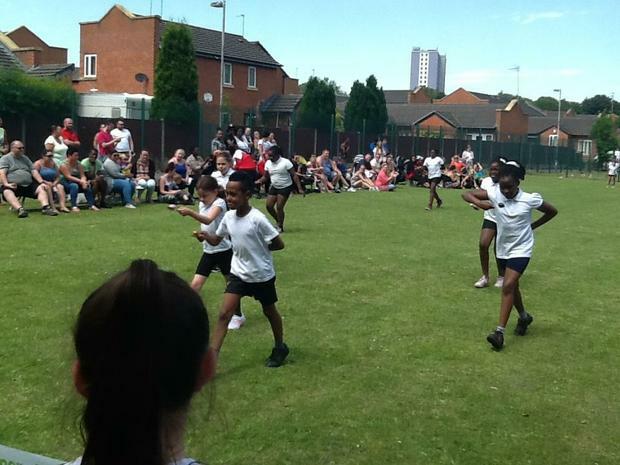 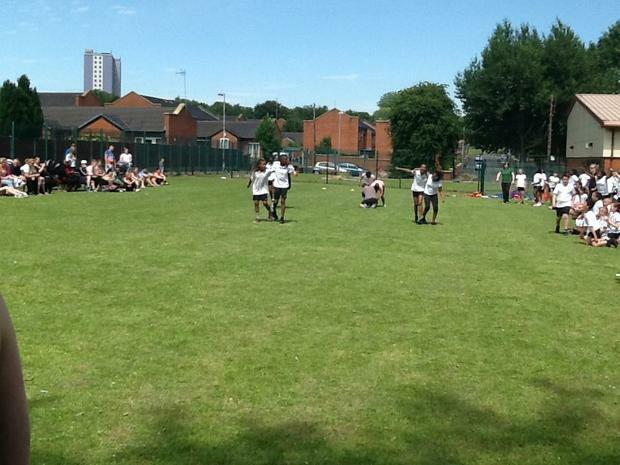 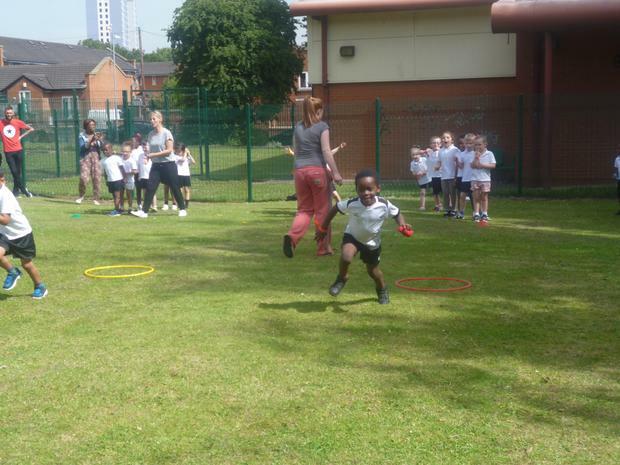 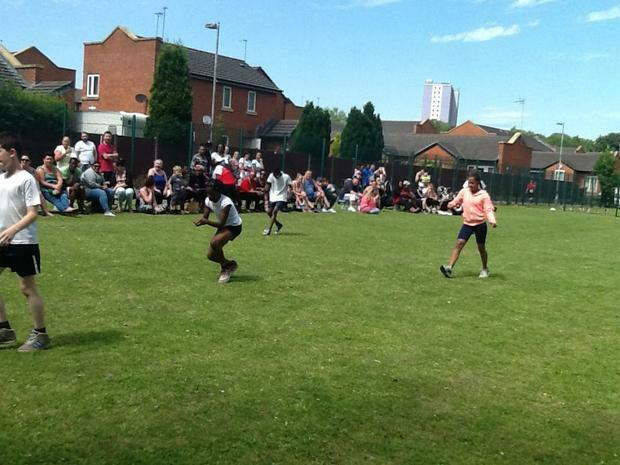 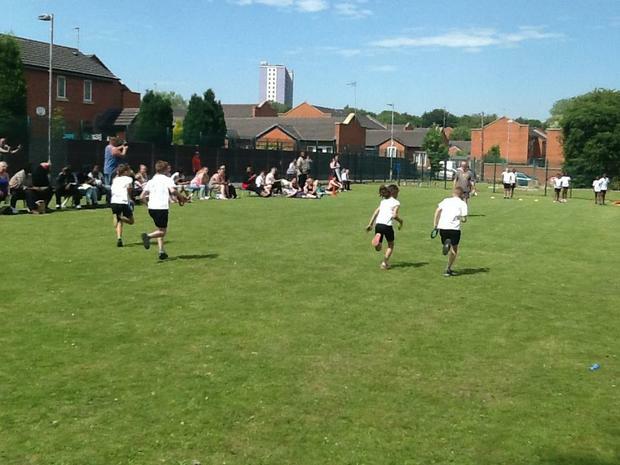 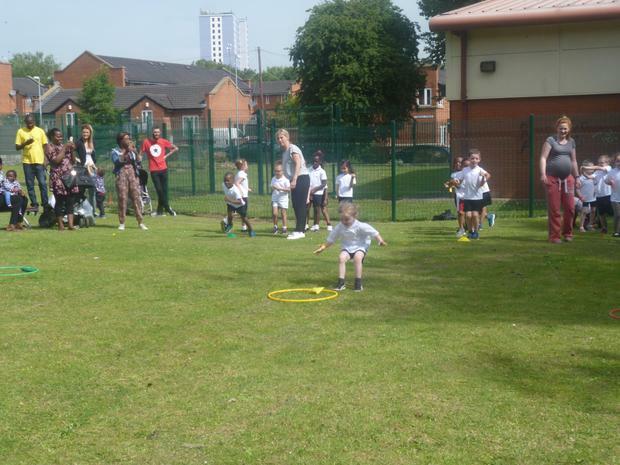 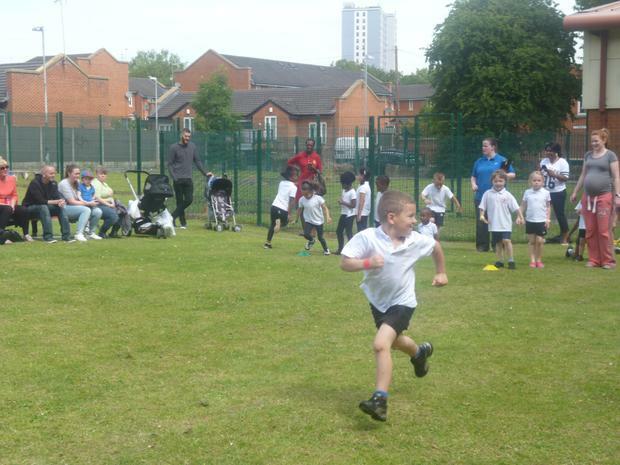 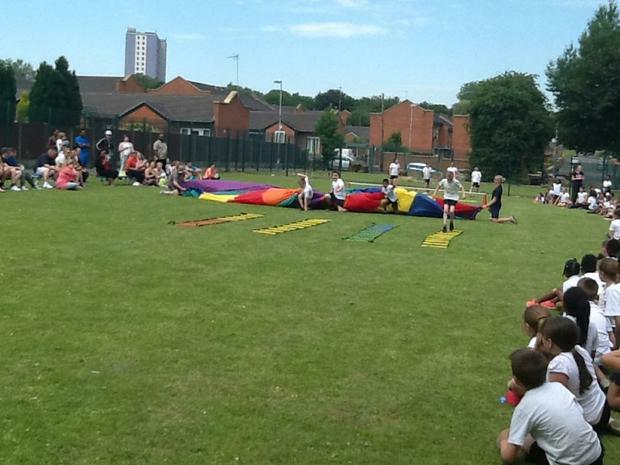 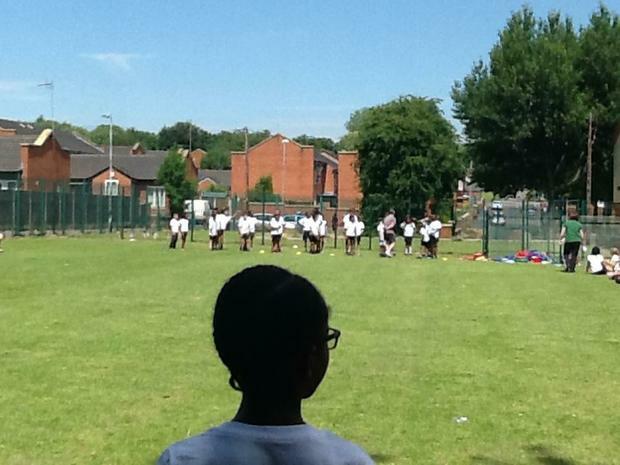 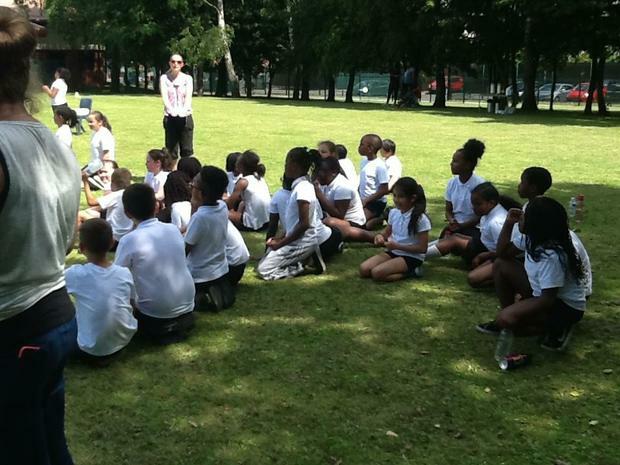 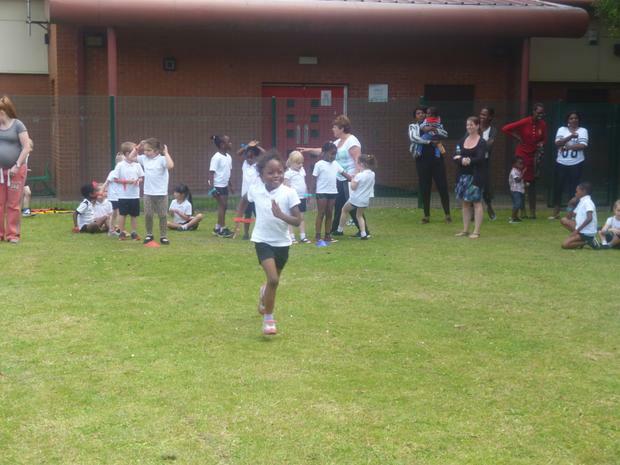 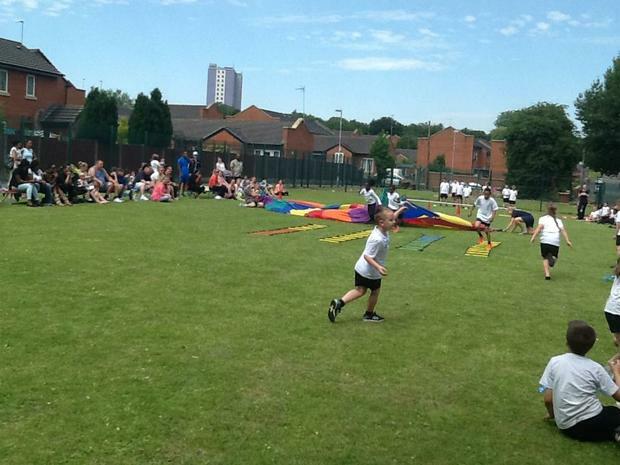 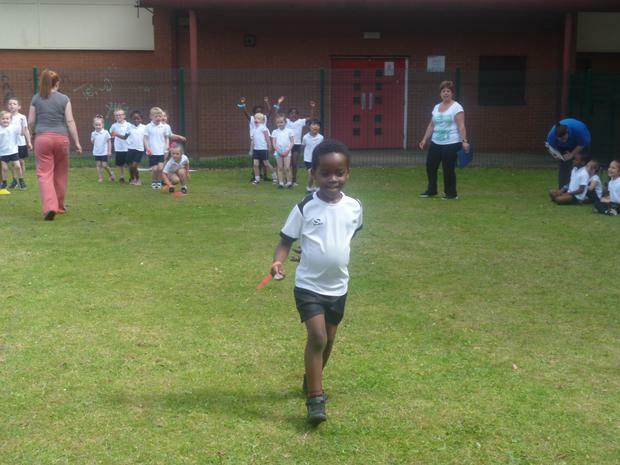 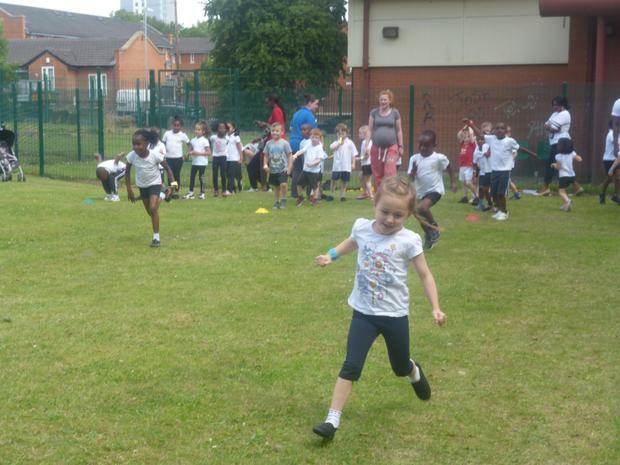 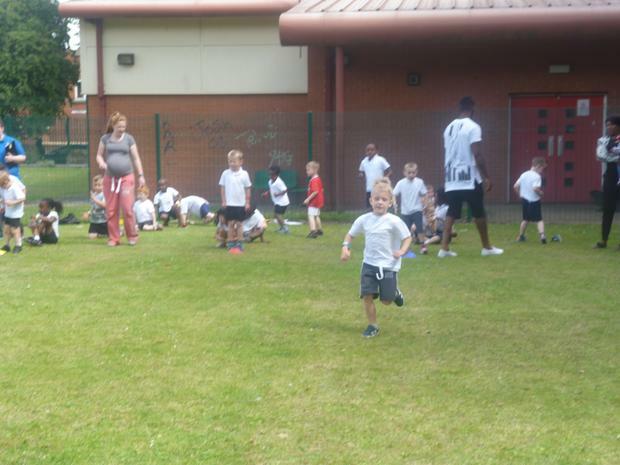 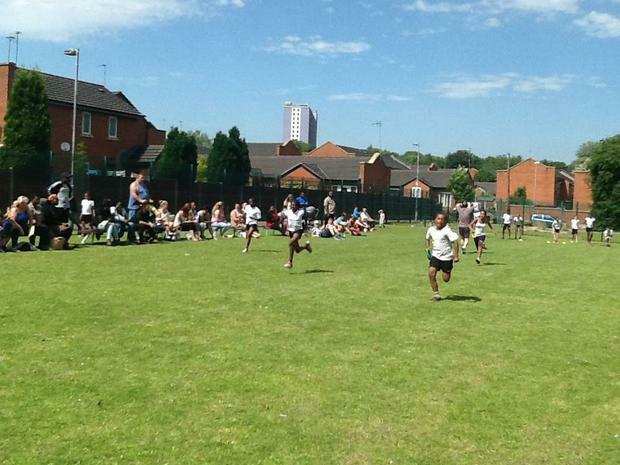 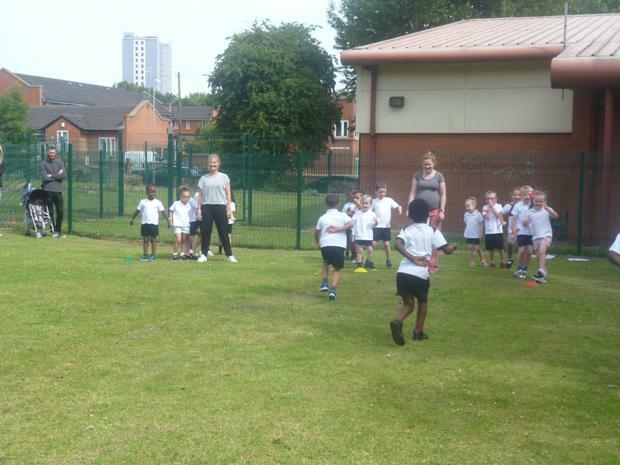 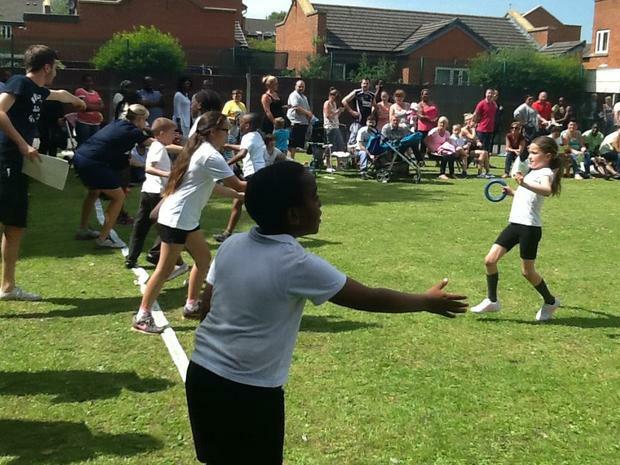 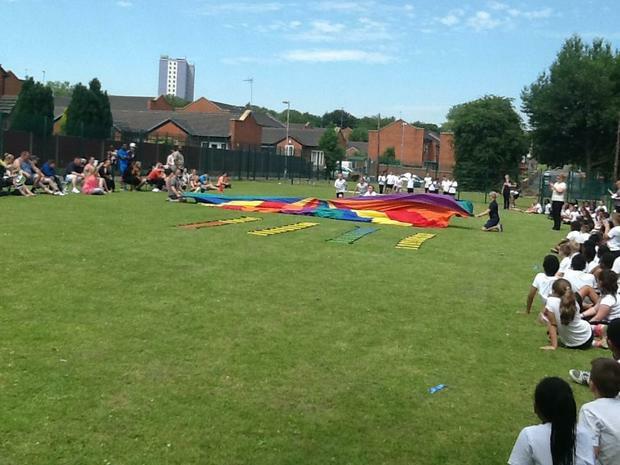 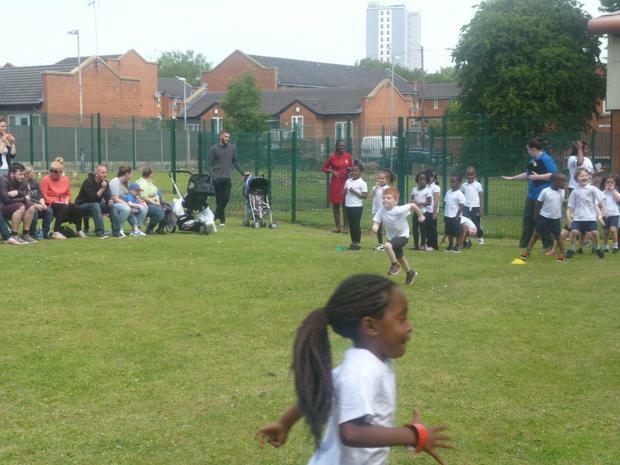 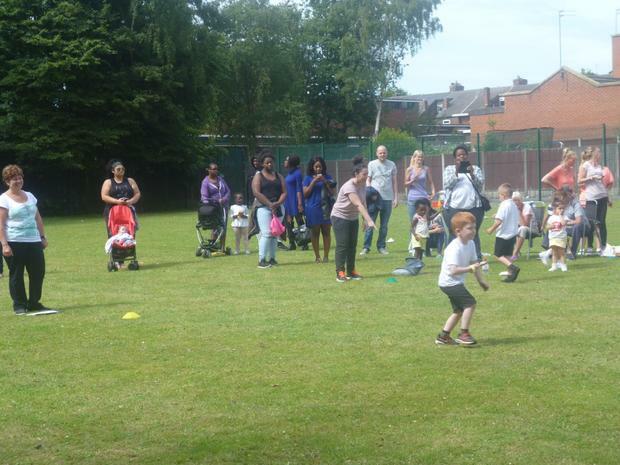 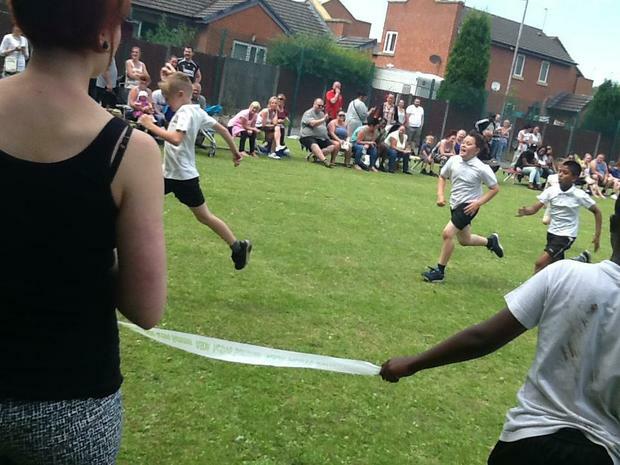 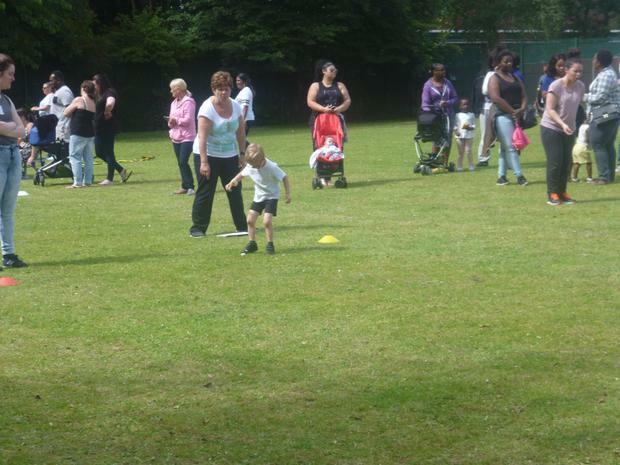 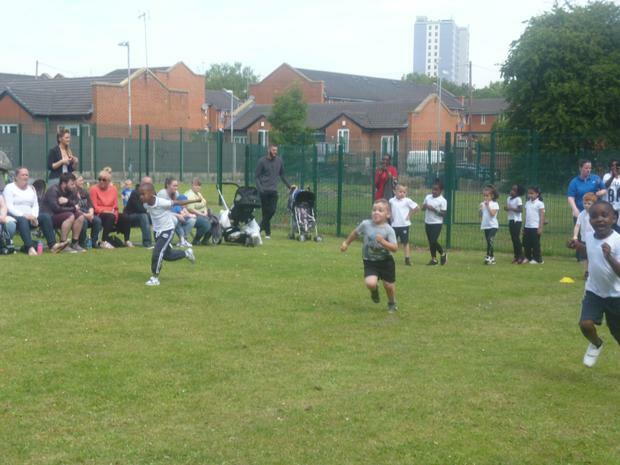 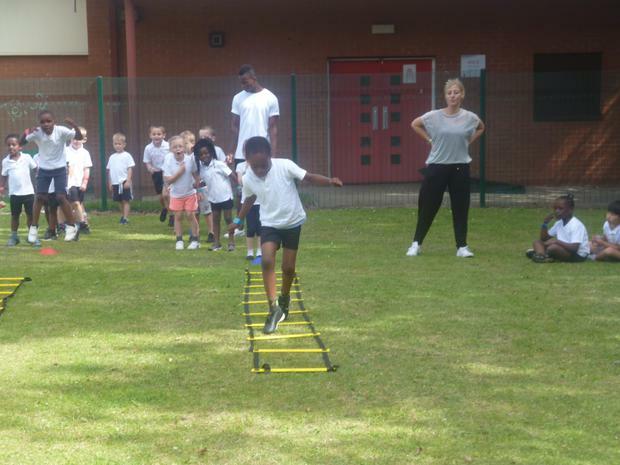 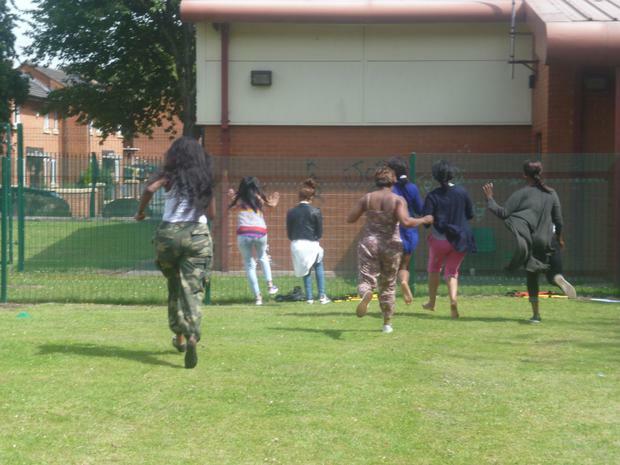 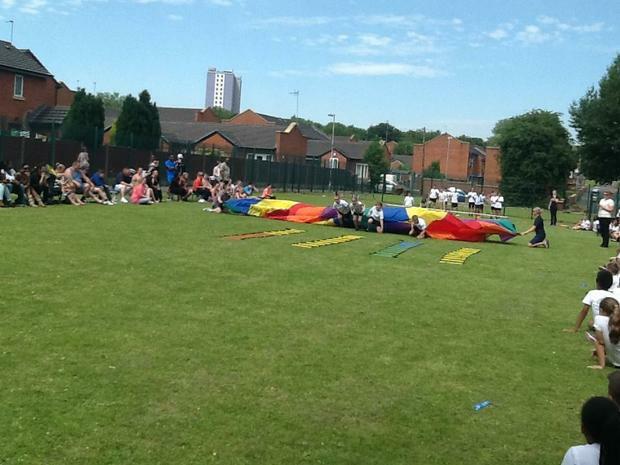 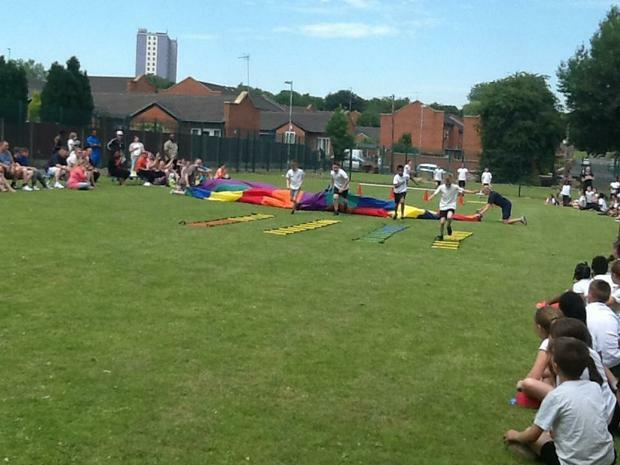 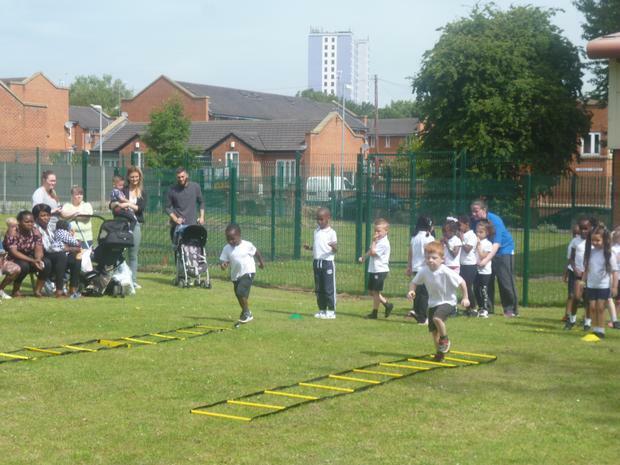 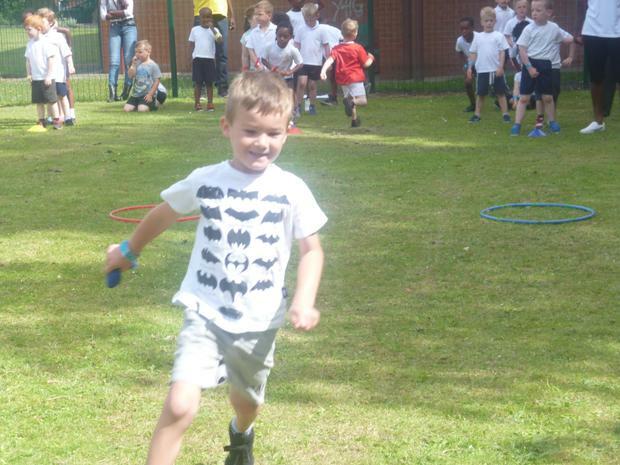 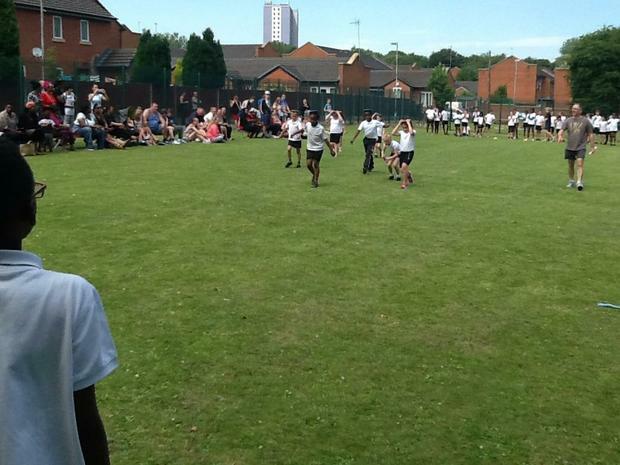 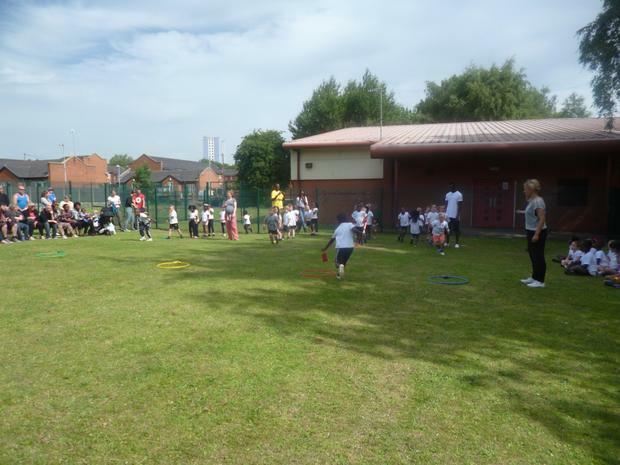 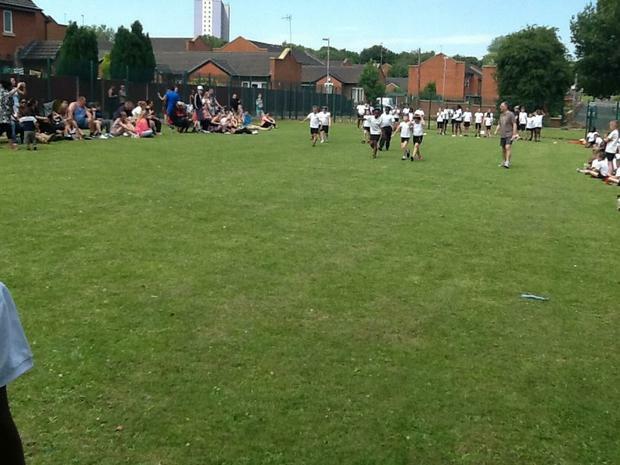 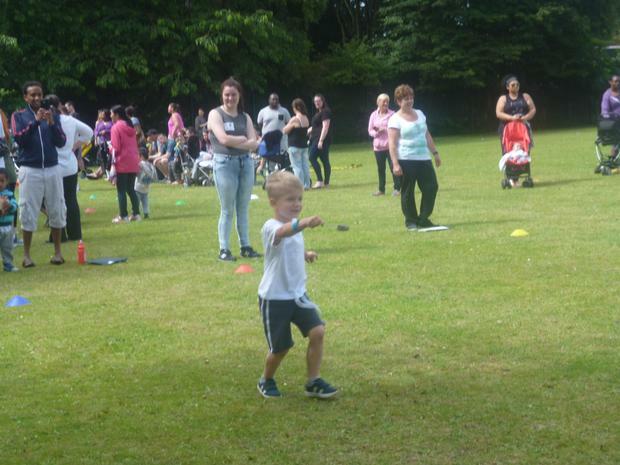 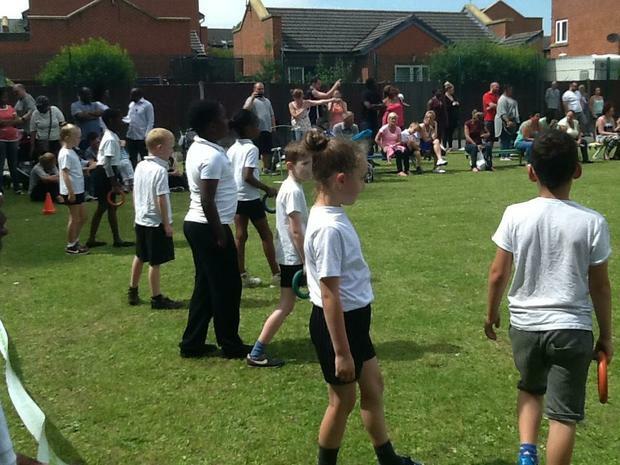 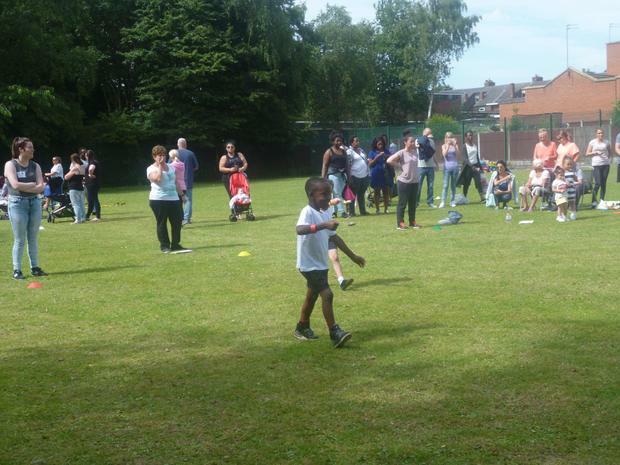 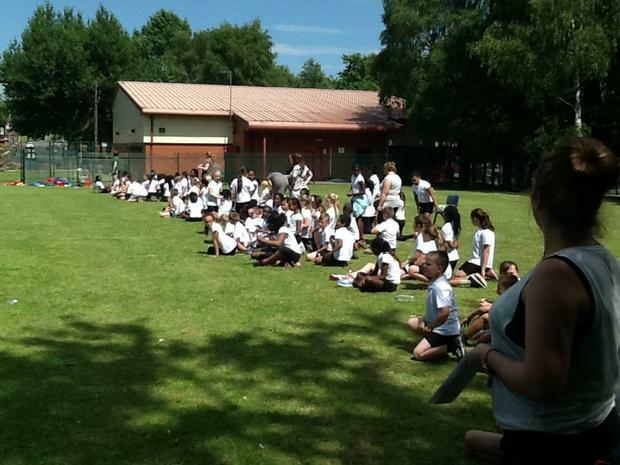 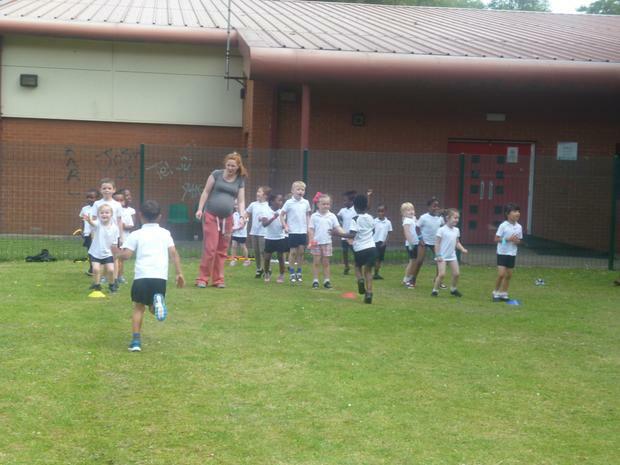 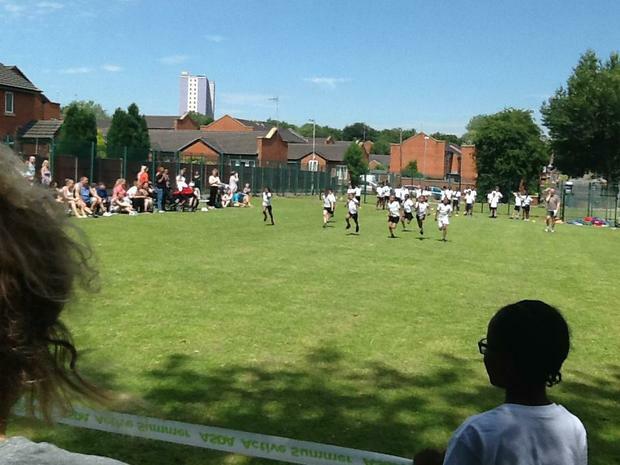 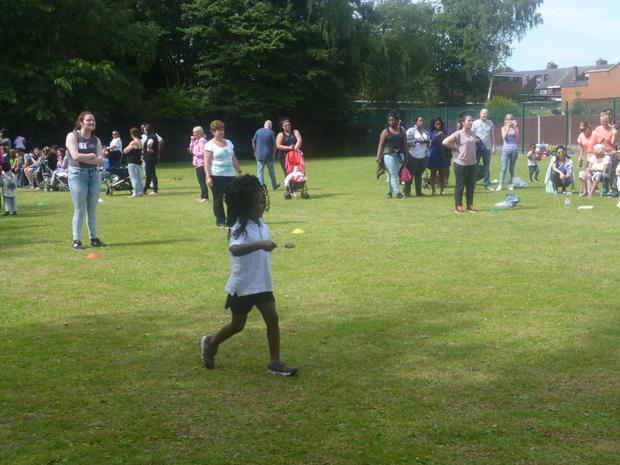 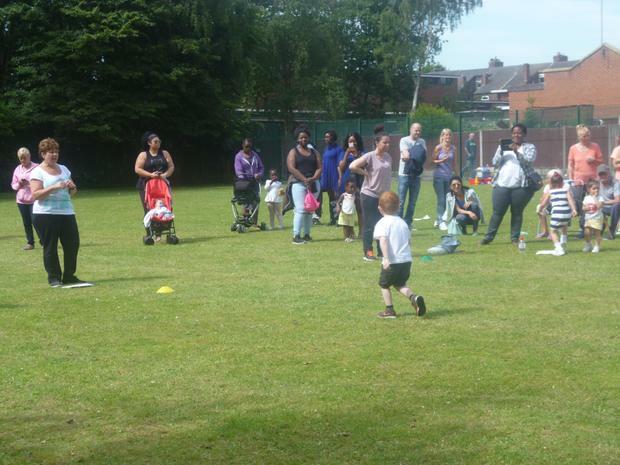 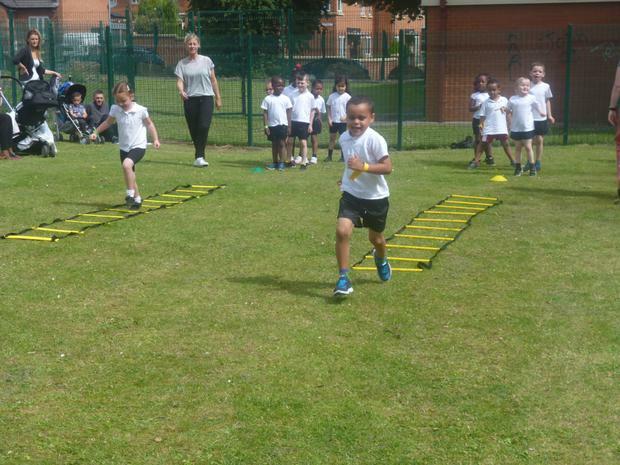 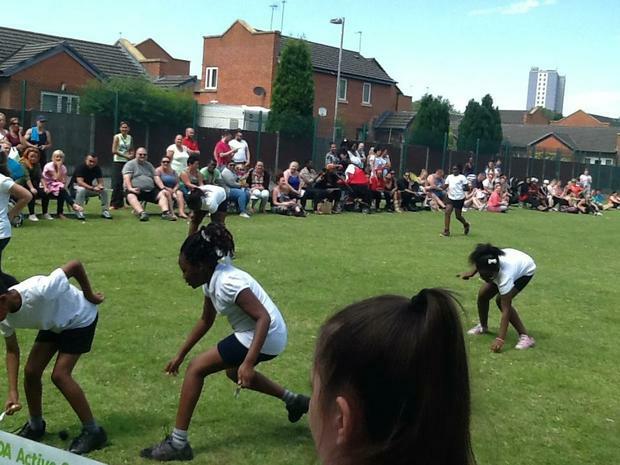 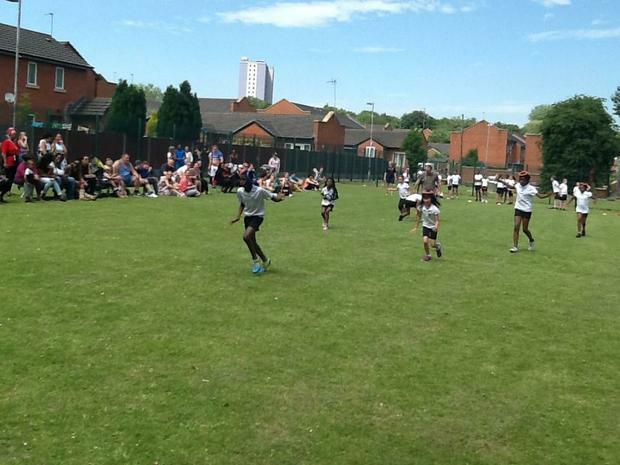 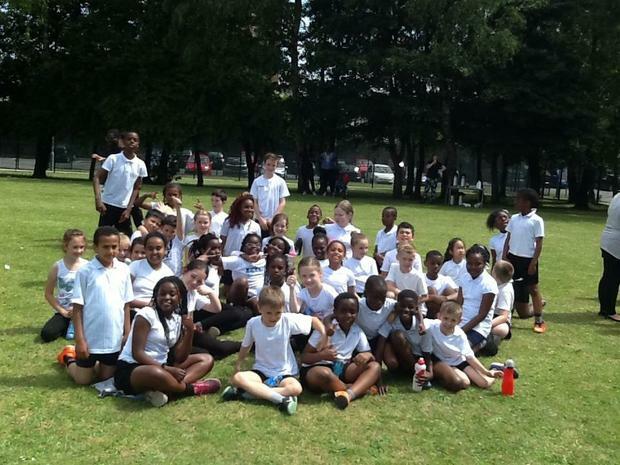 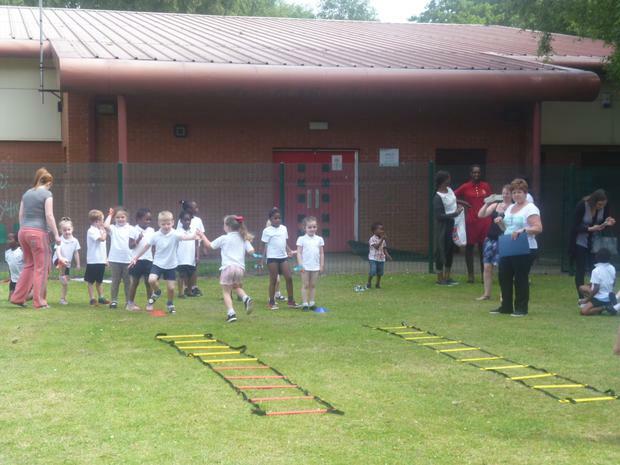 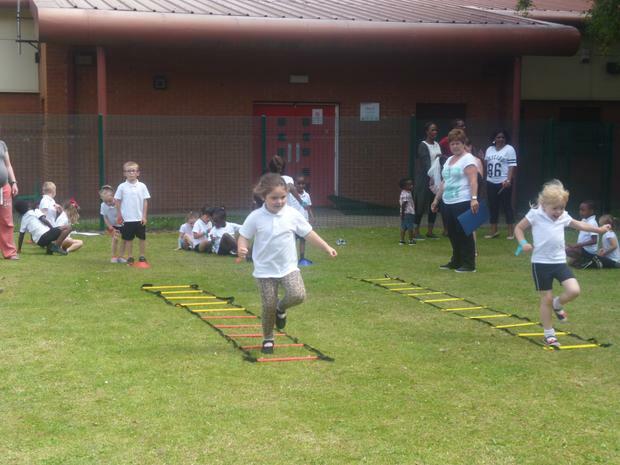 Each year group has participated in a very successful sports day all the way from Nursery to Year 6! 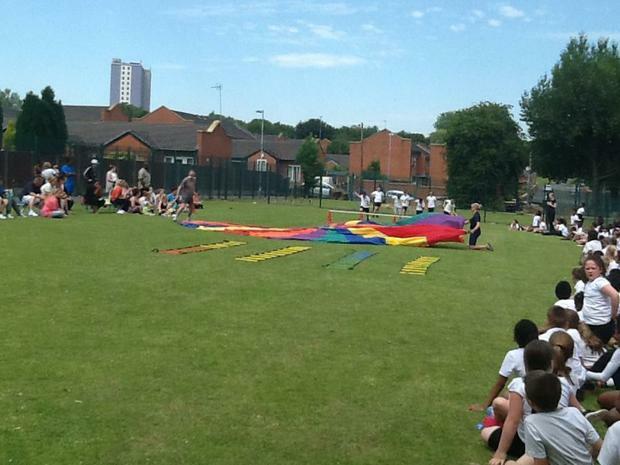 It was a great day and luckily we got the weather for it after a rainy week! 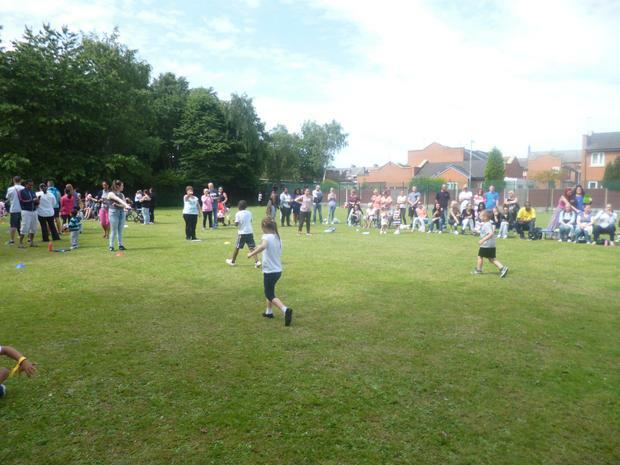 All of the children were fantastic sports on the day, each and every one giving it their best to win for their house team. 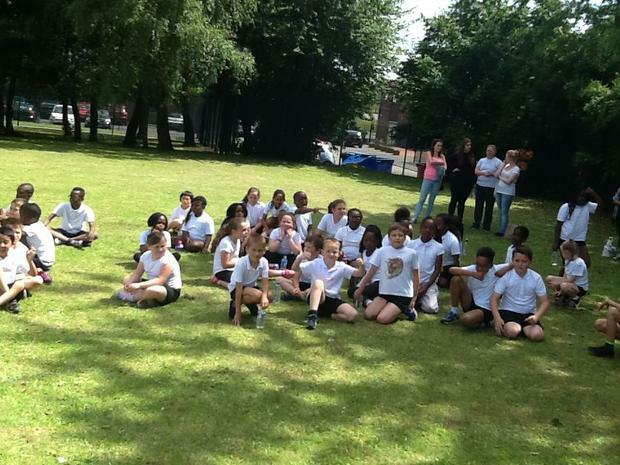 There was a medal to be won for each winning house team, and those who didn't win still kept their heads held high. 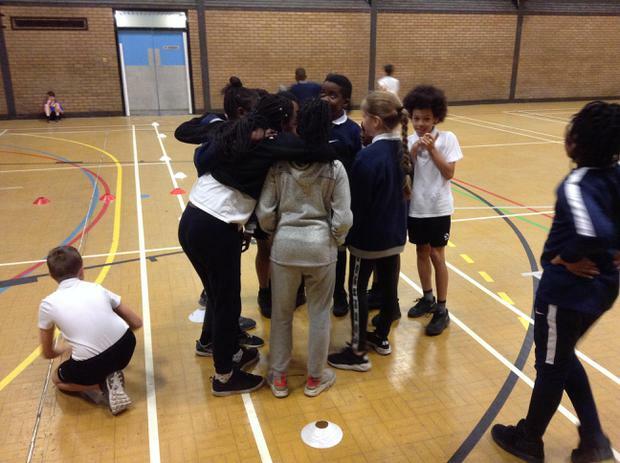 They should be very proud of their efforts and commitment to their team! 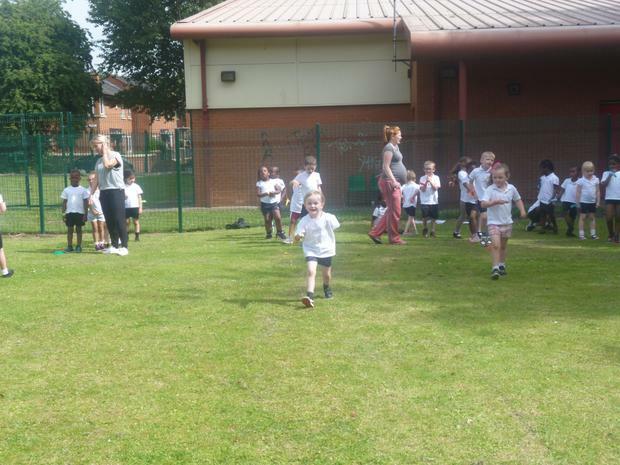 St. Margaret Clitheroe in Nursery R and St. Margaret Clitheroe for Nursery T! 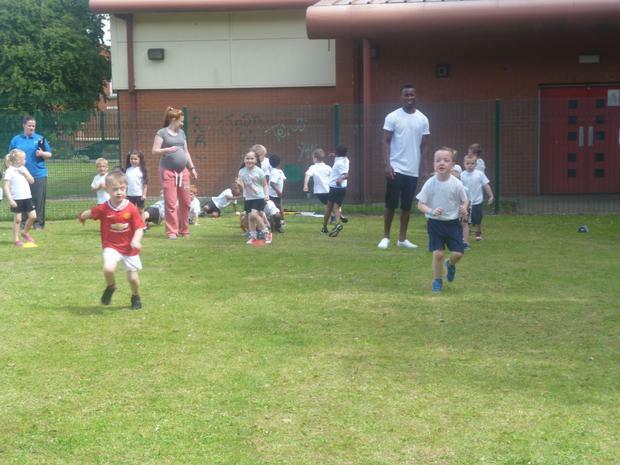 Well done to all of the Nursery children!!! 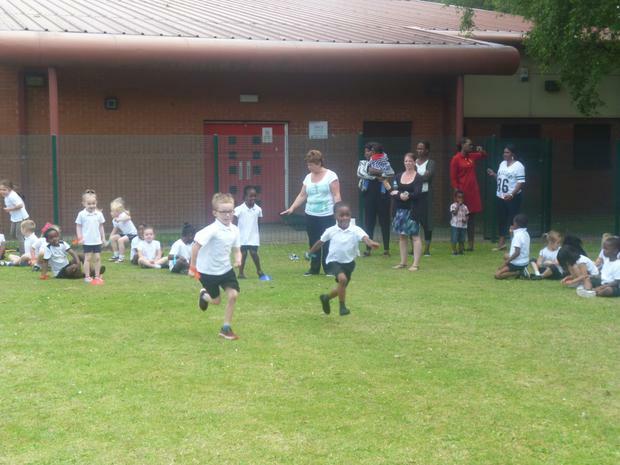 It was close on points for both Reception classes and similar to Nursery the same house team won in both classes which was St. Ambrose Barlow!!! 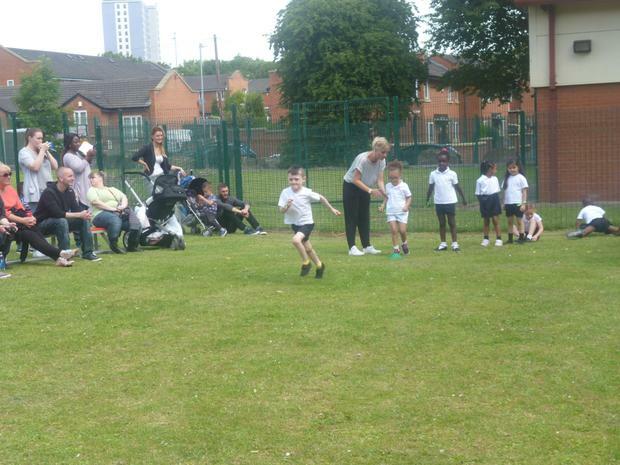 Well done to all of the Reception children!!! 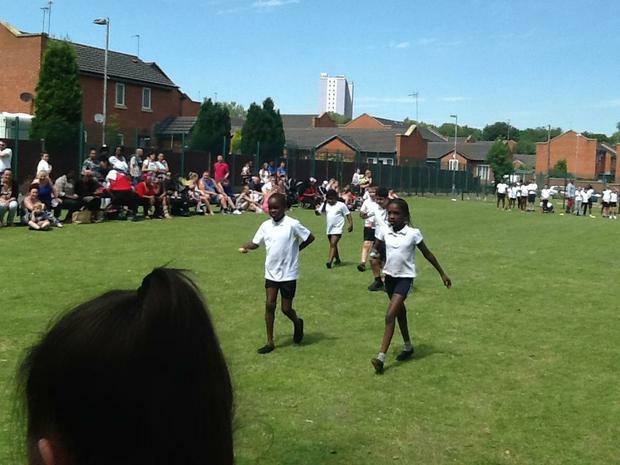 Well done Key Stage One!!! 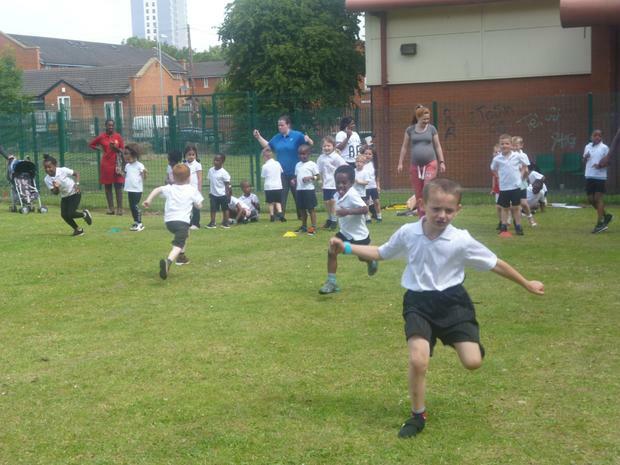 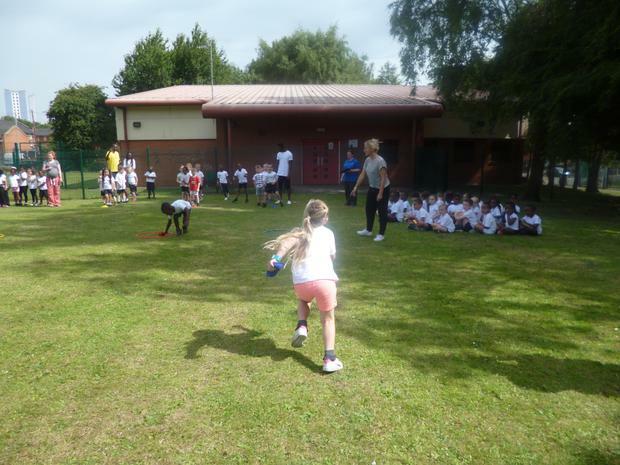 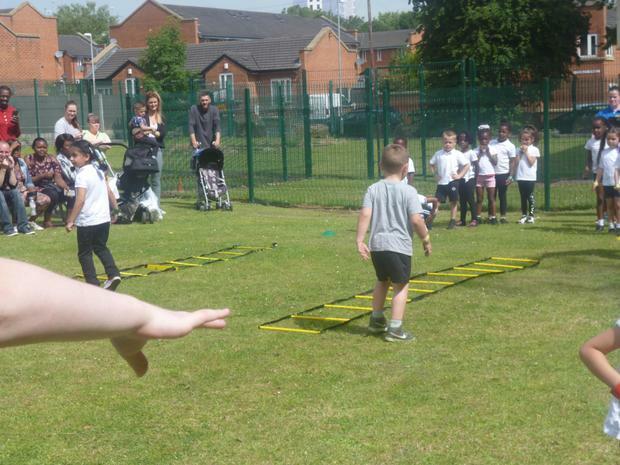 Key Stage Two sports day became more complex and the races were much more difficult, the children scored points for their team which was combined across the Key Stage! 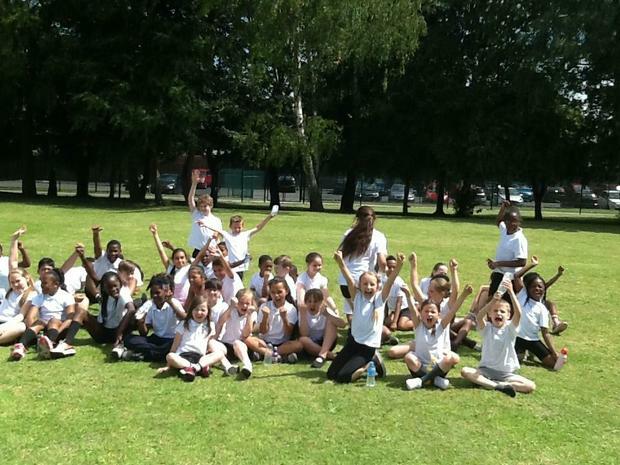 Excellent sportsmanship Key Stage Two!!! 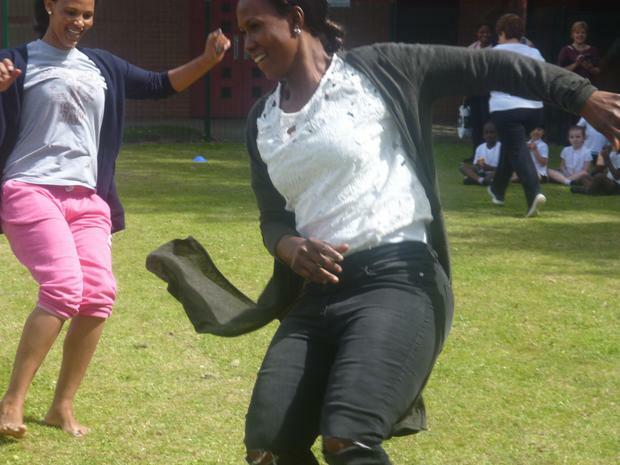 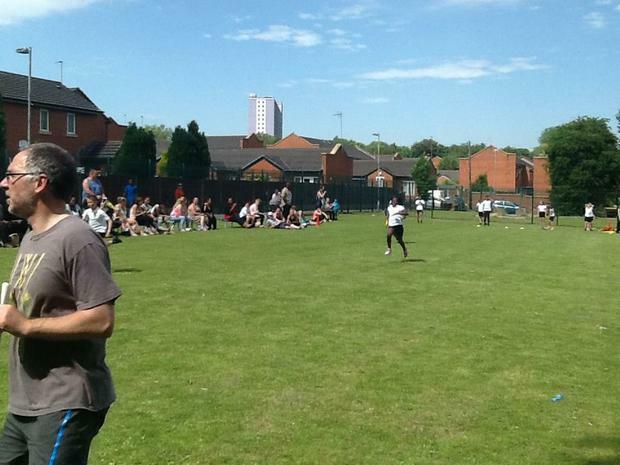 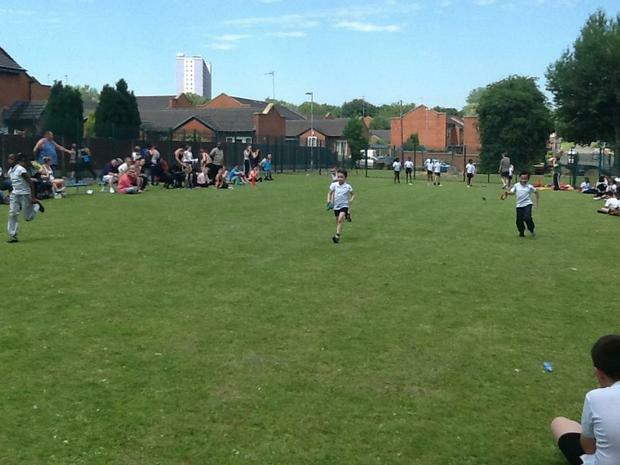 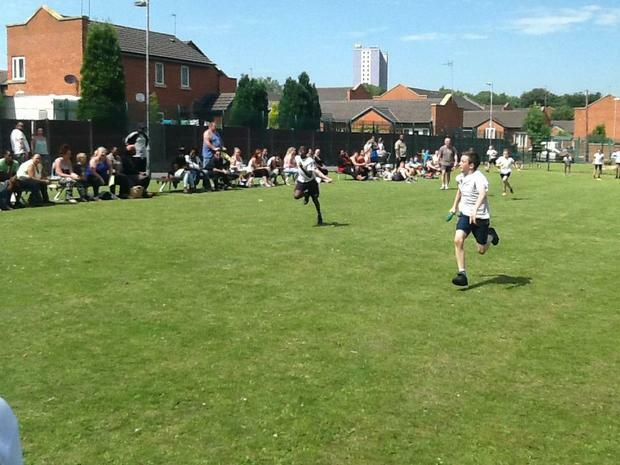 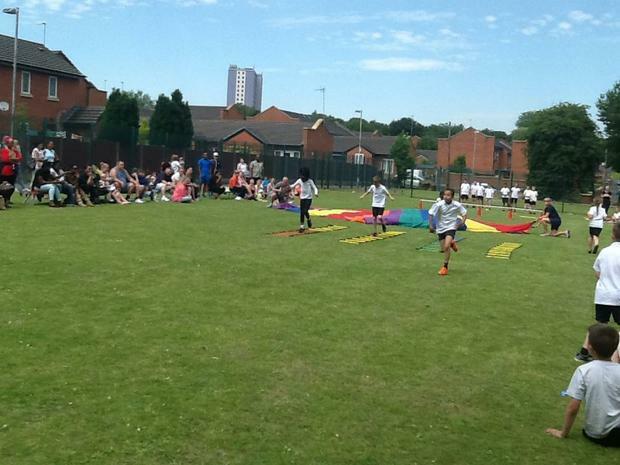 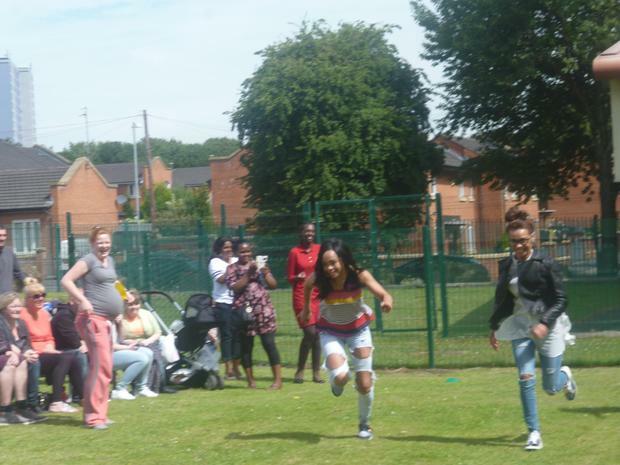 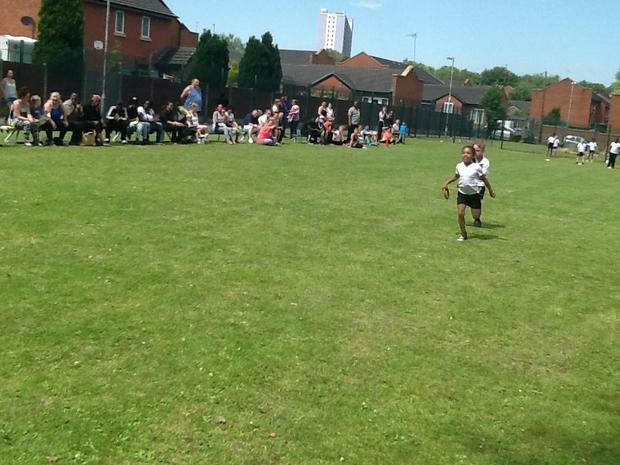 Not to forget ......... a huge well done to all of the parents who were involved in the parent races!! 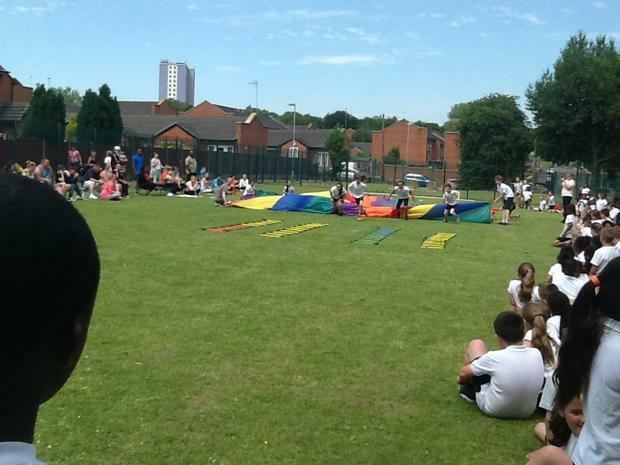 You certainly did your children proud!!! 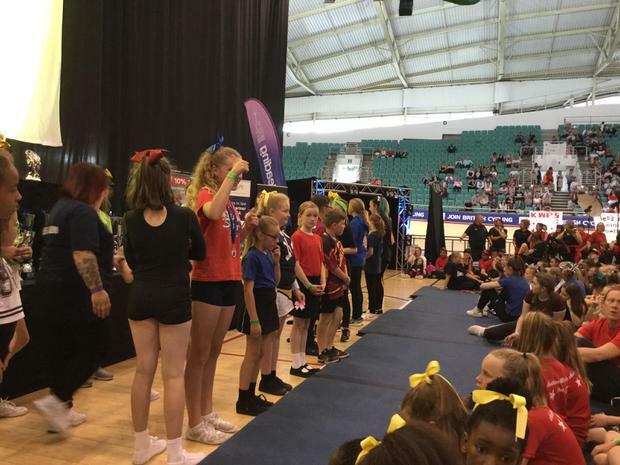 A huge well done to the S.T.O.C Diamonds who competed in the schools cheerleading championships and placed 6th overall out of 11 schools!! 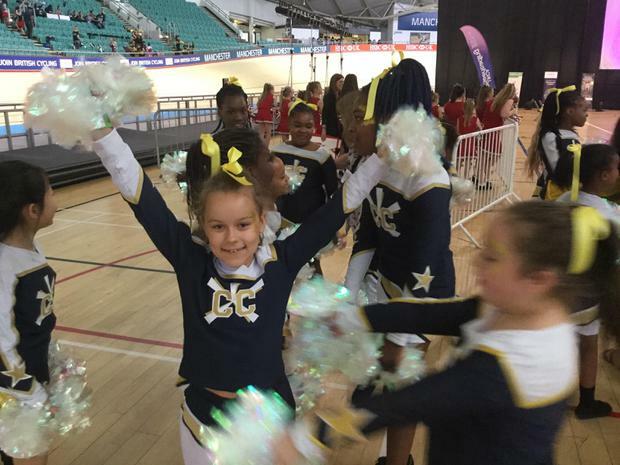 They competed against some very experienced schools who have been competing for years and for many of the girls, this was their first competition, so this is a massive achievement for them. 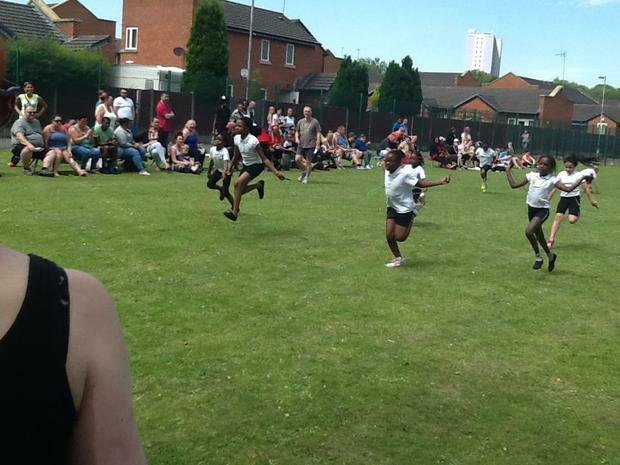 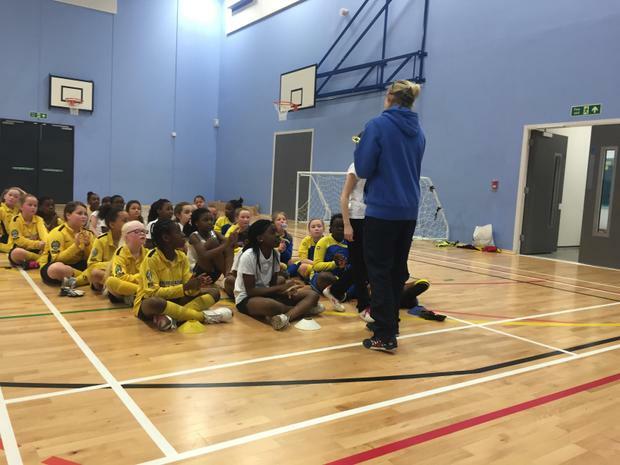 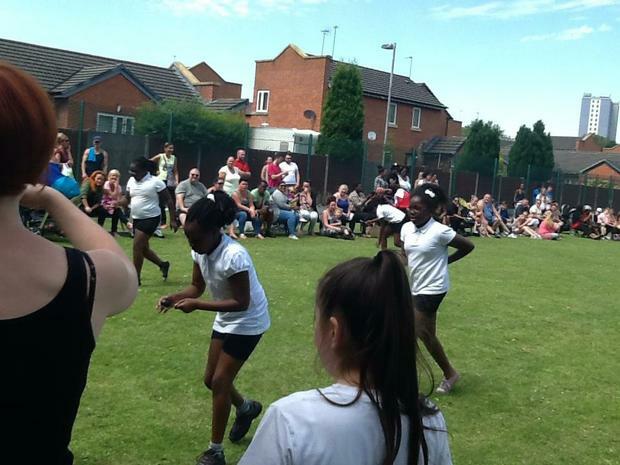 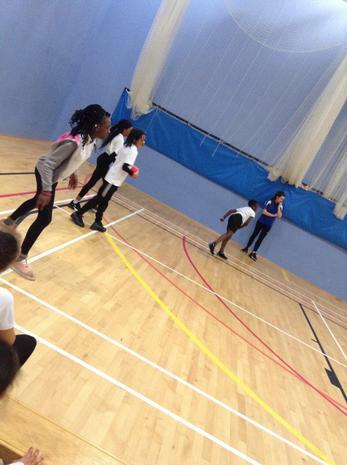 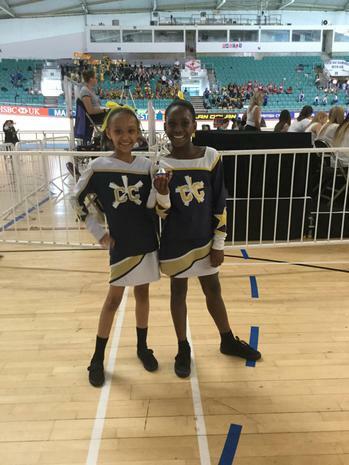 Cheerleading coach Miss Roskell said "I am so proud of how the girls performed today, they have been a pleasure to coach and are a credit to the school. 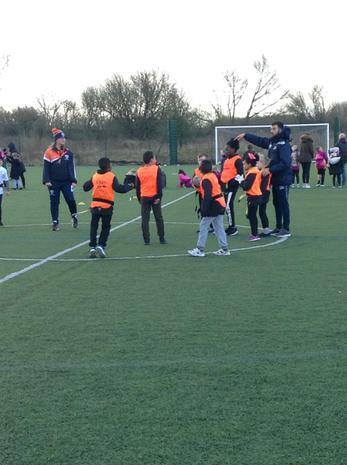 Our aim now is to continue to work hard and place in the top 3 in the next championships." 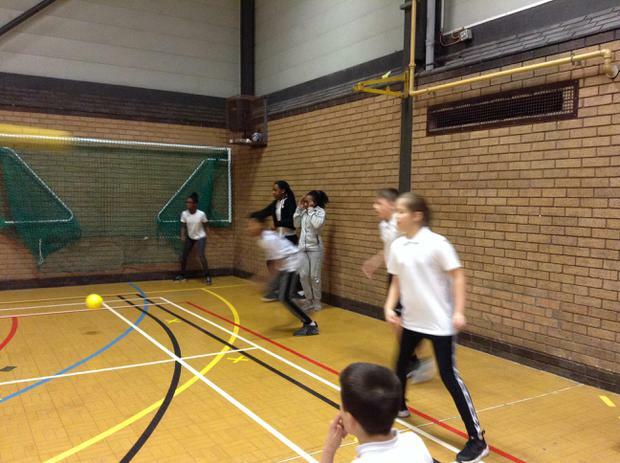 We got on the coach and we felt excited to be competing in the All Hallows high school handball competition. 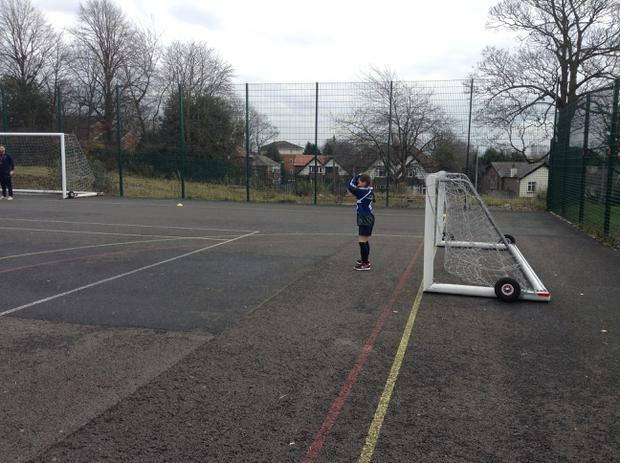 When we got there, it was empty, because we were the first ones there. 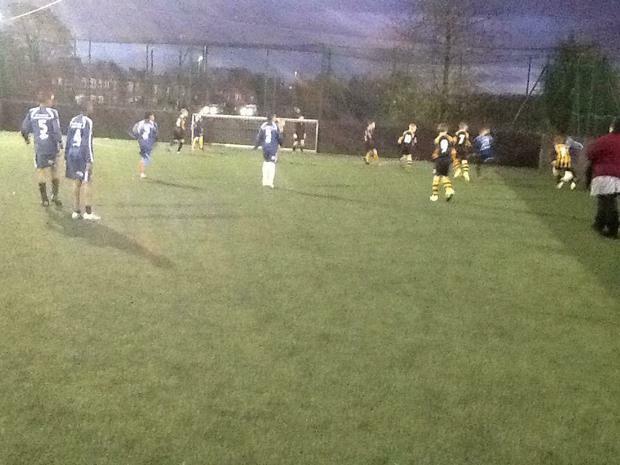 The 1st match we played against Bridge Water and we WON 4-0. 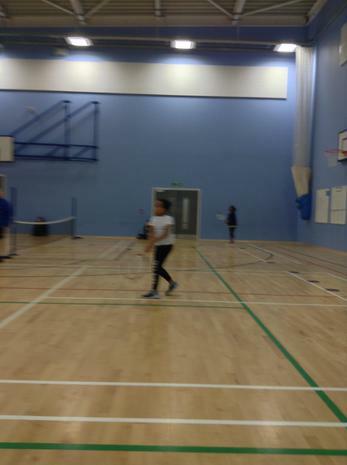 We lost 10-2 in the second match. 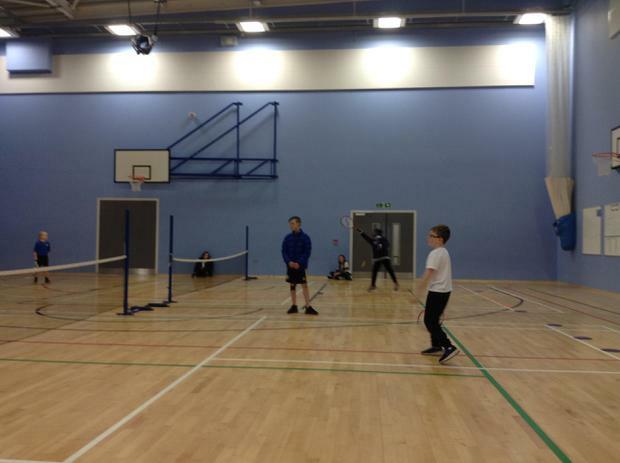 The 3rd match we played, we lost 3-2 and we lost the 4th match by a close game only down by one, which ended 5-4. 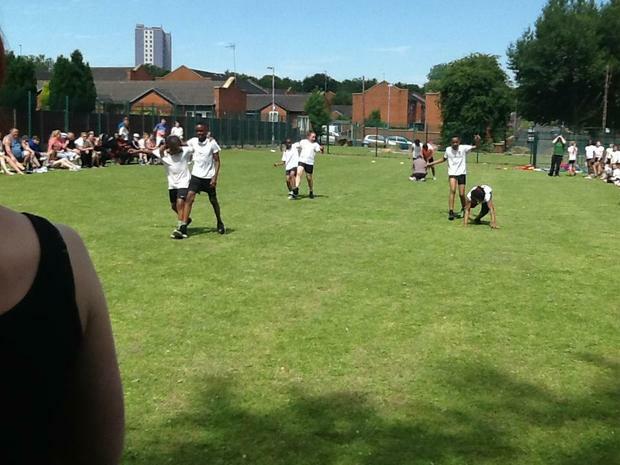 The last match we won 2-0 against Clifton! 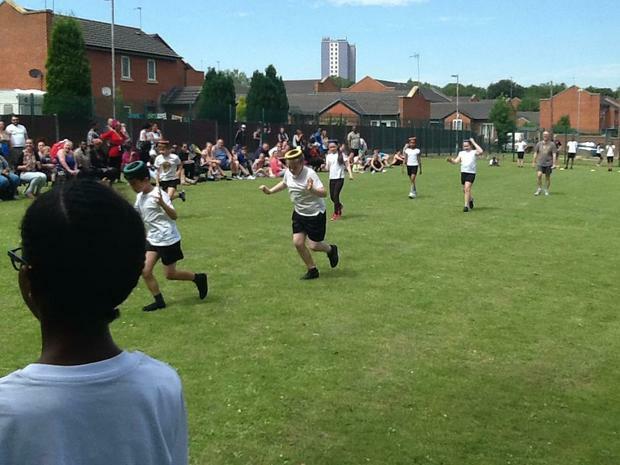 We didn't win the overall competition but it didn't matter because we still had lots of fun! 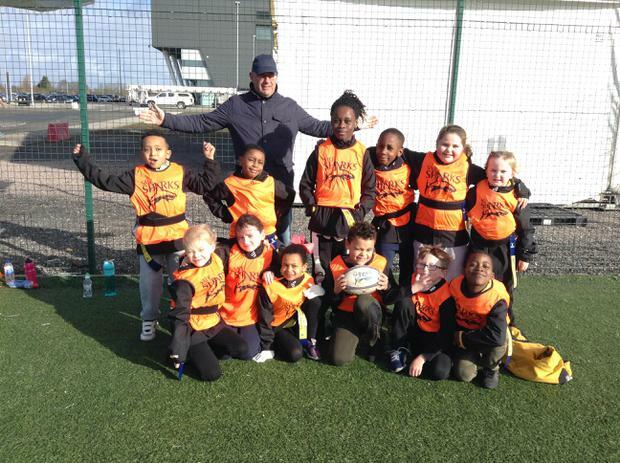 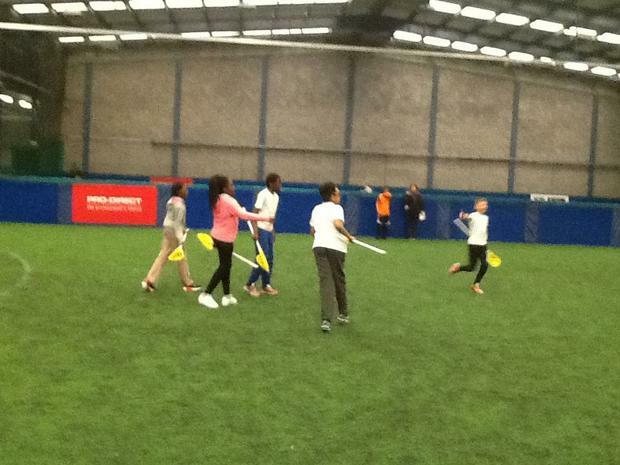 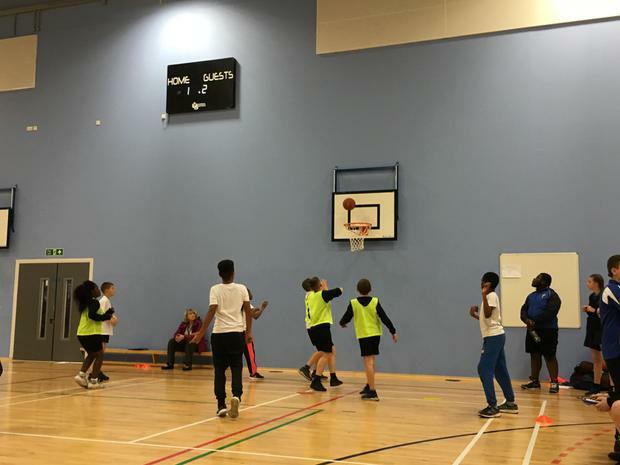 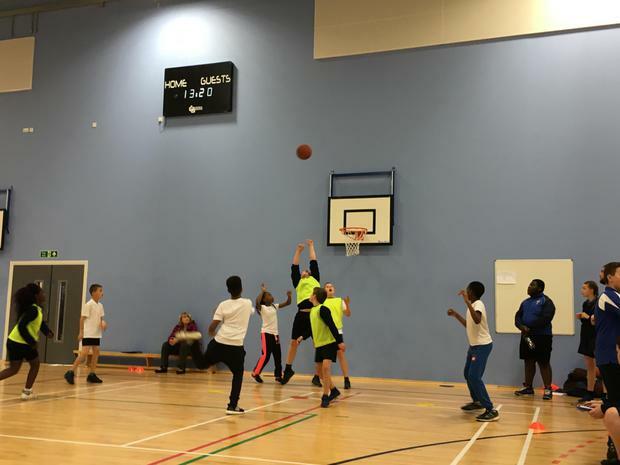 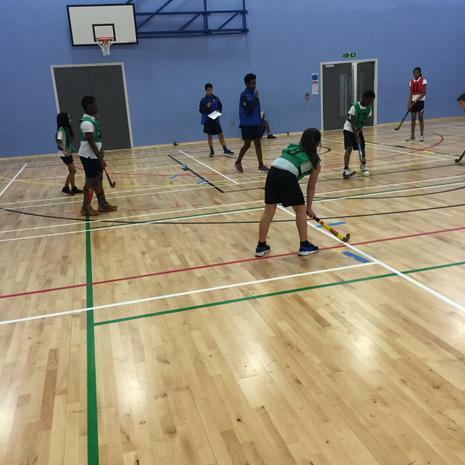 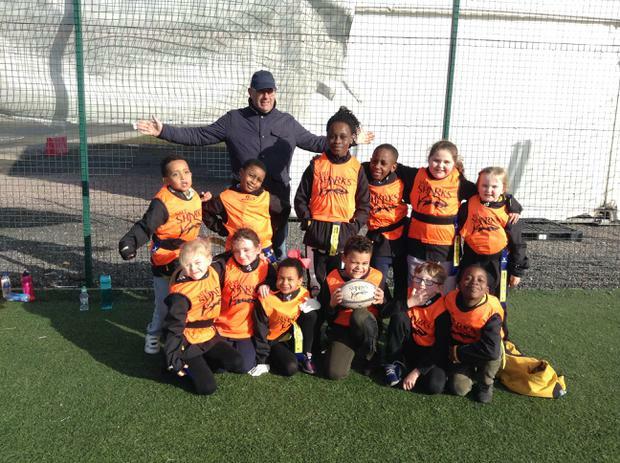 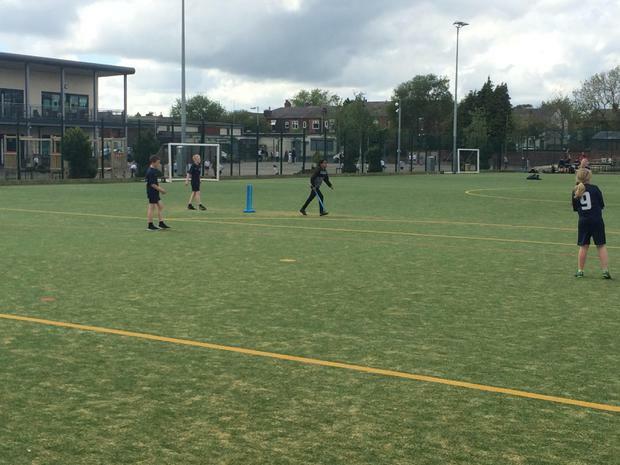 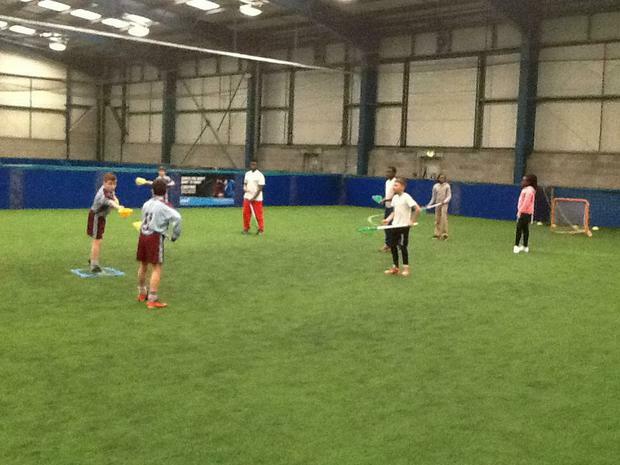 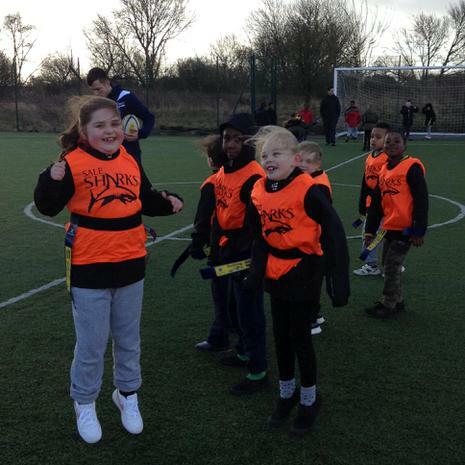 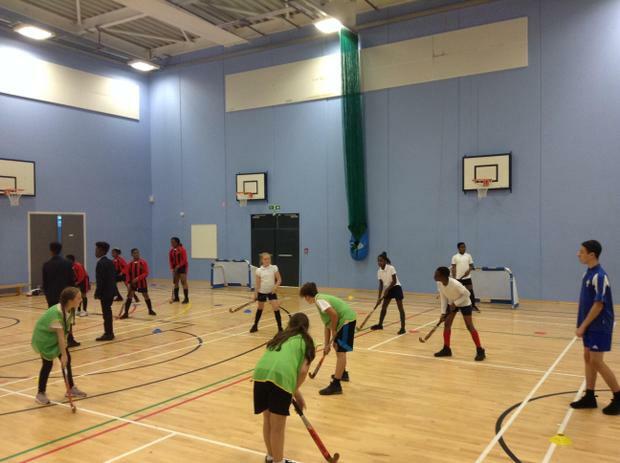 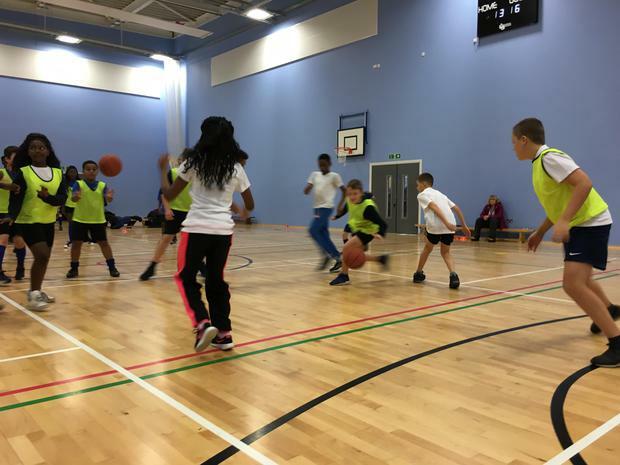 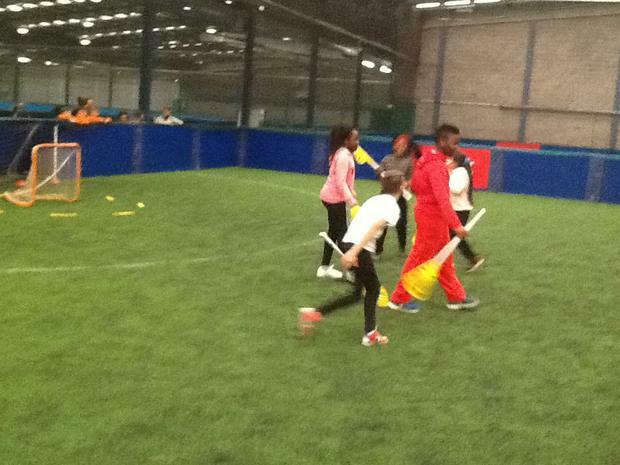 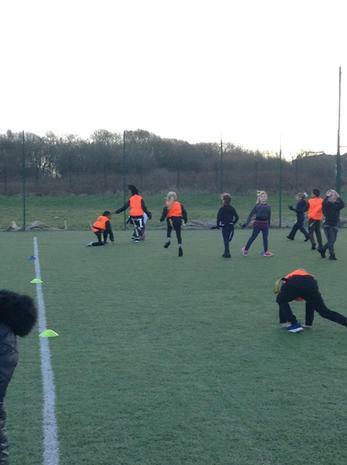 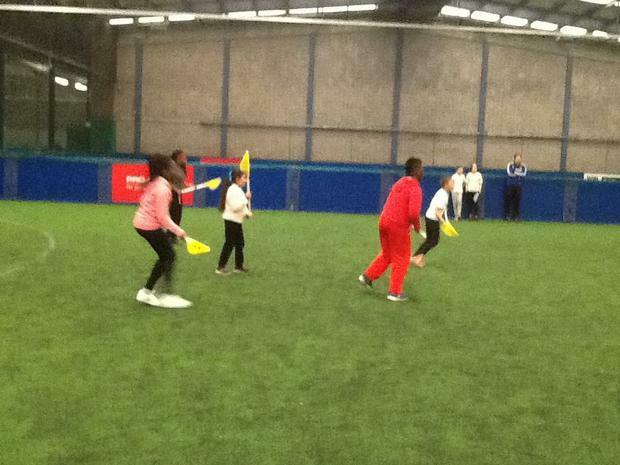 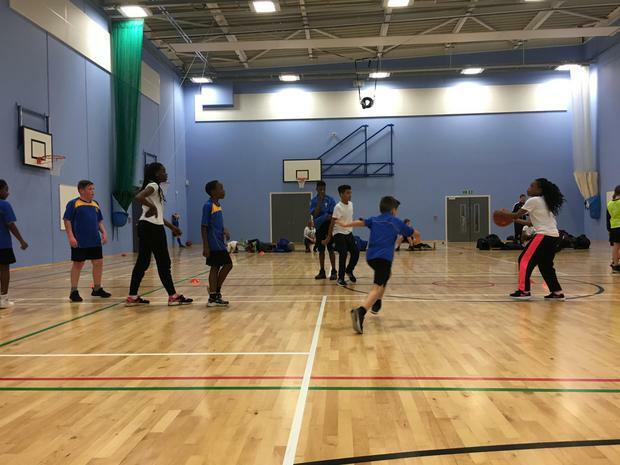 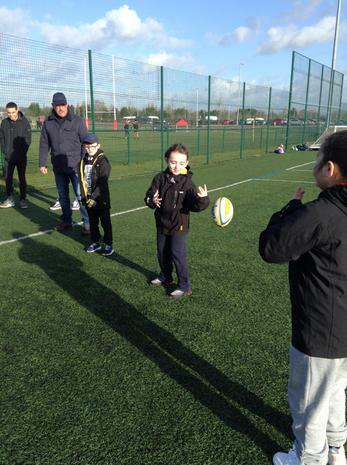 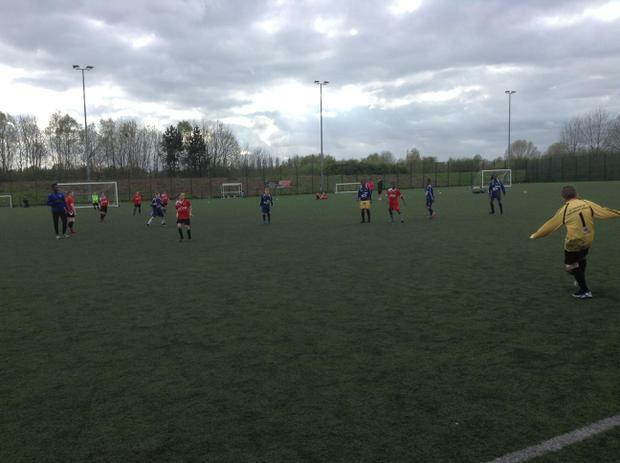 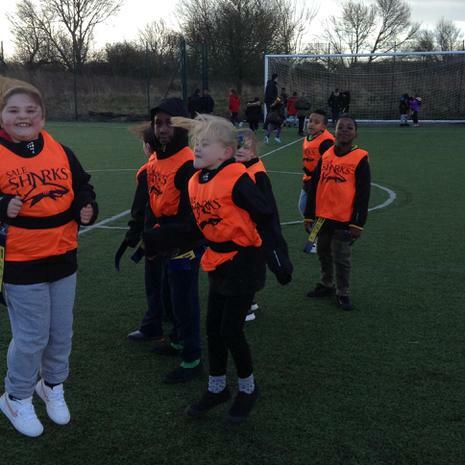 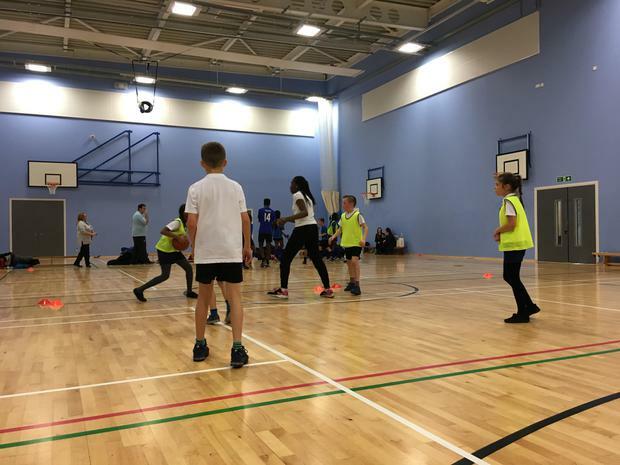 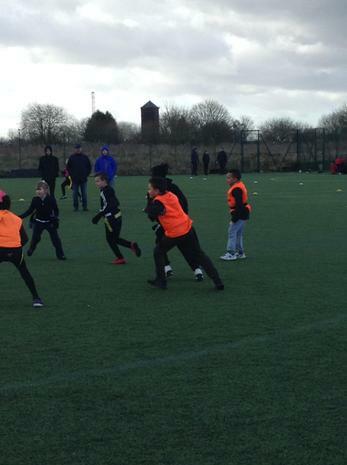 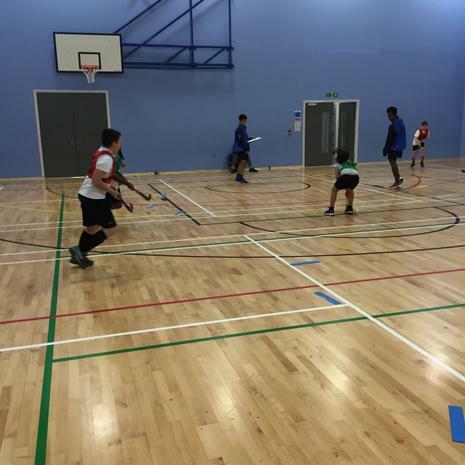 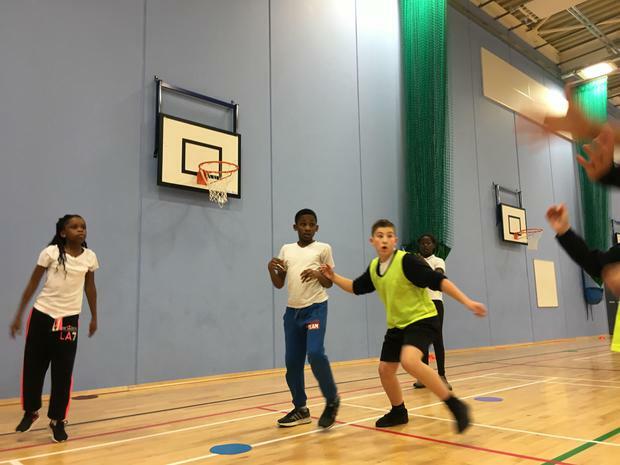 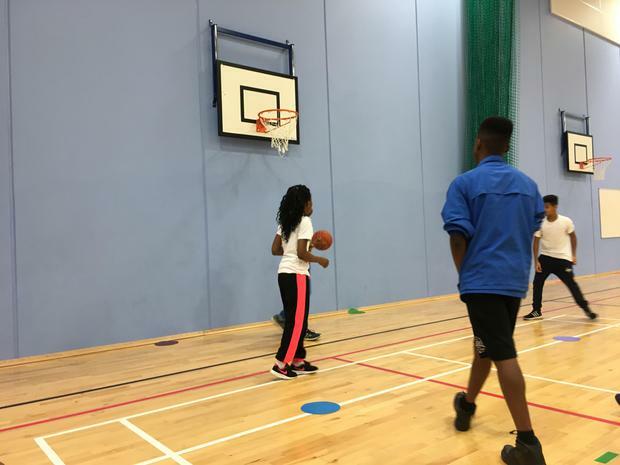 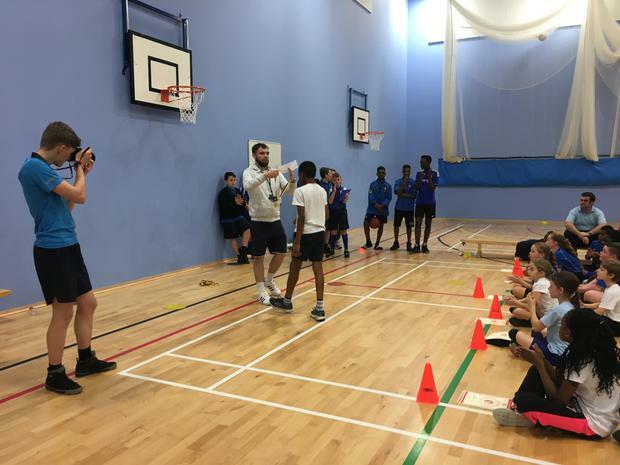 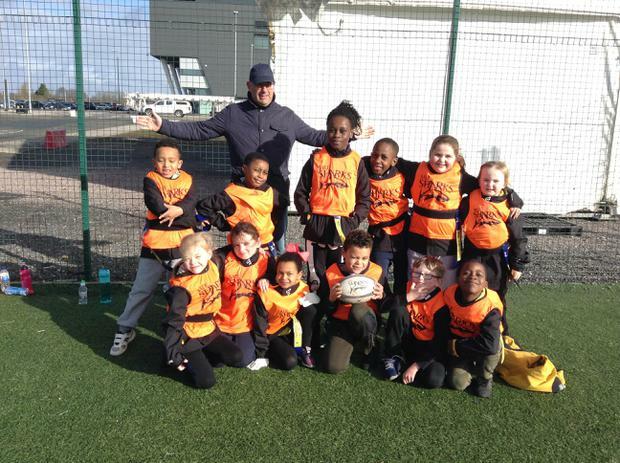 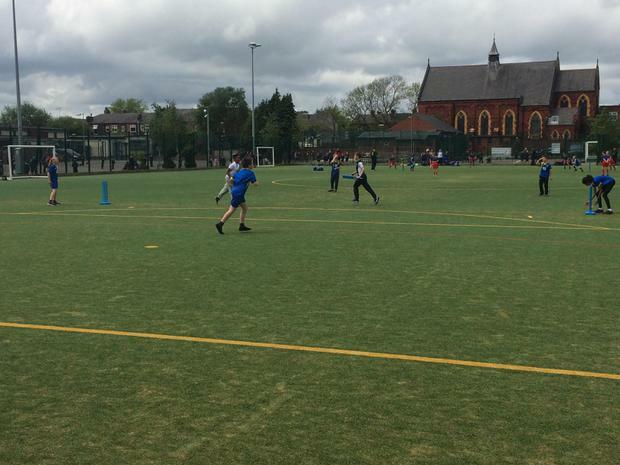 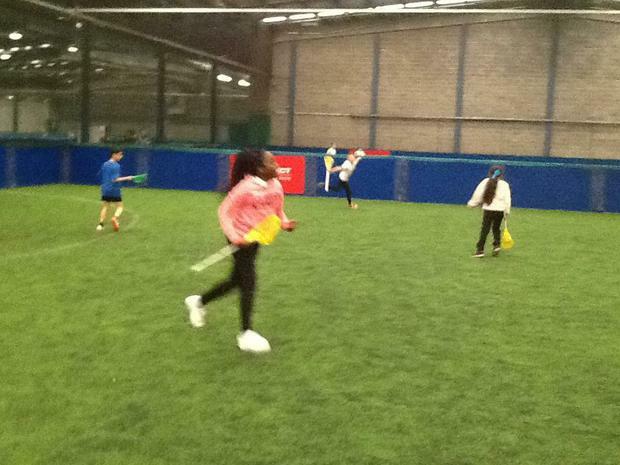 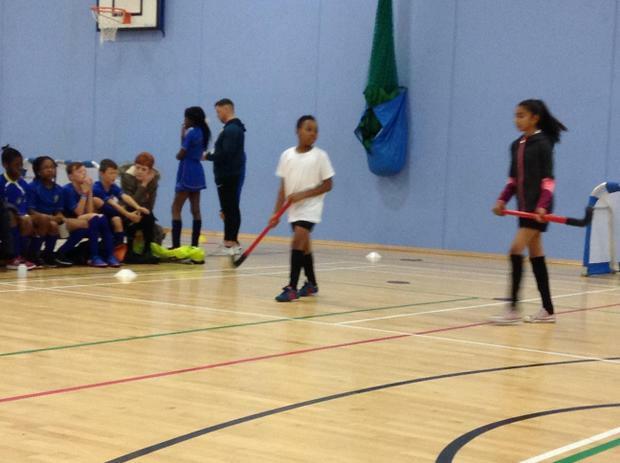 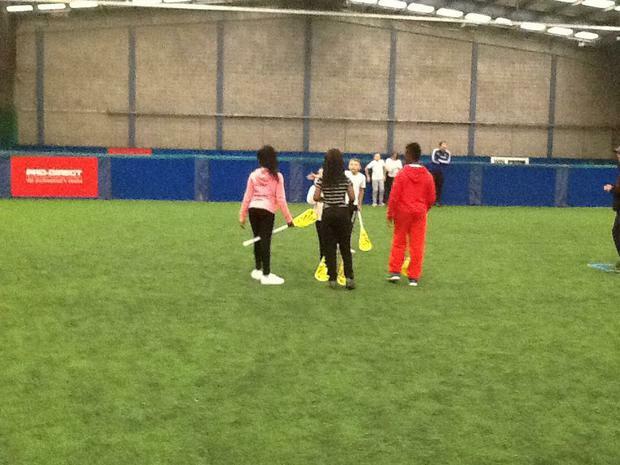 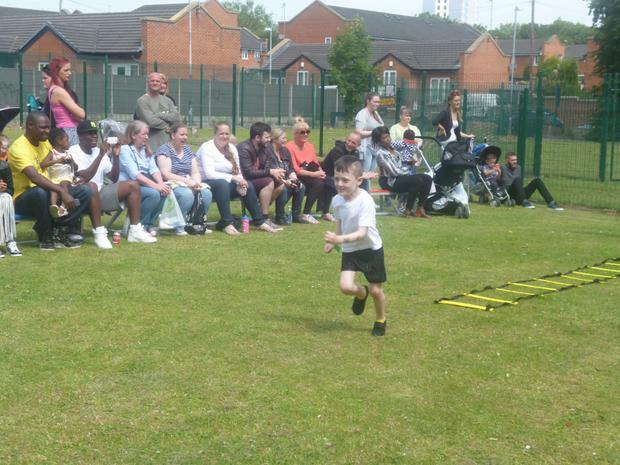 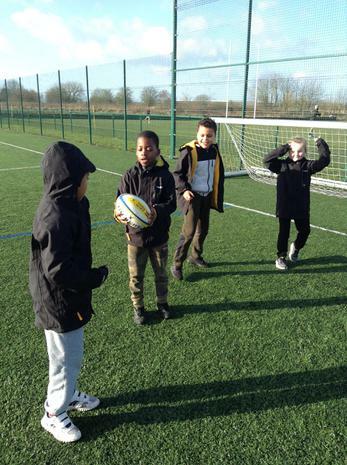 To celebrate World Sport Day and to get into the spirit of the Rugby World Cup, a day of sporting competitions was held at Salford Sports Village recently. 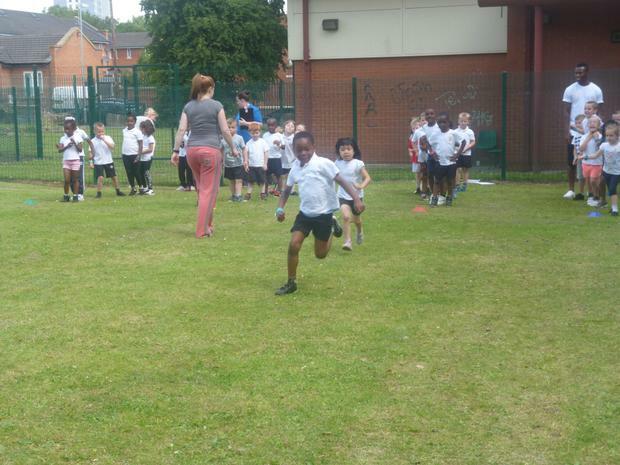 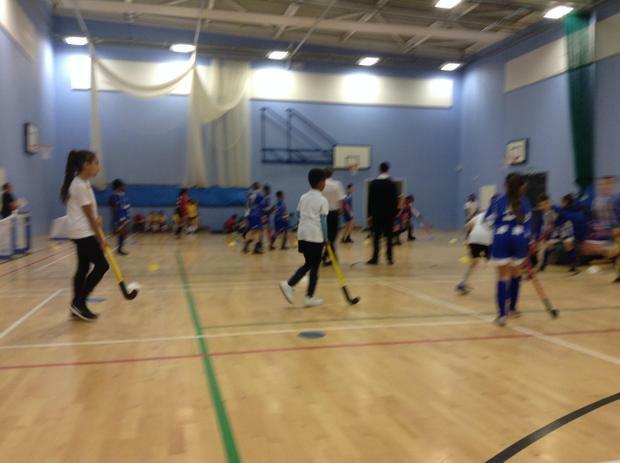 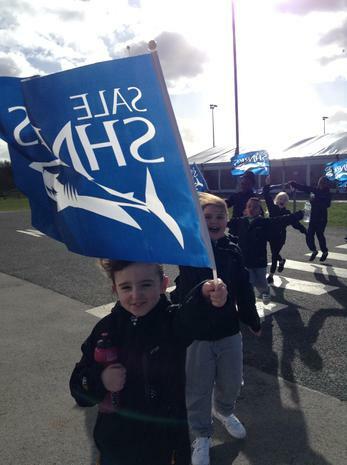 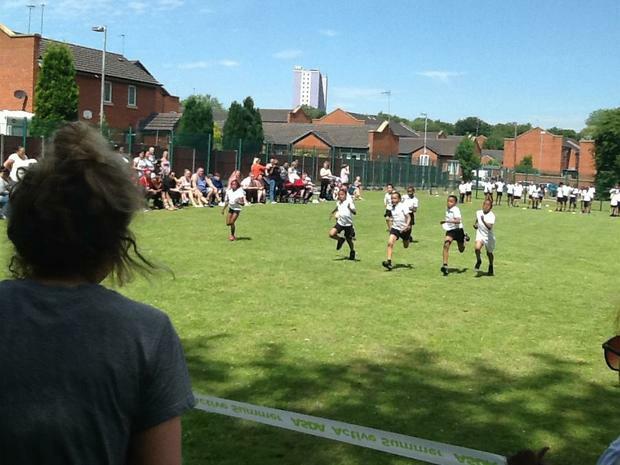 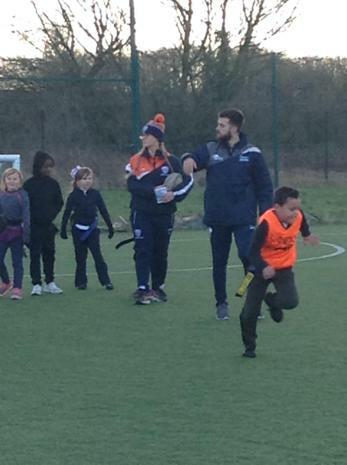 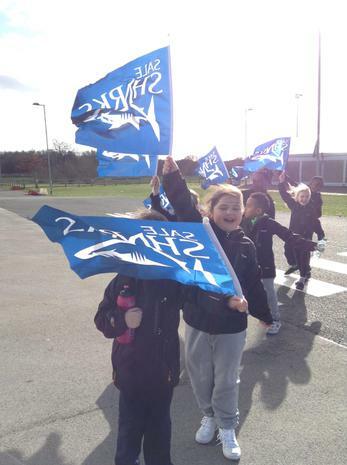 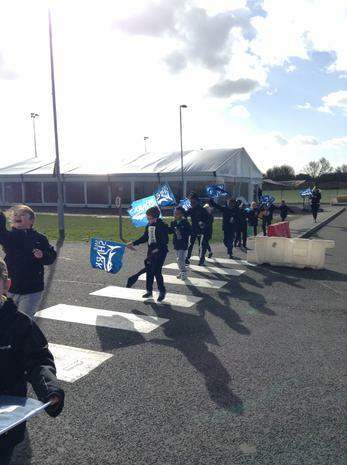 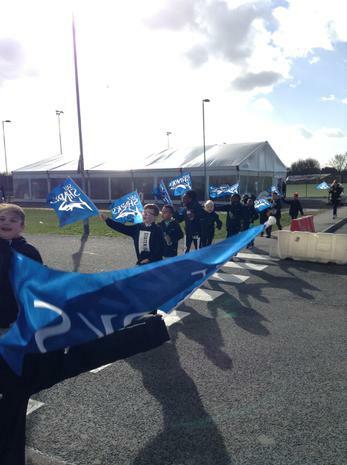 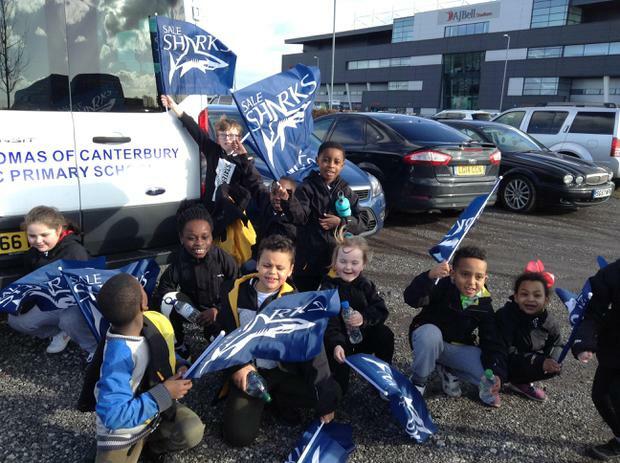 All the children attending had to choose a country from the Rugby World Cup to represent. 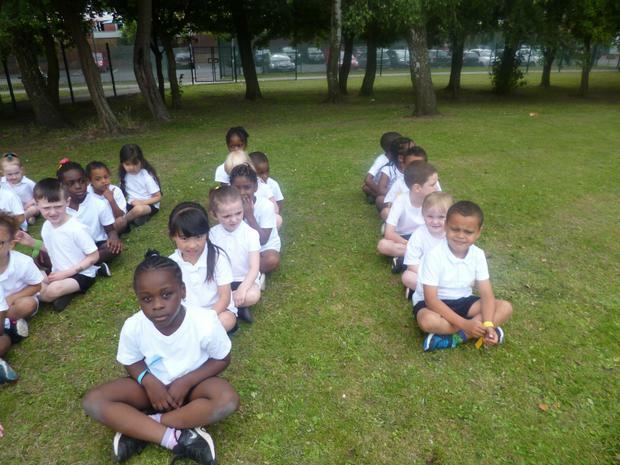 Our school chose The Cook Islands and were aptly nicknamed ‘The St Thomas Cook Islands’! 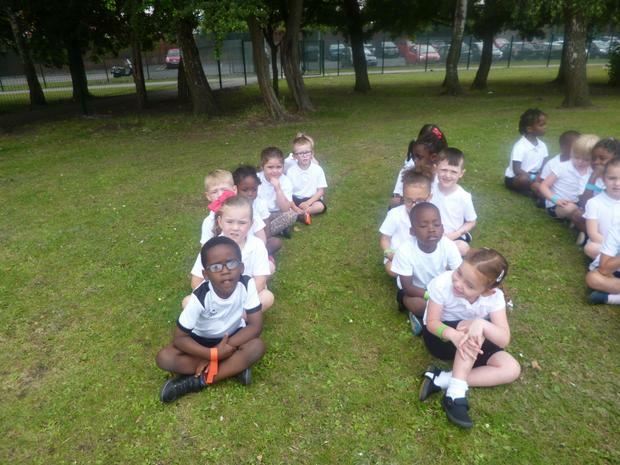 The children dressed in the colours of the Cook Islands flag and researched the country before they went. 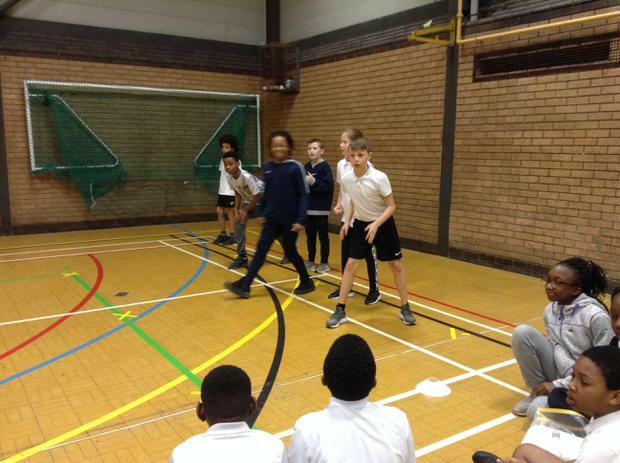 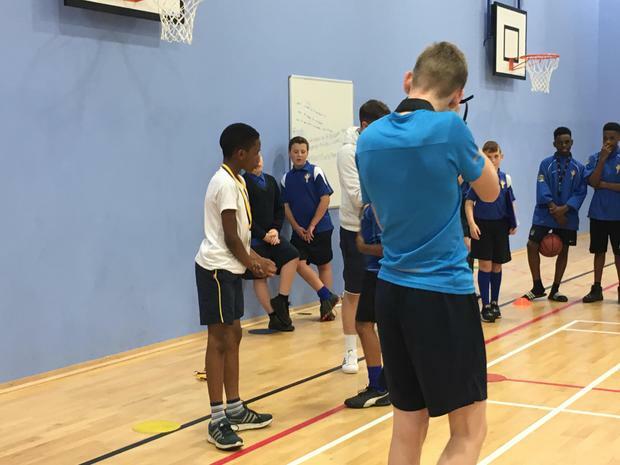 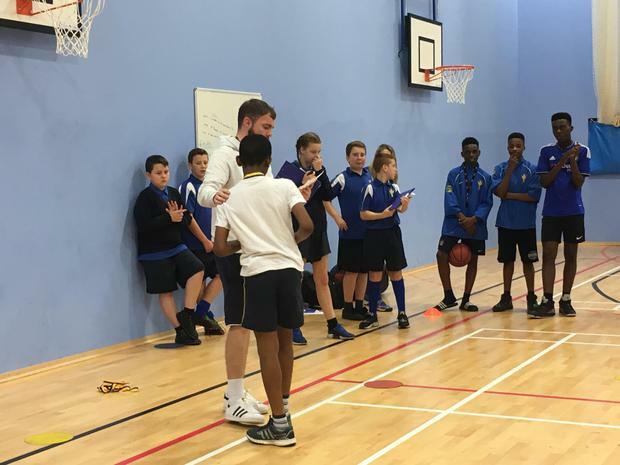 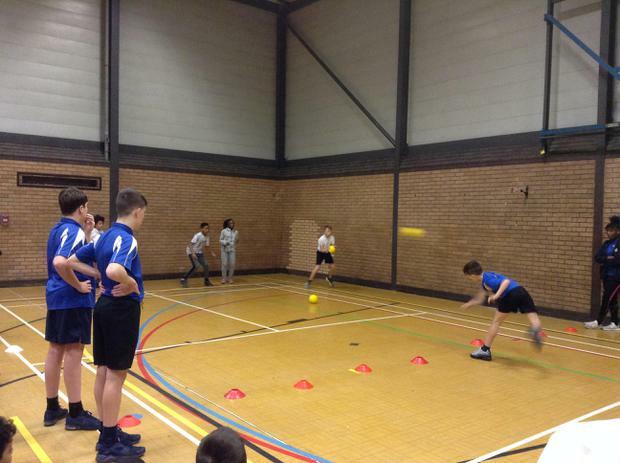 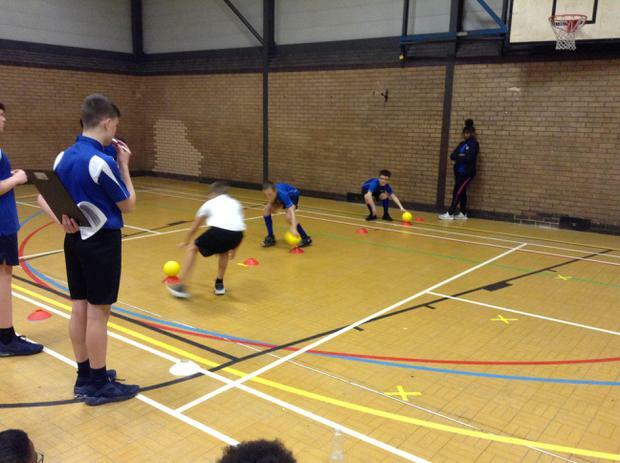 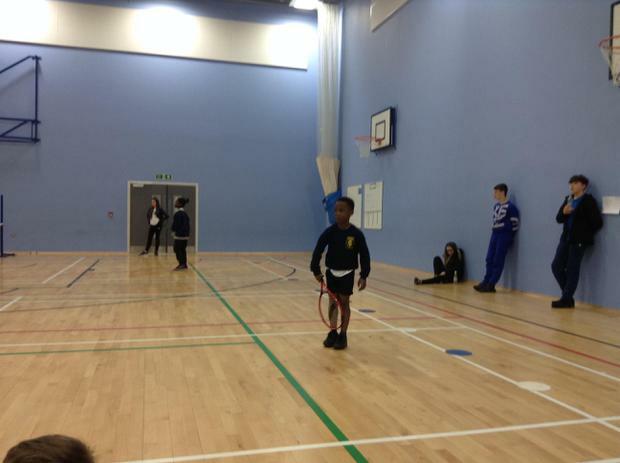 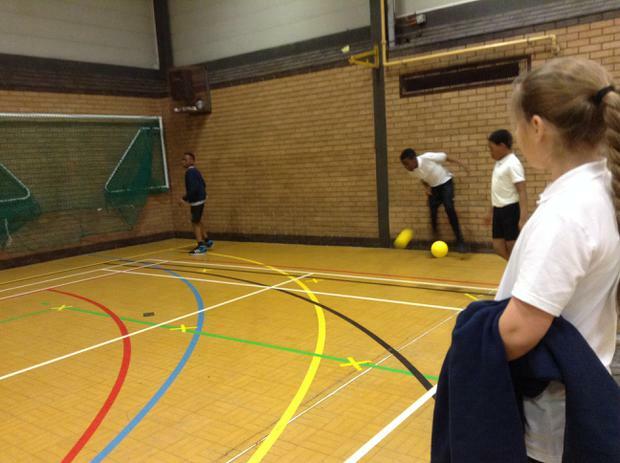 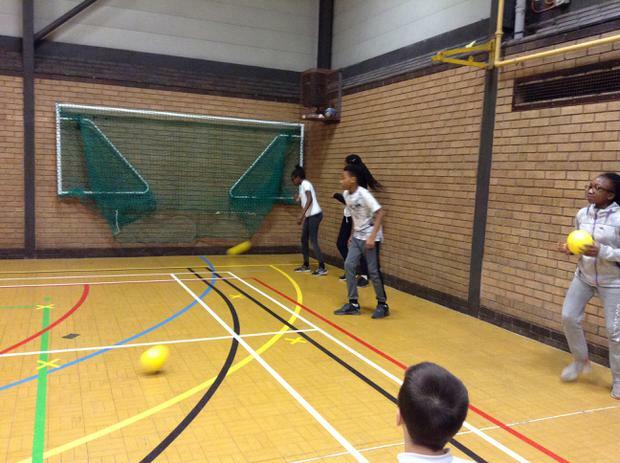 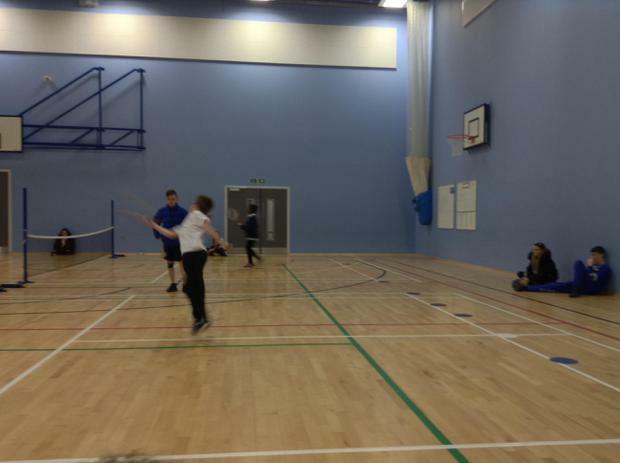 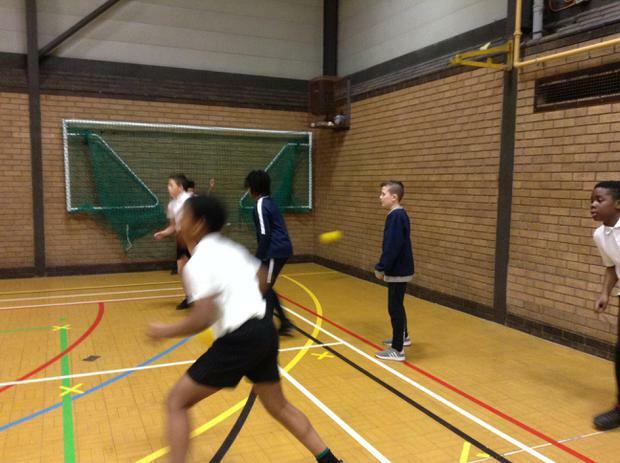 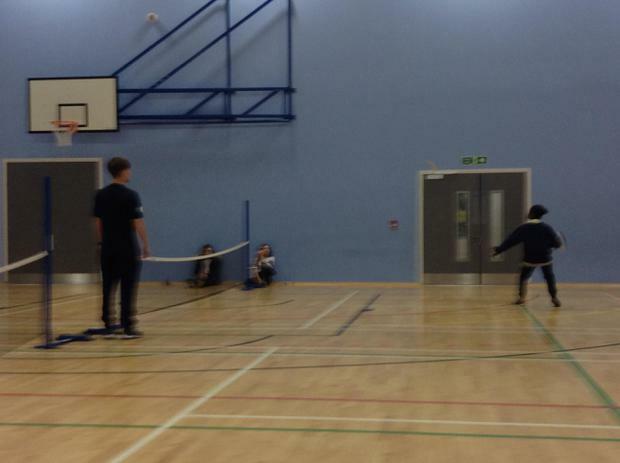 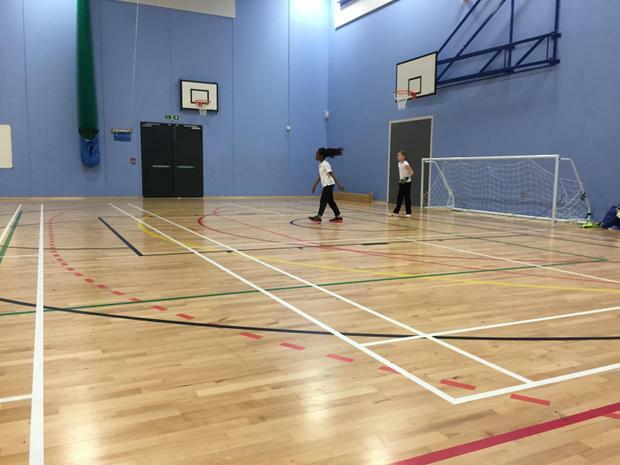 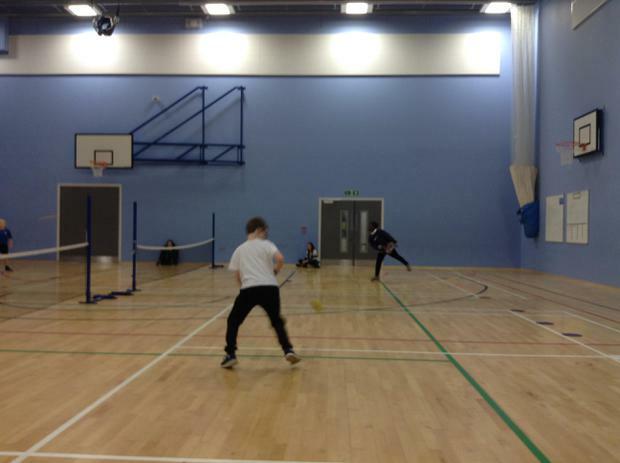 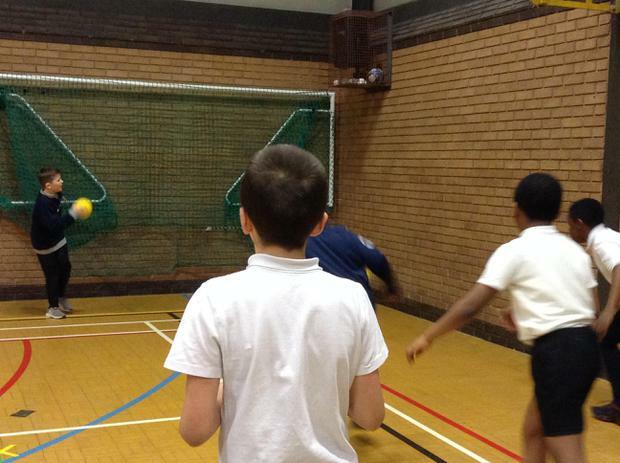 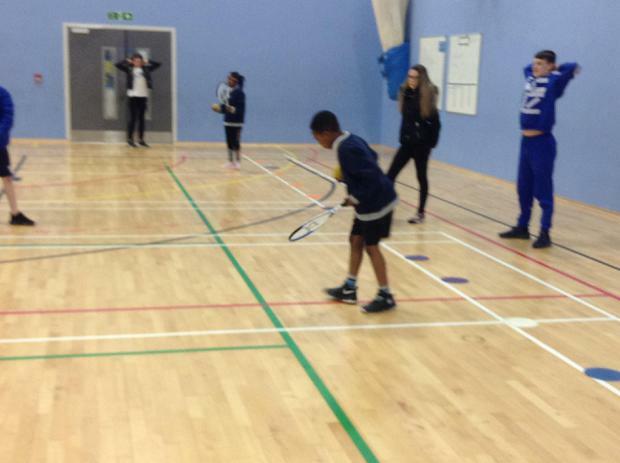 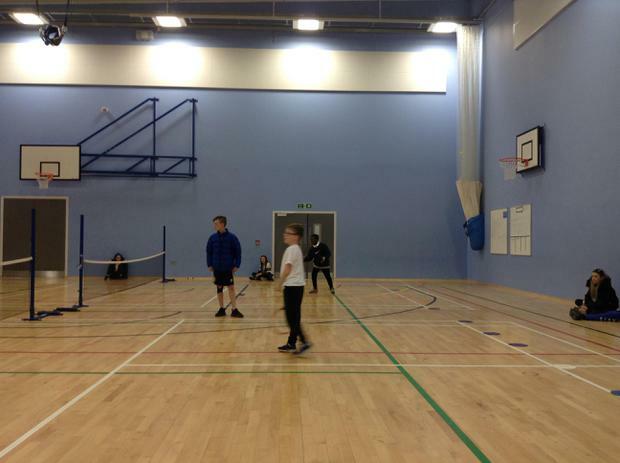 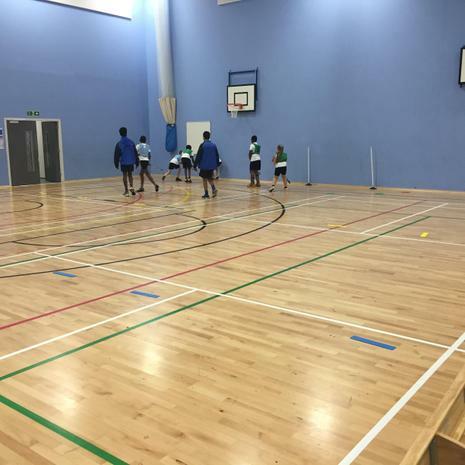 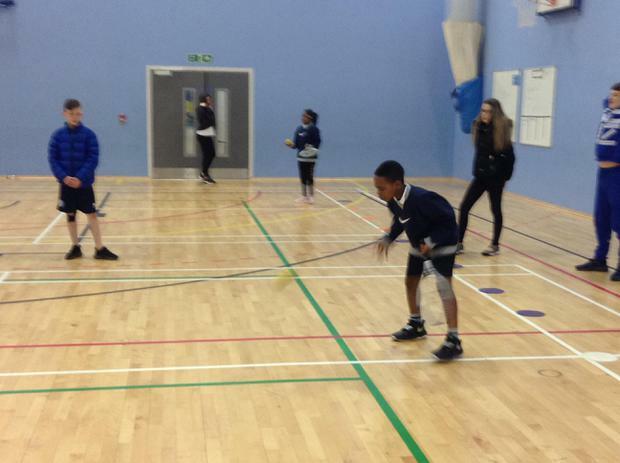 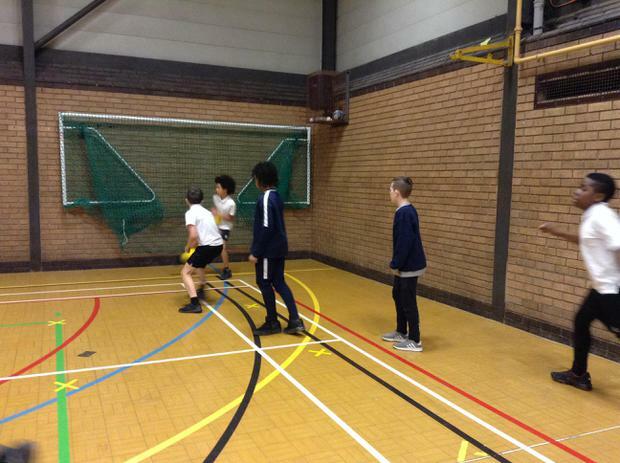 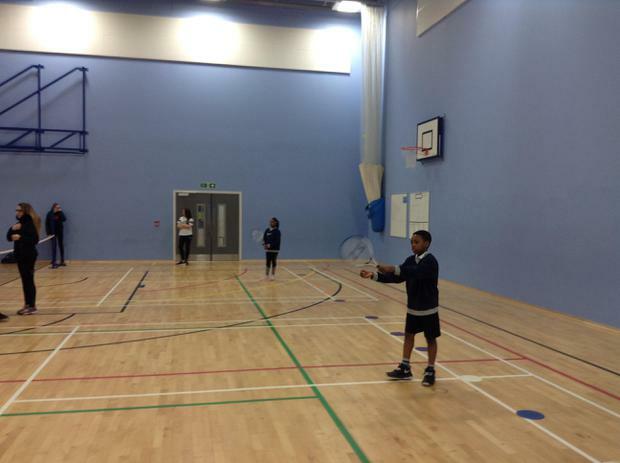 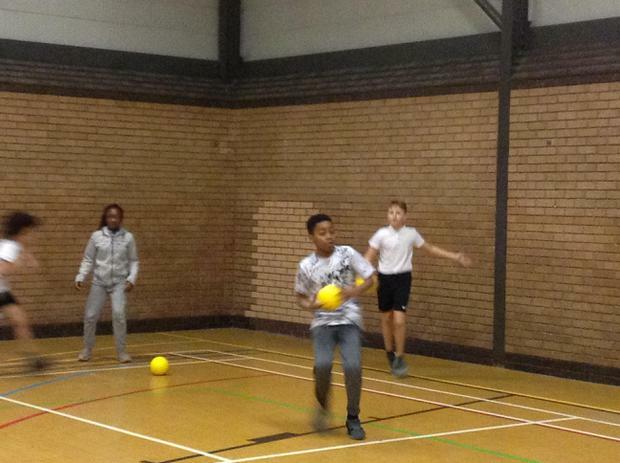 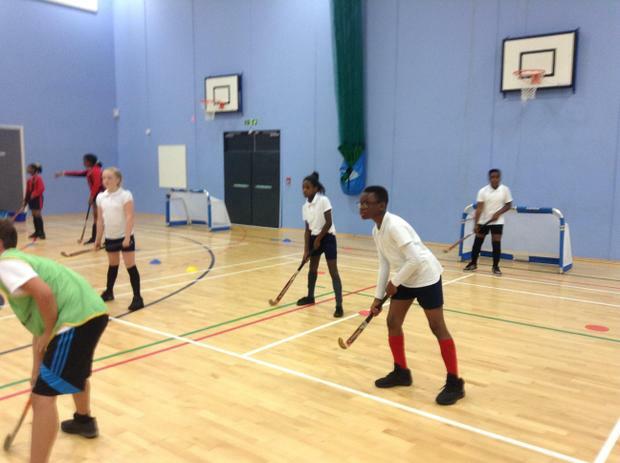 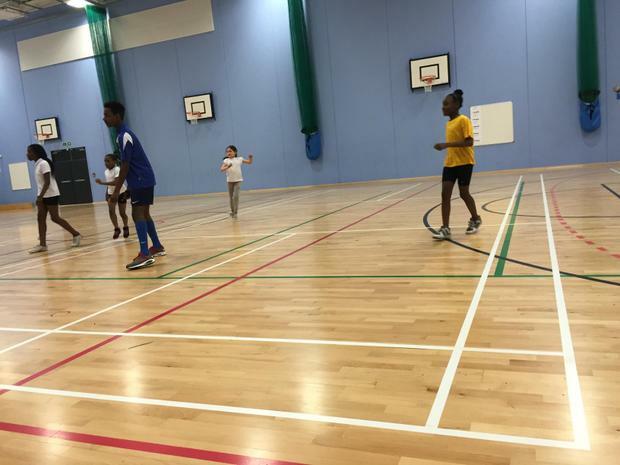 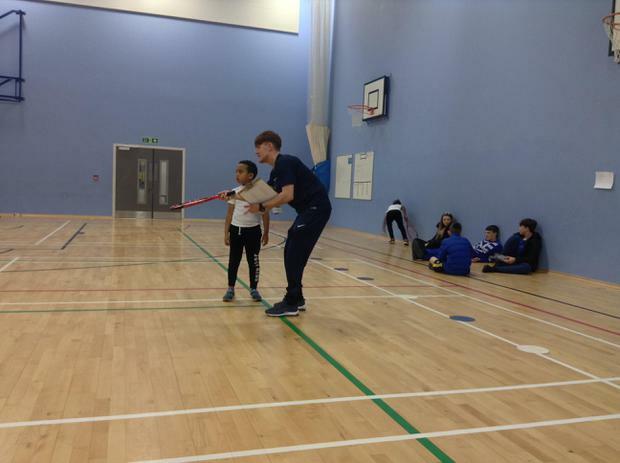 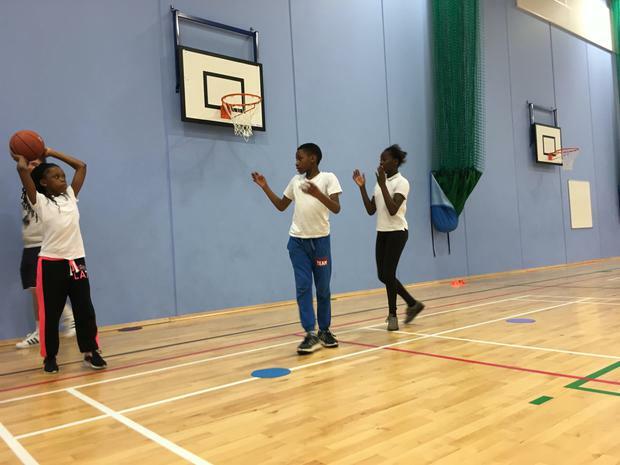 All that attended got to take part in a variety of sporting activities including Golf, Fencing, Goalball and of course Rugby. 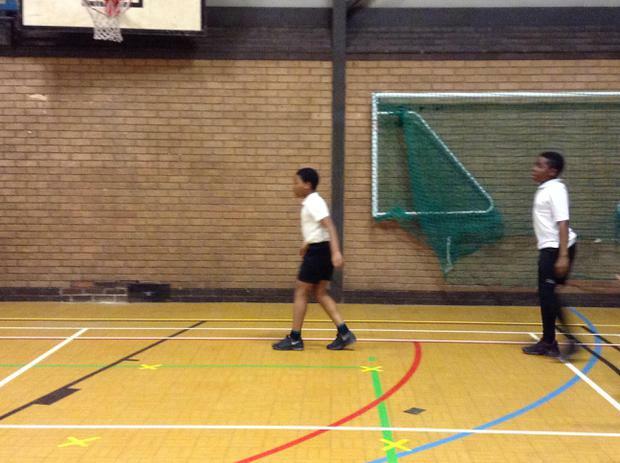 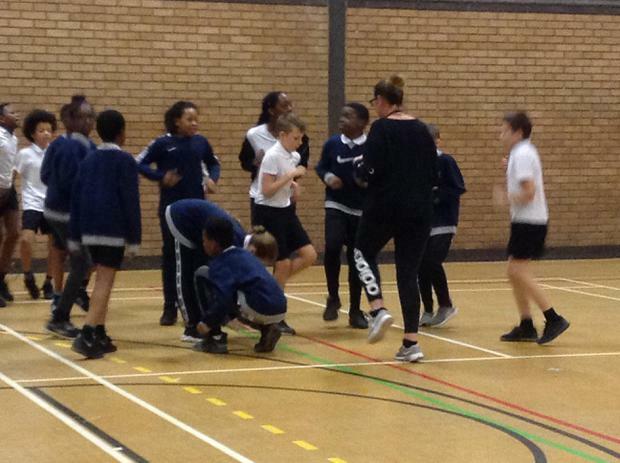 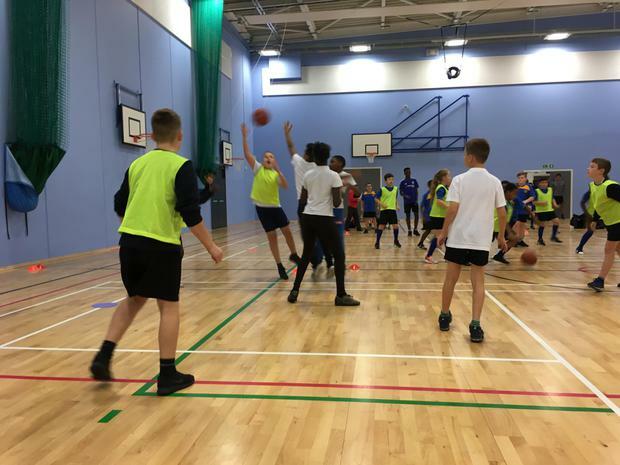 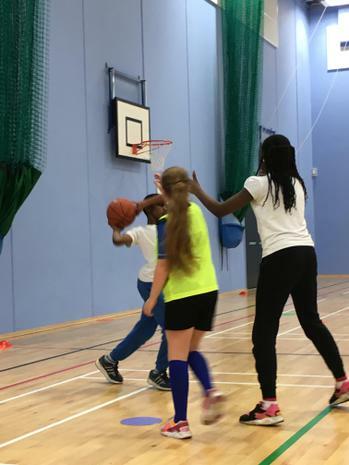 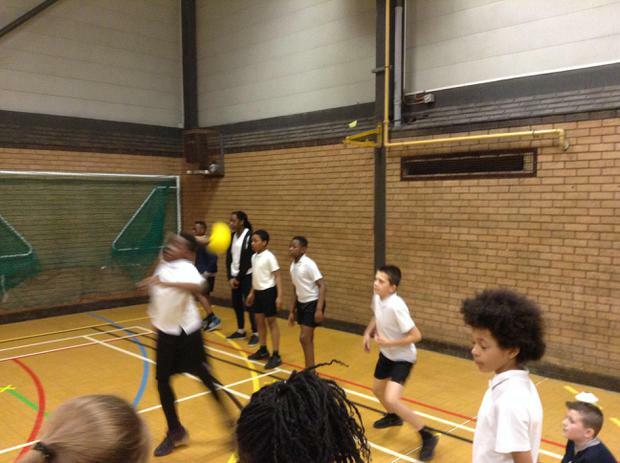 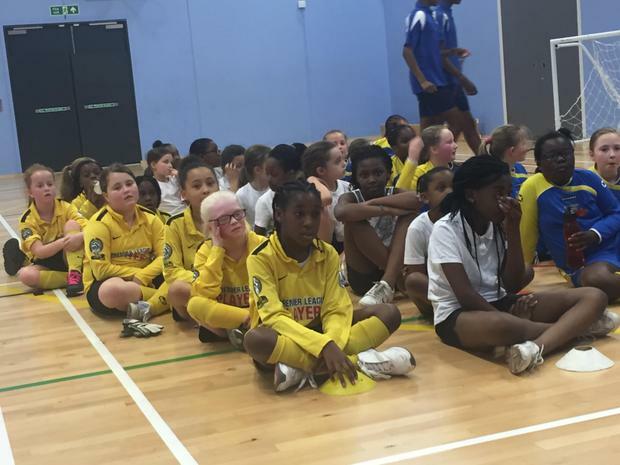 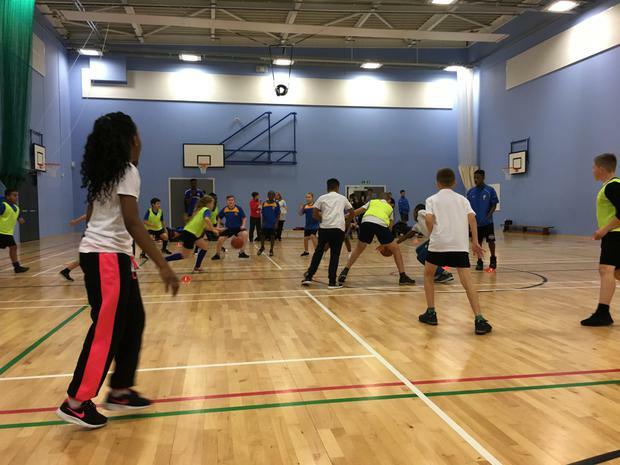 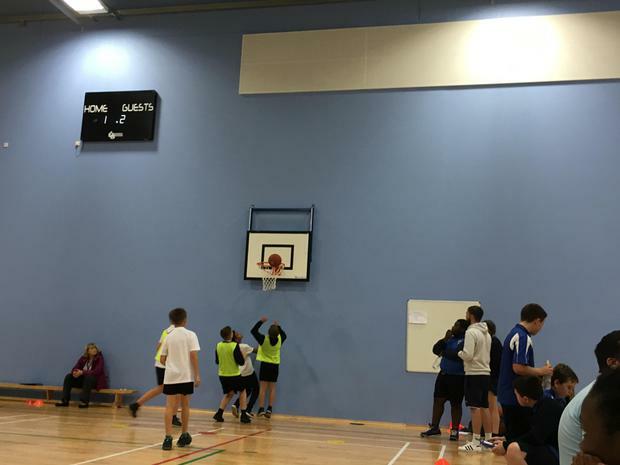 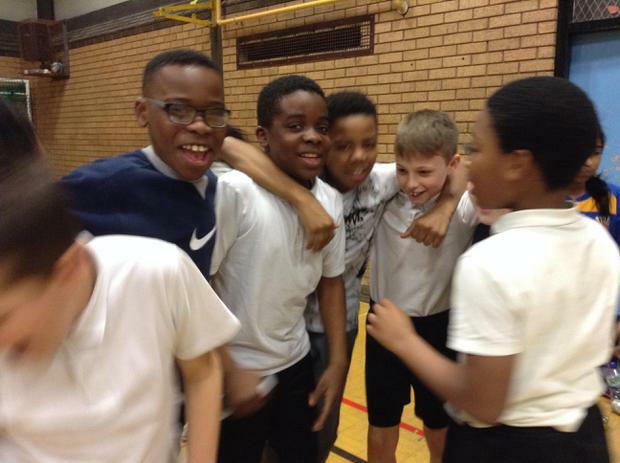 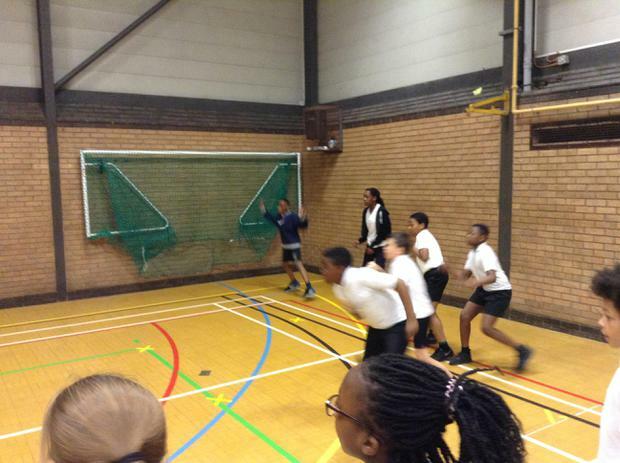 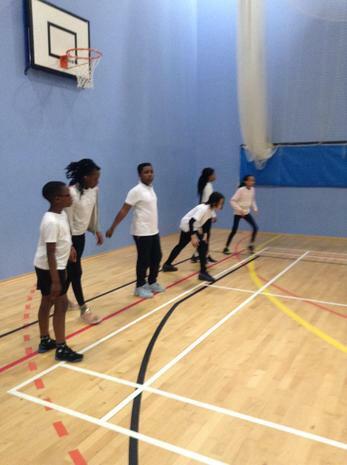 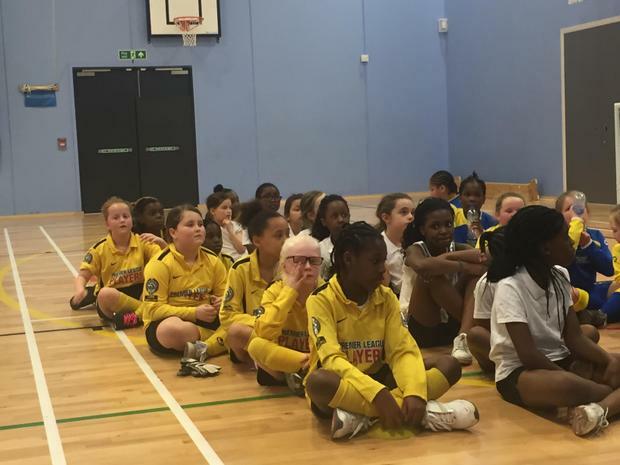 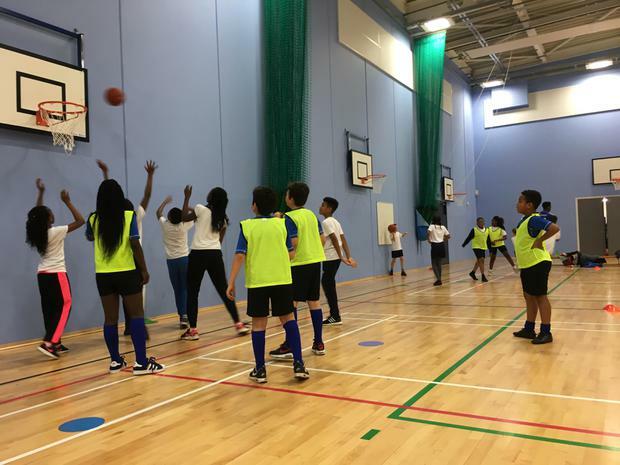 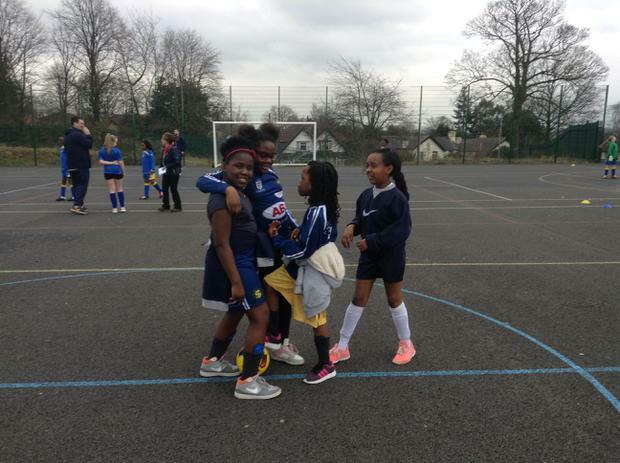 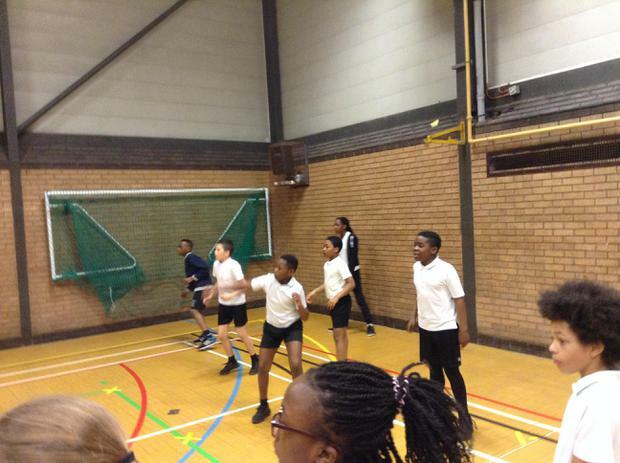 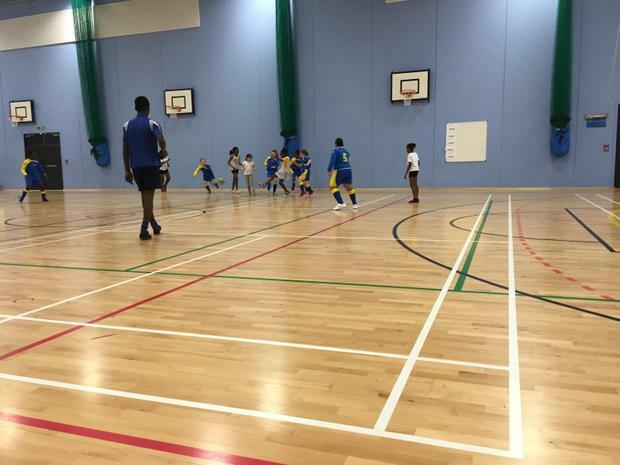 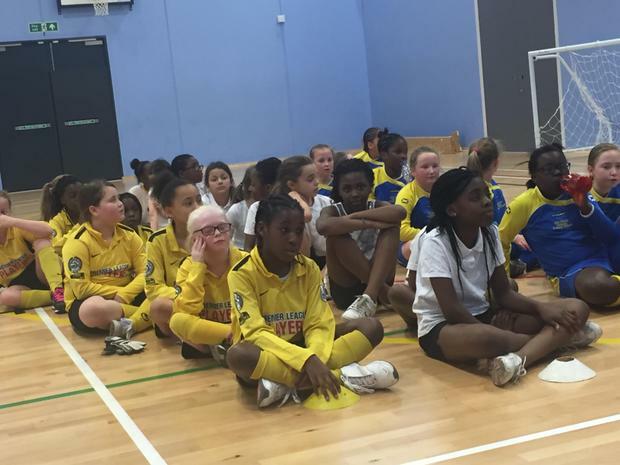 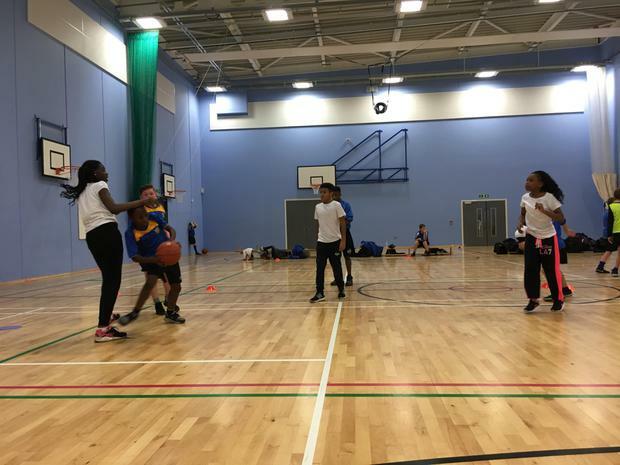 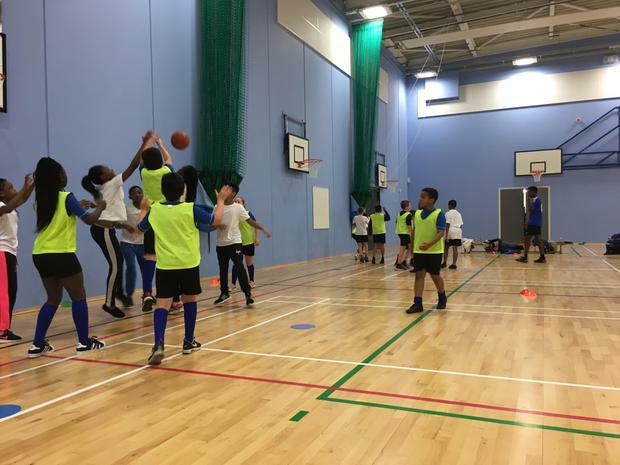 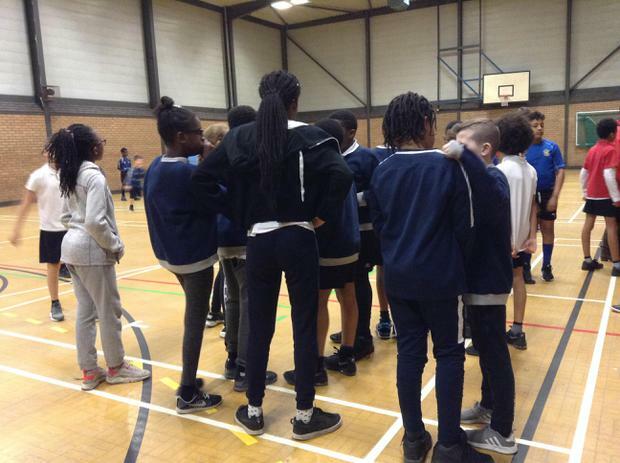 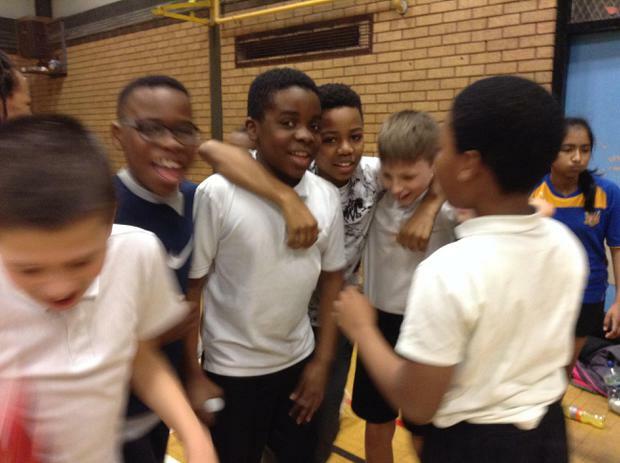 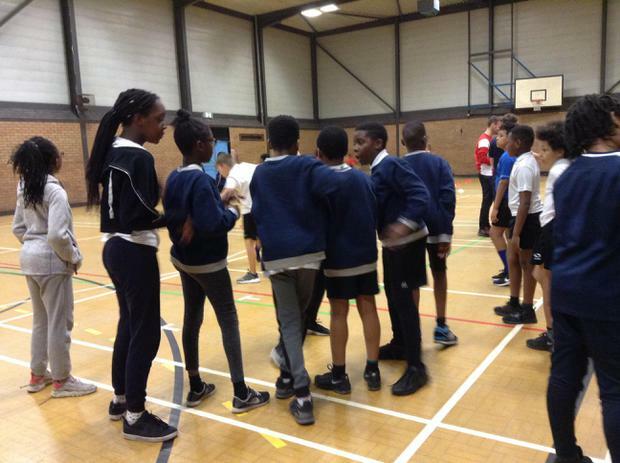 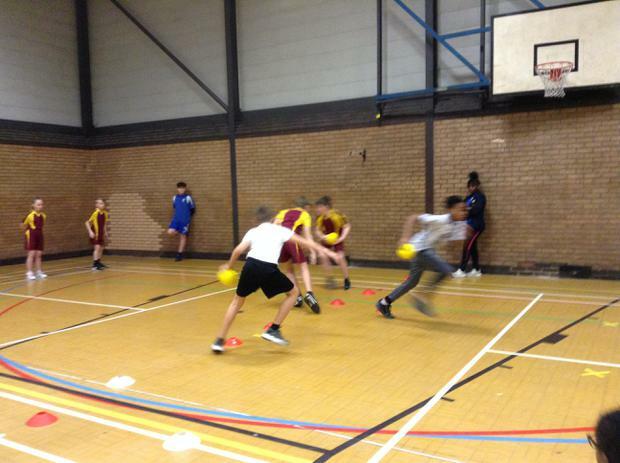 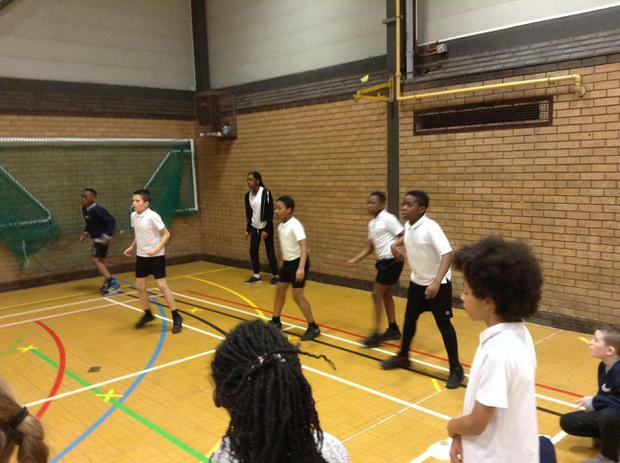 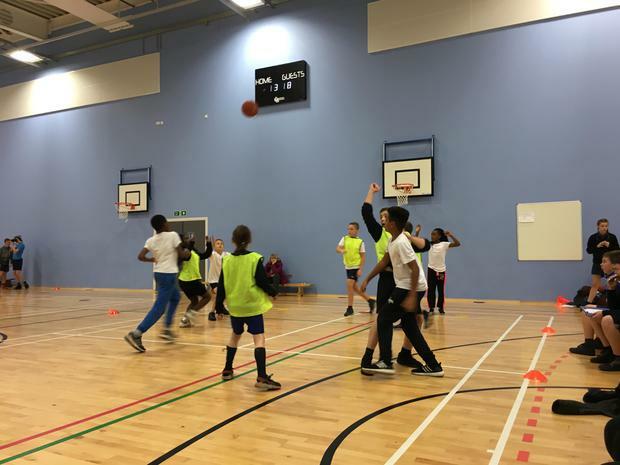 Some of our Juniors recently took part in a Basketball Festival. 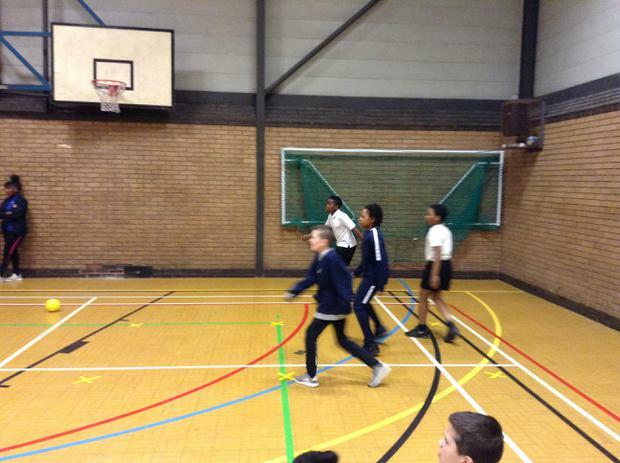 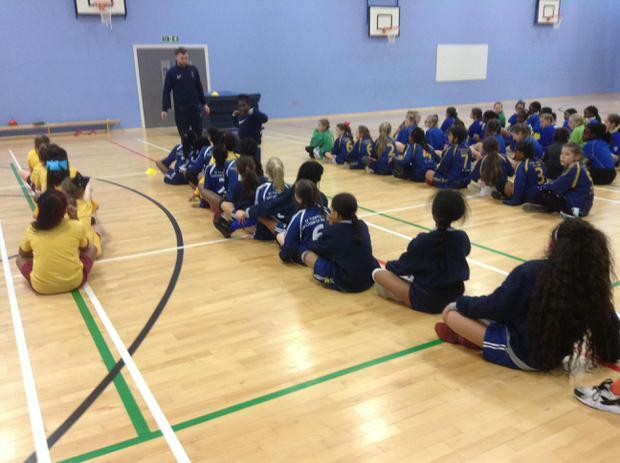 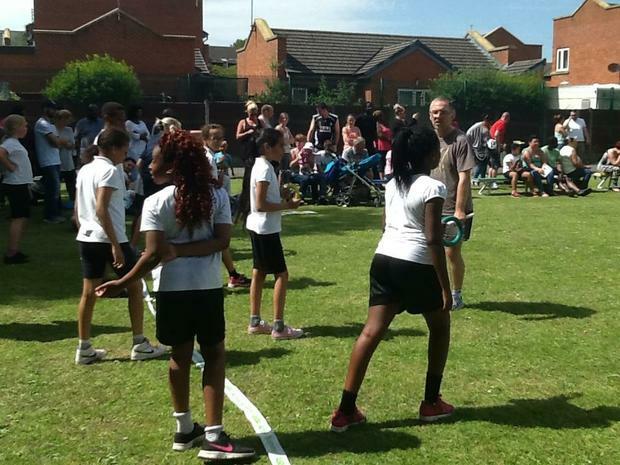 A fantastic day was had by all and the children displayed the skills they had learnt in their Basketball lessons. 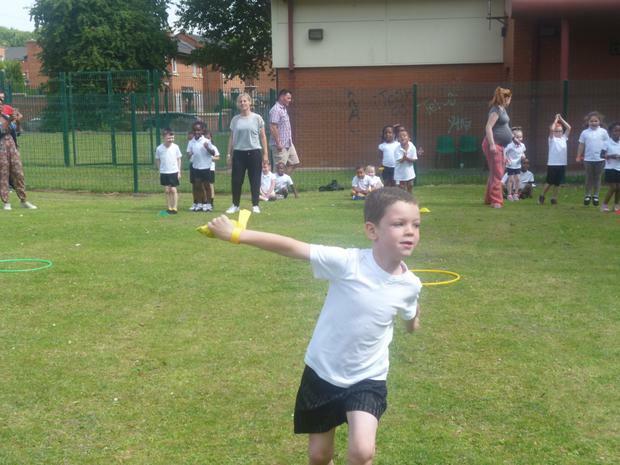 Some of them even impersonated some famous Olympians to help them do well in the competition. 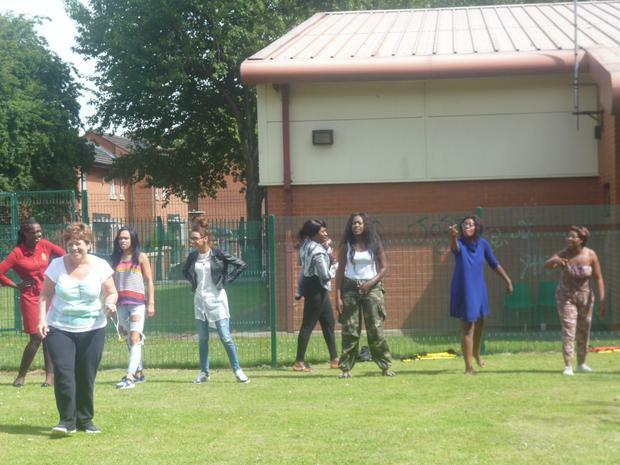 Can you guess which ones? 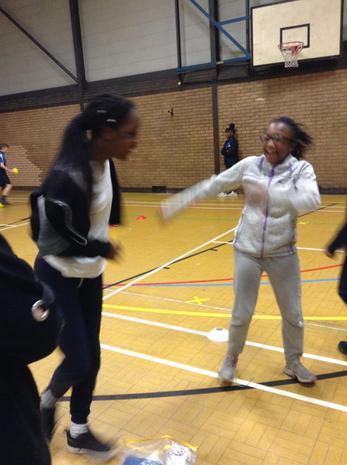 After learning the exotic moves of Zumba for a half term, some of the children in the juniors took part in Zumba Factor! 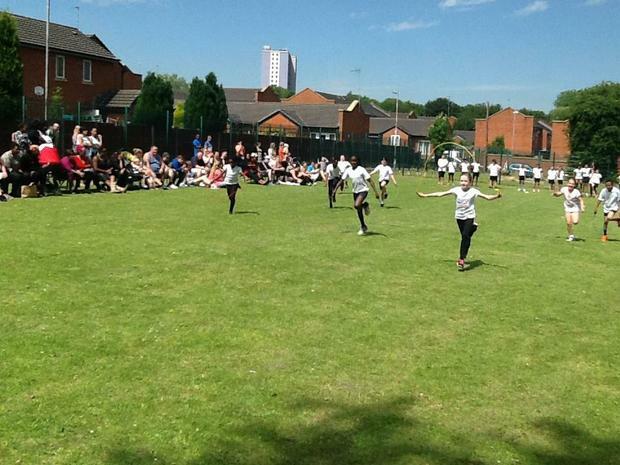 The group dances were fantastic and two of the boys were even awarded individual ‘best dancer’ awards!